The modern traveller, hiker or person about town can still carry or ship the right bag or luggage; a British-made bag, rucksack, suitcase or trunk. In no particular order, here are some great British made bags, handbags, rucksacks, suitcases, wallets, pouches and trunks. 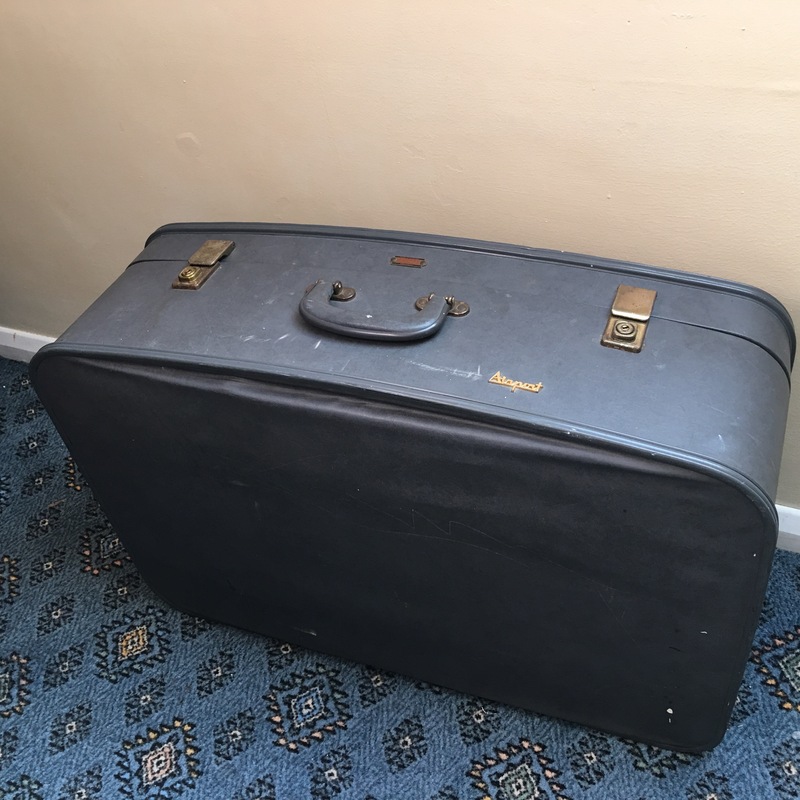 A vintage made in England suitcase. You will find the choice of reasonably priced British made suitcases nowadays to be very small indeed, but there are still plenty of British made bags, overnight bags, luggage tags, trunks, wallets, rucksacks and travel accessories out there. Photograph by author. This entry was posted in Bags, Logicline Trunks Ltd, Luggage, Royal Warrant Holders, Rucksacks, String / Twine / Ropes, Travel, Wallets and tagged 20th Century Cloth, 5 Star Cases Limited, Abel Apparel, Abel London, Abreption, Ace Cafe, Ajoto, Alban bags, Alfie Douglas, Alice Wood, Ally Capellino, Alpha Bushcraft, Alphabet Bags, Alpkit, Amy Britton, Anorak, Anthony and Brown, Applied Thoughts, Aquapac, Ashdown Duffle bags, Aspinal of London, étoile Home, Backpacks, Bag, Bags, Bags-n-Aprons, Bags4Everything, Barabara Wiggins, bebopbag, Bedouin, Belt, Belts, Big Top, Bigxtop, Billy Tannery, Black House Bags, Blenkinsop Leathers, Boarding School Trunks, Bond and Knight, Boxbag, Bradley's, Brady Bags, Brick Lane Bikes, BRIGGS + SHEARS, Brightkidz, British Bags, British Leather Straps, British made Backpacks, British Made Bags, British Made Luggage, British made Rucksacks, British made string, British Made Suitcases, British Made Trunks, British made wallets, Brooks, BVS Design, C.W. Cheney & Son Ltd., Cambrian Woollen Mill, Campbell Cole, Carpet Bags, Carpet Bags of England, Cases, Caseskinz, CGR Bike Gear, Chapman Bags, Charlie Noble, Chase and Wonder, Cherchbi, Chester Jefferies, Ciara Daisy, Cleat, Cleats, Cley Hill, Click for Art, ClickforArt, Coates English Willow, Coin purse, Connell of Sheffield, Cotswold Aquarius, CPL Felthams, Creating Comfort, Crooked as Another, Custom Leather, Daines and Hathaway, Dereks, Dilly Daydream, Donkee Trolleys, Dragon Cases, Duffle bags, Dunmore Scotland, E.P.J. Seymour, eBay, Eleanor’s Attic, Ella Sophie Bags, Emma Burningham, Emma Cornes, England, English Cowhide Company, EQUI-SCUTO, Esther Porter, Ettinger, Eye masks, F.H.Tomkins Buckle Co. Ltd., Fairy Steps, Fernweh UK, Fidelitas London, Field Candy, Fig bags, Fizzarrow, Flightcase UK, Flightcases.com, Foster and Son, Fox and Hardy, Fox and Hardy Trunks, Funky Filly, G1098 Supplies, Gardner of Wakefield, Genesis, Globe-Trotter, Grace Gordon, Grafea, GRIM Bags, H and B London, H&B London, Hanson of London, Happy Oyster, Harrods, Hawthorn Rucksacks, HERITAGE LEATHERGOODS, Hettie, Holdall, Holdall and Co., Holdalls, Honey & Toast, House of Hackney, Intelligent Armour, James Lever, Jane Hopkinson, Jed Phoenix, Jen Made This, JIM BAG, Jinny Wessel, Journeyman Leather, KaboodleBag, kari-me, KD Technic, Kervy Bags, Klobbabags, Knapsacks, L&S Prints, Leather belts, Leather Goods, Levels Basket Centre, Lindon UK, Logicline Trunks Ltd, London Transport Museum Shop, London Undercover, Lone Angler, Lost Kind, Luck Ladybird Craft, Luggage, Luggage Labels, Luggage made in Great Britain, Luggage made in the UK, Luggage Tags, LUXAC, M-24, M.Hulot, M24 bags, Made in England, Made in England Bags, Made in England eye masks, Man Bag, Matt Fothergill, MC Products, Millican, Milomade, Mimi Berry, Montrose Bag Company, Montrose Rope and Sail Company, Monty, Moquette, Morgan + Wells, Mossman Trunks, Mountain White, Mowbray Leather Goods, Mulberry, N'Damus London, Natthakur, Natural History Museum, Nicholson and Walcot, Note-case, note-cases, Nu-Red, Nuwold, ODD, Original Peter, Otis Batterbee, Oyster Card holders, P. Ogden, PackaPouch, Packing Tips, Papworth Travel Goods, Passport Covers, Passport Jackets, Paul Newell Sails, Pauline Lothian, Pickett, Pittards, Plastic Passport Covers, Poli & Jo, Poli and Jo, Ports and Awl, Pouches, Price Western, Proflight Bags, Protect-a-Badge, Purple Patch Workshop, Purses, Putnams, Q.G.L Ltd, Quality Gunslips, Rangemaster, Raw Leather Workshop, Ray Mears Bushcraft, Reef Tide, Reefer, Regray, Ropesource, Rose and Rebellion, Rowan Stickers, Rucksacks, Rucksacks made in the UK, Rural Kind, RUXX, Sail Handmade, Samantha Warren, Samuel Wilkes Engineering Ltd., Satchel Central, Scott Fraser, Sea Salt Cornwall, See-through passport covers, Sholley Trolley, Sidewinder Apparel, Small Castle, Small Leather Goods, SodaKitsch, Sophie Fleming, Sourced, Sprigasaurus, St Leonards, Steven Harkin, String, Suitcase, Suitcase stickers, Suitcases, Susie Faulks, Swaine Adeney Brigg, Tanner and Oak, The Cambridge Satchel Company, The Dartmouth Canvas Factory, The English Trunk Company, The Jet Rest, The Leather Satchel Co, The Leather Warehouse, The Little Clutch Bag Company, The Pattern Guild, The Saddlebag Trading Co, TheJetRest, This is a Limited Edition, Thomas Ware, Thorndale, Today I’m Me, Tom Brown's Satchels, Tombag, Trakke, Travel Accessories, Travelling Chest, travelwallet.co.uk, Trove, Trunk, Trunki, Trunks, Tuck Box, Tuck Boxes, Tura, Tusting, Twine, Twool, UK Baggage, UK Luggage, UK Made Luggage, UK made rucksacks, UK Made Suitcases, UK Made Trunks, UK made wallets, UK Suitcases, UK Trunks, Umpie, Under Cover, useuk, Victoria Eggs, VVA, Wallets, Wallets made in England, Wallets made in the UK, Weldon Bags, Wetkama, Whitehouse Cox, Wilkes, William & Irene, Williams Handmade, Woodwards Leather, Wyatt and Jack, Yoke Shopper, Z Leather Works, Zatchels, ZPM on January 1, 2014 by ukmade. British Made Umbrellas, Walking Sticks and Shooting Sticks. Umbrellas made in the UK. An umbrella (or brolly) is used to keep off the rain or the sun. A parasol more often than not is a term used for an umbrella designed to shade people from the sun and unlike a rain umbrella may not be waterproof. Umbrellas are widely used in the UK, Japan and elsewhere. You can get full sized umbrellas, folding umbrellas, travel umbrellas and the larger golf umbrellas, plus work umbrellas and garden umbrellas. It is generally recognised that London has been the home of the best umbrellas and walking sticks and to some extent that tradition is carried on today, although the majority of umbrellas sold in the UK are made in China nowadays. It is sadly the case that to the best of my knowledge there are no umbrellas made entirely in the UK any longer. There are companies like those below claiming to sell “Made in the UK” umbrellas, but actually all the umbrella frames (the key component of any umbrella) are manufactured in China. One might take the view simply attaching a canopy or handle (neither of which are of UK origin in some cases) in the UK does not make it genuinely “Made in the UK”. You might consider getting a vintage British umbrella from somewhere like eBay, a charity shop, an antiques shop or a car boot sale but these are often in need of rather lot of work before they might be presentable. There is a buoyant and sometimes expensive market in secondhand English umbrellas on eBay. This entry was posted in Awnings and Blinds, John Steed and the Avengers, London Undercover, Mountain King, Outdoor Gear, Royal Warrant Holders, Swaine Adeney Brigg, The PEERLESS Umbrella Company, Turnbull and Asser, Umbrellas and tagged Abbeyhorn, AEL Solutions, Ally Capellino, Awnings and Blinds, Bond, Brigg, Brigg Umbrella, Brightkidz, British Made Shooting Sticks, British Made Umbrellas, British Made Walking Sticks, British Umbrellas, britishumbrellas, Brolly, Classic Canes, climate, Deans Blinds and Awnings, Drake's London, English Umbrellas, Fox, Fox Umbrella Frames, Fox Umbrellas, Fox Umbrellas Ltd., Fulton, Garden Umbrella, Go Promotional, Hickston, James Bond, James Ince, James Ince and Sons, James Smith and Sons, John Steed and the Avengers, John Steed's umbrella, Lissom and Muster, London Undercover, Love UK Made, Made in England Umbrellas, Mountain King, Mycroft, Nuwold, Parasol, Peerless, PEERLESS Umbrella Company, Rain, Samuel Fox, Samuel Fox and Company, Seat Sticks, Sherlock, Shooting Sticks, Steed, Stick or Solid Umbrella?, Sun Umbrella, Swaine Adeney Brigg, T Fox & Co. Ltd., The Brigg Umbrella, The Great British Umbrella, The PEERLESS Umbrella Company, The Umbrella Company, Thomas Fox, Tirion Seat Sticks, Tube, Turnbull and Asser, UK manufacturers of umbrellas, Umbrella, Umbrella Stand, Umbrellas, Umbrellas Made in England, Umbrellas made in Great Britain, Umbrellas made in the UK, Vintage British Umbrella, Walking Sticks, William Hoyland on September 14, 2013 by ukmade. Sub Zero outdoor gear – made in England (well most of it) / Fleece Jackets / Ussen, etc. Performance Thermal Underwear, Thermal Baselayers, Thermal Midlayers, Fleece and Waterproof Jackets. This entry was posted in Fleece Jackets, Ladieswear, Menswear, Outdoor Gear, PHD Mountain Software, Skiing / Snowboarding, Sub Zero Clothing, Underwear and Swimwear, Wool and tagged Brightkidz, Childrenswear and Baby, Fairfield Clothing, Fleece Jackets, Fleeces, Ladieswear, Made in England, Menswear, Outdoor Gear, PHD, Private White VC, Ramblers Clothing, Sarah's Fleeces, Sub Zero Clothing, Sub Zero outdoor clothing, Ussen on May 20, 2013 by ukmade. British made airplanes, tanks, ships, aero engines, helicopters, trains, tractors, construction machinery, JCBs, London taxis, buses, coaches, specialist vehicles, coach-builders, vans, lorries (trucks), ice cream vans, caravans, motorhomes, campervans, cars, and related products. British made car parts and motor accessories. Transport. UK made cars. British made vehicles. Cars made in the UK, etc. I’m not sure if many commercial planes are made in the UK now. Military ones are made by companies like BAE (who have brought companies like Vickers and Alvis*; BEA Systems is the combination of British Aerospace (BAe) and Marconi Electronic Systems ( MES)). They also build tanks and ships. Rolls Royce still make aero engines in the UK. Westland (now Agusta Westland) still make Helicopters in the UK. Wings for Airbus are still made in the UK (owned by EADS – European Aeronautic Defence and Space Company). American company Lockheed Martin also make military equipment in the UK including I think things like tanks, helicopters and armoured vehicles. Swift Aircraft was founded in 2004 and hopes to make a new light training and aerobatic aeroplane n the UK by the end of 2018. Also building aircraft in the UK are BJJR building the Bulldog autogyro (possibly made in Britain; they don’t really say on their website), C.M. Microlights of Norfolk (possibly made in Britain; they don’t really say on their website) who in 2017 suspended production, Medway Microlights who say on their website they hope to commence production on-site at Medway Microlights of Rochester of a microlight aircraft, ProAirsport Limited / Go Fly Aircraft who hope to produce a Microlight Aeroplane which will be built in the UK, P&M Aviation (Mainair Sports / Pegasus Aviation) microlight aircraft of Manton, Marlborough, Wiltshire (possibly made in Britain; they don’t really say on their website), and EuroFOX which is a microlight aircraft assembled in the UK. TAG Paramotor Dealers UK say on their Google summary “our paramotors are hand built in Yorkshire to the highest standards using Minari 180CC engines and Sunglider wings” – a Paramotor is the generic name for the harness and propulsive portion of a powered paraglider – unfortunately (as of 9 Feb 2018) their website is not working so I was not able to ascertain any more information about this company. The last train and tube train maker is apparently foreign owned Bombardier and it seems they are in trouble (is this because the UK government buys trains from Germany? ), although Japanese company Hitachi will be making or at least assembling trains at a factory in Newton Aycliffe near Darlington from 2016 it seems. Bombardier also make executive jets and aircraft engine casings in Northern Ireland, the Canadian aerospace firm having purchases the world’s first aircraft manufacturer, Short Brothers in Belfast, from the government in 1989. As of February 2016 Bombardier in Northern Ireland is looking to cut at least 1,000 jobs and ship much production to seemingly cheaper locations in the developing world. Bombardier already have factories in Mexico and Morocco. 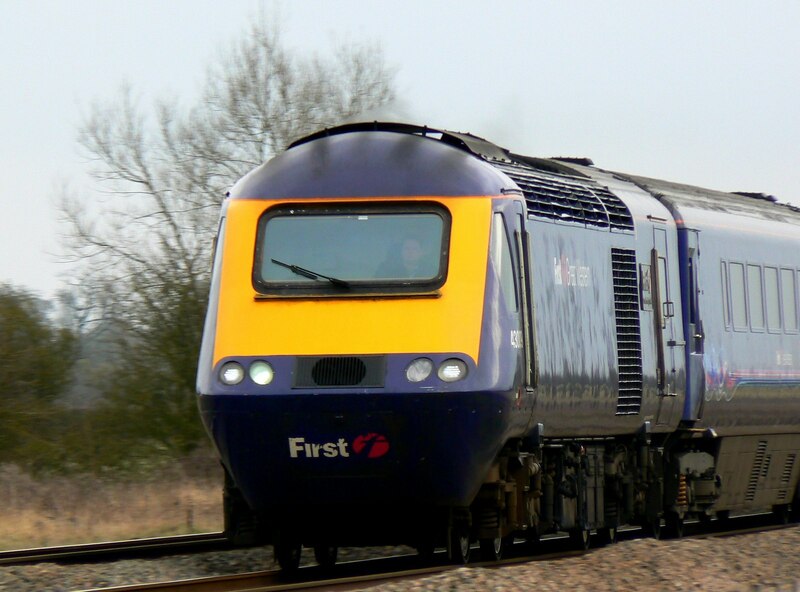 HST 125 (High Speed Train) going west near Shrivenham, Oxfordshire. “The HST125 is arguably the most successful British passenger train set to have been developed in the post-war years. Despite its being relatively old it remains an indispensable workhorse on the non-electrified inter-city routes.” March 2011. A totally British built train, but it came into service back in 1976. The above film was mostly filmed in 1990 at London’s Embankment station, showing the northbound Northern Line platform. Additional scenes date from 2013 and were taken on both Central Line platforms at Bank station. The northbound platform of the Northern Line at Embankment is the only station in the system using the old “Mind the Gap!” announcement by Oswald Laurence, recorded over 40 years ago (in the late 1960s or early 1970s), following its reinstatement in 2013. Several voices have been used over the years, most famously that of Peter Lodge, the voice of the first announcements in the late 1960s. “Mind the Gap” is also the announcement at Hounslow East station. The MOD has recently (September 2014) ordered 589 Scout Specialist Vehicles (SV) from American company General Dynamics. These medium weight armoured personnel carriers are essentially variants of off-the-shelf vehicles made for the Spanish and Austrian military. The development of Scout SV involves about 24 UK and other European based suppliers, including Lockheed Martin UK, Thales UK, Raytheon UK, Barco, BEA Systems and ViaSat. It has been suggested that about 80% of the vehicle manufacture will be completed in the UK. There’s a further article about production here. 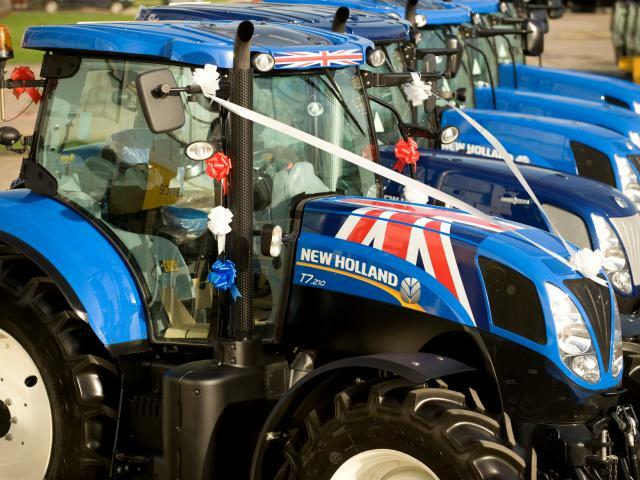 Tractors are still made in the UK by companies like New Holland. New Holland make tractors all over the world. Their plant in Basildon opened in 1964 and has produced more than 1.8 million tractors and over 3.1 million engines. David Brown no longer make tractors. Following financial difficulties their tractor business was sold off in 1972, together with their car making businesses Aston Martin and Lagonda. David Brown still make gears for tanks and the like (there’s a good history of David Brown on the I’m from Yorkshire website). David Brown now have 7 factories across 5 continents (as well as various joint operations and outsourcing) in South Africa, Australia, China, Canada, India, France, and the UK, so all production does not take place in the UK. I don’t know of any other UK tractor makers, except JCB. JCB make all sorts of construction machinery and have production facilities in the UK and elsewhere. In every corner of the world you’ll find a JCB machine. JCB is one of the world’s top three manufacturers of construction equipment. JCB’s world headquarters is in Staffordshire. Possibly Translift Bendi have moved some of their forklift production to the UK according to the Birmingham Post (March 2013). Many London taxi cabs are made by Manganese Bronze Holdings these days and they have a factory in Coventry and (as a joint venture) another in Shanghai, China – for the moment then it seems Black Cabs in London are made in the UK and their other Black Cabs across the world are made in China. See my comments below on the October 2012 bankruptcy of Manganese Bronze. Manganese Bronze, maker of London “black cabs” for more than six decades, was sold to Geely, adding another well known European brand to the private Chinese carmaker that already owns Volvo. The Chinese company, which was Manganese Bronze’s largest creditor, has said it will continue to assemble the company’s TX4 model at the Manganese Bronze plant in Coventry. The company is now called the London EV Company Limited (LEVC; formerly The London Taxi Corporation Limited trading as The London Taxi Company and formerly part of Manganese Bronze Holdings and and formerly named Carbodies Limited). Directly before the existing, smaller, TX4 the company produced the iconic FX4. 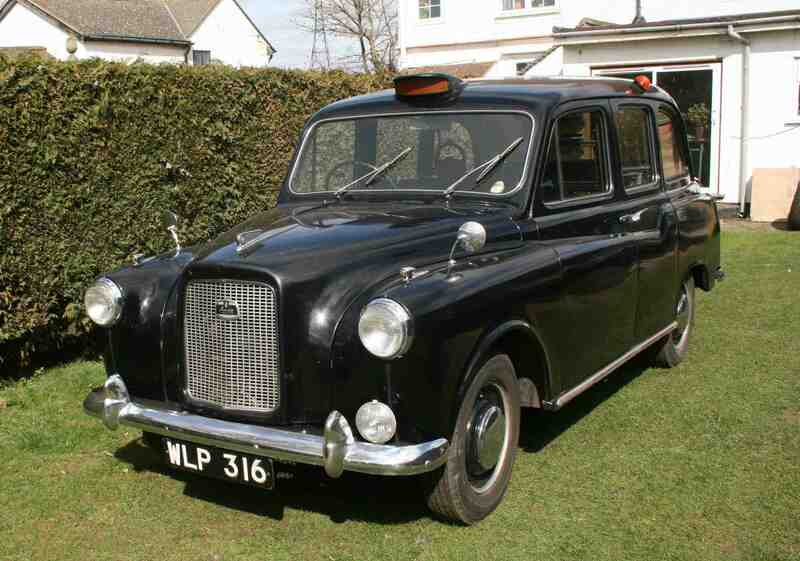 The Austin FX4 is a taxicab that was produced from 1958 until 1997. It was sold by Austin from 1958 until 1982, when Carbodies, who had been producing the FX4 for Austin (British Motor Corporation/British Leyland), took over and they produced it until 1997. In 2015 Geely announced plans to build a new £250 million plant for the London Taxi Company in Ansty Park near Coventry, with production planned to start at the new site in 2017. The London Taxi Company’s (LTC) Ansty Park site in Coventry is the home of its new electric taxi, the TX5 and was opened in March 2017. The existing Holyhead Road premises in Coventry will become a paint shop once the production of the existing TX4 taxi ends. The company also announced that a second vehicle will also be built – an electric light commercial van. 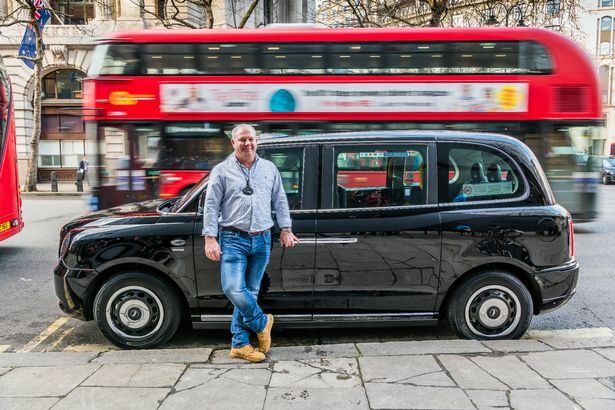 The TX5 taxi is a hybrid electric vehicle and is being introduced from early 2018 with the first delivery having been made in in February 2018. The first new TX (TX5) taxi in London, February 2018. With a Wrightbus new “routemaster” for London double decker bus behind. A 1962 Austin FX4 London taxi, photographed in 2009. Metro Cammell Weymann introduced the MCW Metrocab in 1987. Metro Cammell Weymann (MCW) was once a major contributor in transportation manufacturing in the UK, making buses (including bus chassis), double-decker buses, mini-buses, and Metrocab taxis, until being broken up and sold off its then owners Laird Group. Reliant (see below) owned Metrocab taxis from 1989 and production was moved to Tamworth until Reliant collapsed in 1991 and ownership of Metrocab passed to Hooper & Co (Hooper & Co. was a British coachbuilding company, now defunct) and from 2001 to Kamkorp who continued production until 2006. 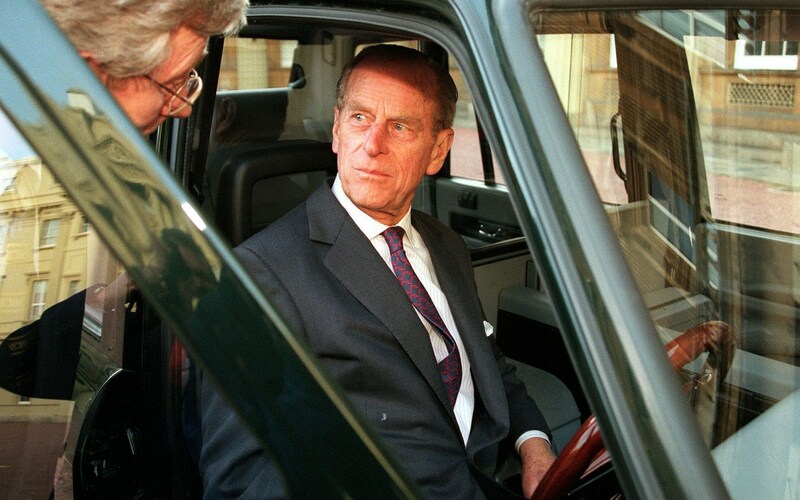 Prince Philip used to have a green Metrocab taxi which he used to get around London, sometimes driving it himself. Kamkorp re-started production of Metrocabs in 2014 on a trail basis under the brand name Ecotive and they are now hybrid petrol-electric vehicles. 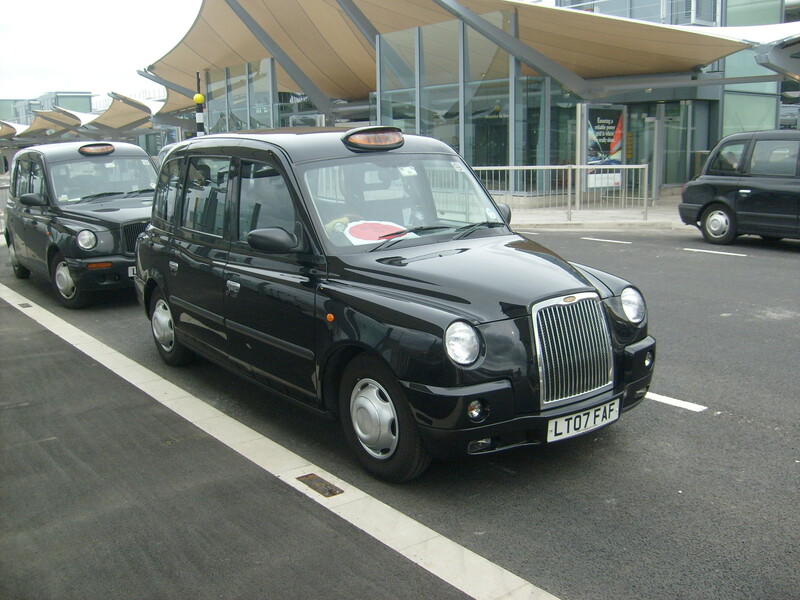 Ecotive Metrocab describe their taxis as “designed and engineered in Britain”. 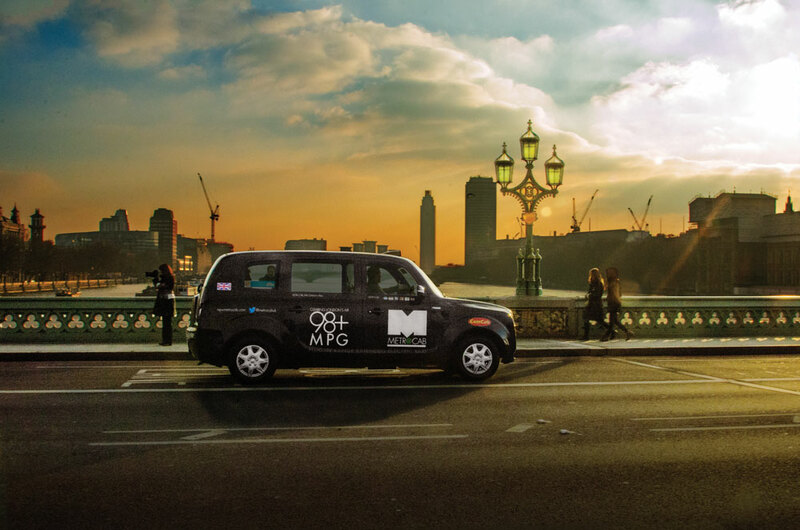 The new 2014+ Metrocab has the look of an iconic London taxi and in 2016 Ecotive said “the Metrocab electric vehicle … will be manufactured in Coventry”. As of February 2018 production has not yet started. The 2014 Metrocab will be manufactured by Canadian company Multimatic at an expanded plant in Ansty Park near Coventry. 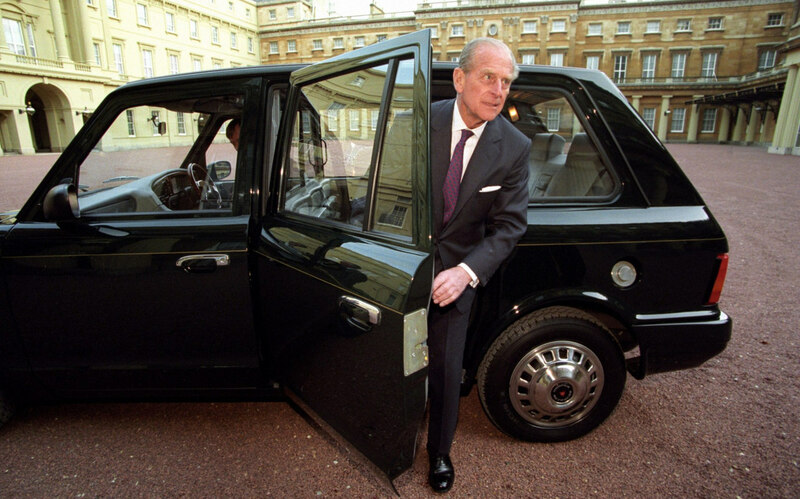 Prince Philip and his liquid petroleum gas – powered Metrocab taxi at Buckingham Palace in 1999. In 2017 he gave his incognito car to Sandringham Museum. The Duke takes collection of his new Edinburgh green coloured Metrocab taxi at Buckingham Palace in 1999. 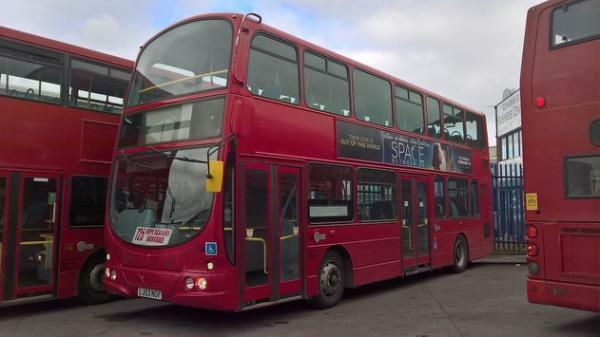 Buses and coaches are still made in the UK by companies like Alexander Dennis (who also own Plaxtons), Optare and Wrightbus (who are making the new “routemaster” for London). Plaxton of Scarborough, founded in 1907, became part of the Alexander Dennis Group in 2007. They still have a manufacturing site in Scarborough where they make Plaxton coaches and Alexander Dennis Enviro buses. Alexander Dennis Limited (ADL) of Scotland encompasses three famous and successful marques – Alexander, Dennis and Plaxton. They have manufacturing facilities in the UK, Asia and North America. Wrightbus is a Northern Irish coachbuilder established in 1946 who also make their own chassis as well as buying them in. Optare make buses in the UK and are owned by Ashok Leyland (an Indian commercial vehicle and military vehicle manufacturer’ formerly part of Leyland Motors) who are themselves part of the Indian London based Hinduja Group. The Leyland logo continues to be used by Ashok Leyland in the sub-continent. 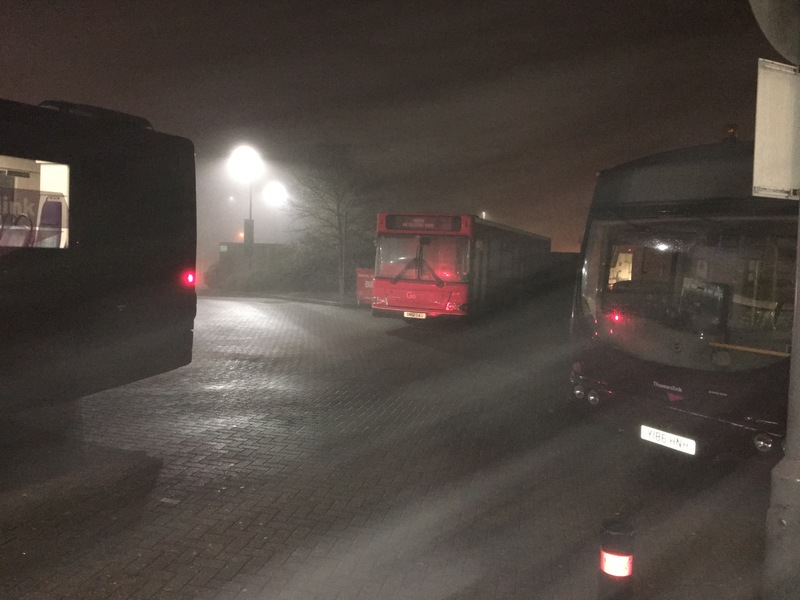 Buses in the fog at Luton Airport Parkway Railway Station 6 Jan 2015 (Plaxton bus in the centre). Photograph by author. 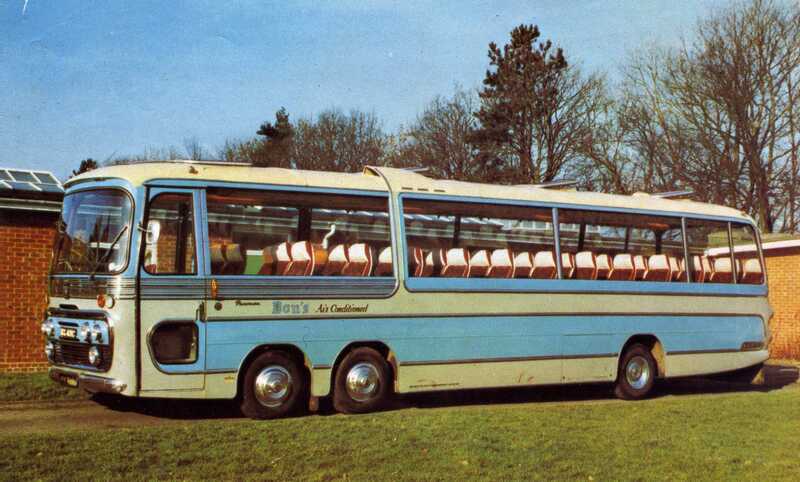 A vintage 1965 Plaxton Panorama on a Bedford VAL chassis, picture taken from a 1970 Dons Tour Brochure. This is a 51 seater coach. 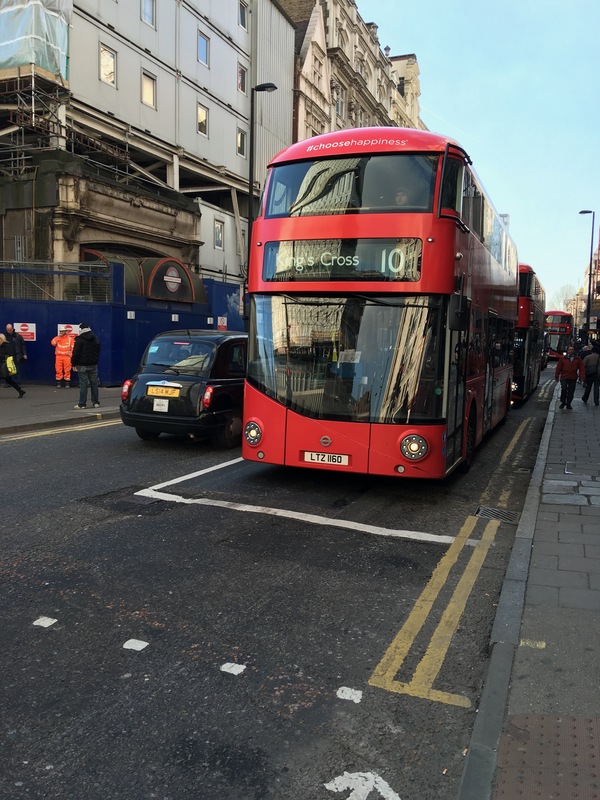 Wrightbus new “routemaster” for London double decker bus, Oxford Street, January 2016, which uses a Volvo chassis. Photograph by author. I think this is outside Tottenham Court Road tube station. 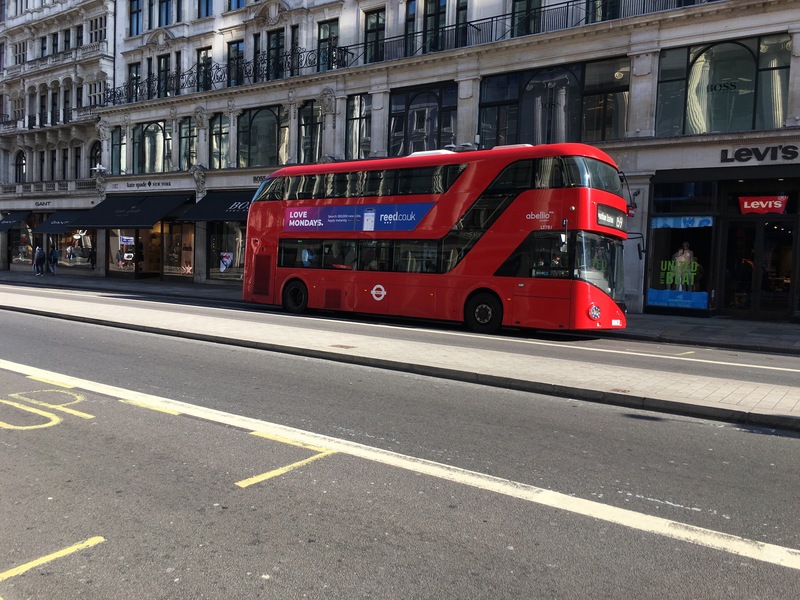 A Wrightbus “routemaster” for London double decker bus on Regent Street, 30 September 2018. Photograph by author. Many well known British coach builders making buses and coaches have closed down. 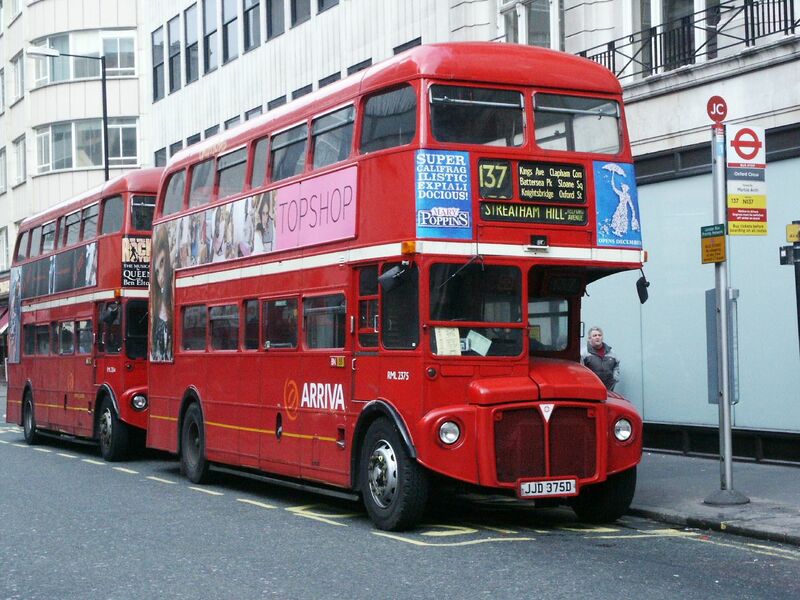 Historically, Leyland Motors was a major manufacturer of buses, double decker buses, London double decker buses, and coaches used in the United Kingdom and worldwide. Leyland Bus became part of Volvo Buses in 1988, with the name disappearing in 1993 (and the closure of the Workington factory where Leyland buses were built) and the remaining factory in Irvine, Scotland closed in 2000. Volvo production is now in Sweden, Belgium, France, and Poland with no production in the UK. As far as I am aware DAF (Leyland Trucks) no longer make buses. Bristol (see below) no longer make buses as far as I am aware. Thomas Harrington & Sons Ltd was a coachbuilder in the county of Sussex from 1897 until 1966. Although not technically a part of the Rootes Group (see below), the Thomas Harrington operations were owned by a Rootes family investment company from sometime post-war until 1965 when it was decided to close the factory. Production ceased in April 1966 after which Plaxton purchased spares, stock in trade and goodwill. Crossley Motors was a British motor vehicle manufacturer based in Manchester, England who produced cars, buses and goods and military vehicles from 1903. They were taken over by AEC and production at the Crossley factories ended in 1958. 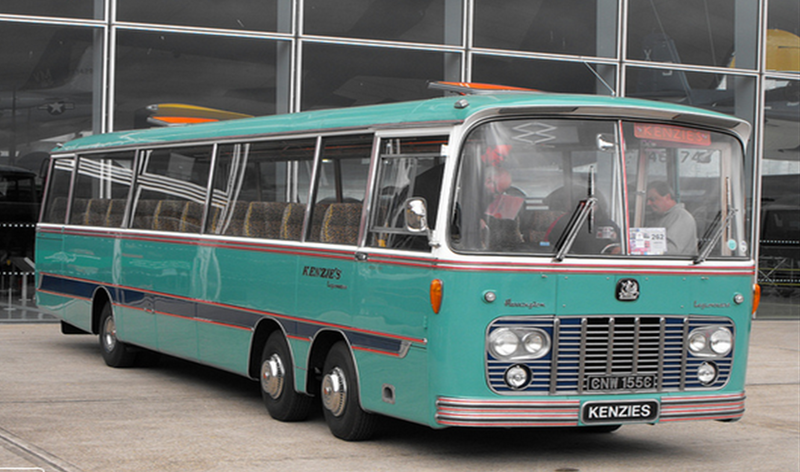 AEC was a British vehicle manufacturer which built buses, motorcoaches and lorries from 1912 until 1979. The abbreviation stood for Associated Equipment Company, but this name was hardly ever used; instead it traded under the AEC and ACLO brands. 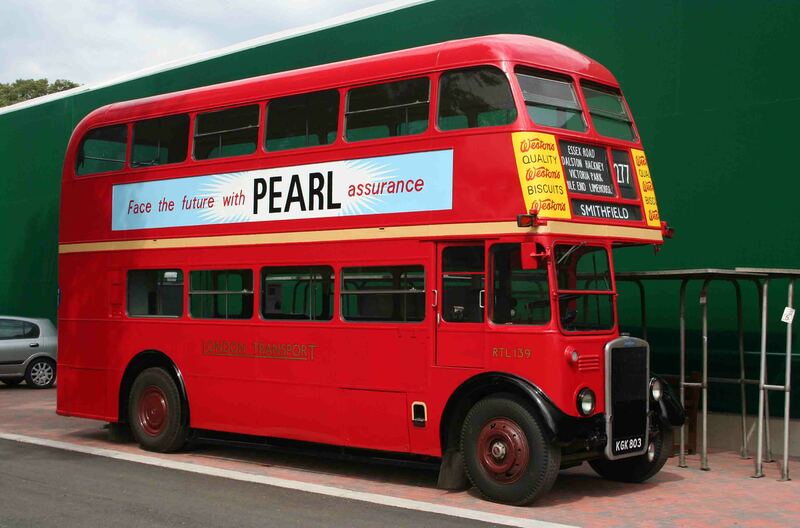 While famously associated with London’s AEC Routemaster buses (they were one of a number of companies who made the famous hop-on-hop-off red London buses), AEC supplied commercial vehicles to many companies, both domestically and around the world. Leyland Motors Ltd acquired ACV in 1962, closing the company down entirely by 1979. 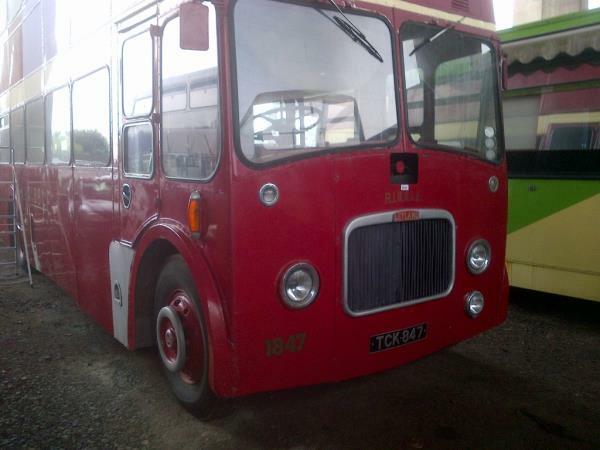 A 1963 Leyland PD3/5 Titan Ex-Ribble double decker bus. 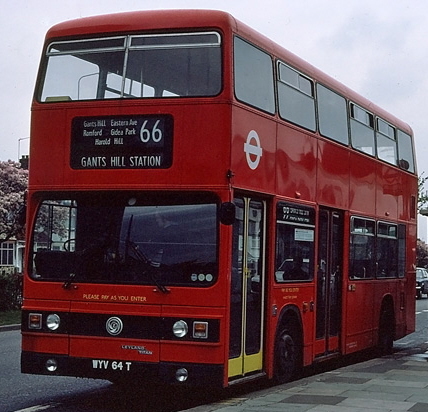 London Transport double decker bus T64 (WYV 64T), 1979 Leyland Titan (B15), Gants Hill, route 66, 19 April 1980. 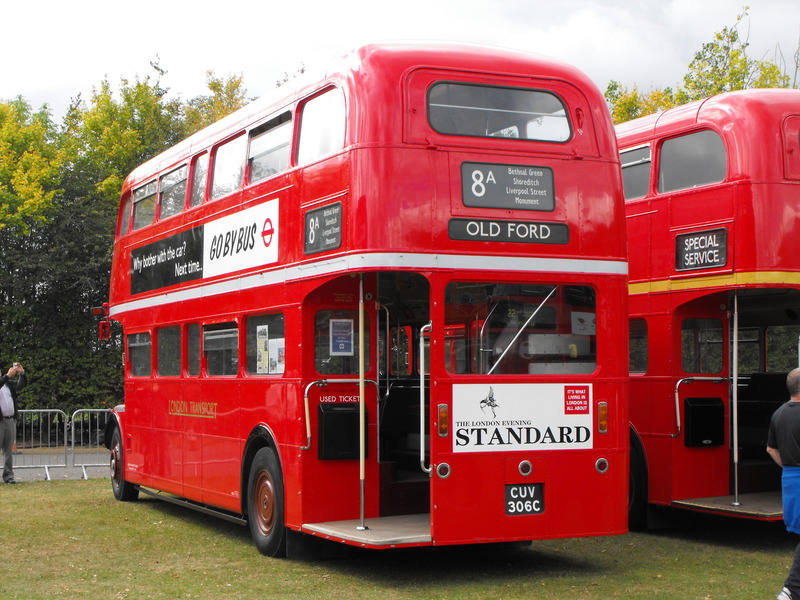 A 1949 Leyland 7RT double decker open platform bus – RTL139. This bus was in service from 1949 to 1967 and is still in working order as of 2017. London Bus Museum. A 2003 DAF DB 250 double decker bus. A WEO146T Single Decker Dennis Bus, 1979, probably somewhere in the Furness area. Bristol buses outside York Railway Station in 2009. A vintage Bristol LWL coach with Eastern Coach Works body, registration number LTA 772. It was built in 1951 for Western National but transferred to sister company Southern National in 1959. Photographed in 2011. 1964 Harrington Legionnaire twin-steer coach owned by Kenzie’s coaches. Based on the Bedford VAL and one similar was used in the 1969 film ‘The Italian Job’. Photograph taken 2014. AEC Routemaster RML2375 (JJD 375D), 6 March 2004. Arriva London Routemasters at Oxford Circus. RML 2306, CUV 306C, AEC Routemaster, Park Royal Body, 1965 (t.2011) Seen at Showbus 2011. Note the typical traditional hop-on-hop-off platform to the rear and seperate driver’s cab meaning a conductor is required as well as a driver. 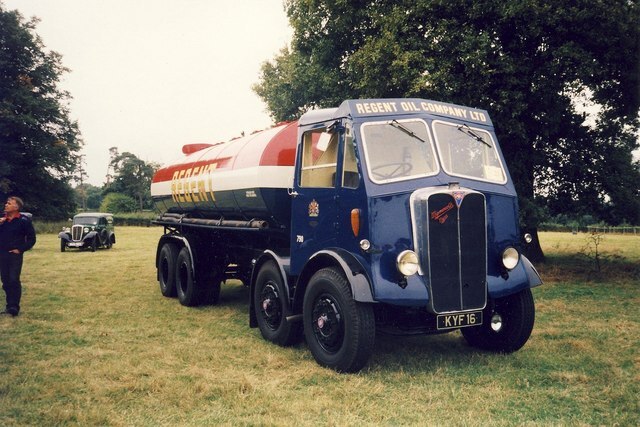 As for lorries, ERF have been brought by MANN and manufacturing moved to Germany, Foden have gone (integrated with Leyland Trucks), Saxon (the fire engine makers) have gone, Scammell have gone. AEC became part of British Leyland who closed them down entirely by 1979 (see above). Dennis specialist vehicles became part of Alexander Dennis (see above) and no longer make fire engines and the like. 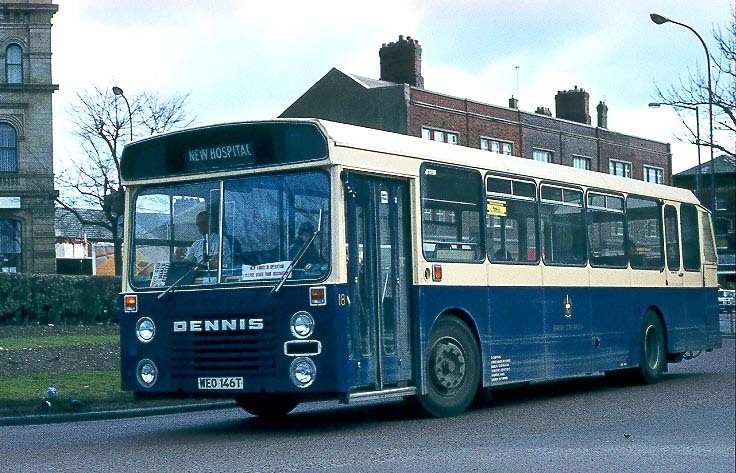 Dennis Bus and Dennis Fire were incorporated into Transbus International (now Alexander Dennis) in 2001. A newer John Dennis Coachbuilders make fire trucks using a number of different foreign made chassis in England. 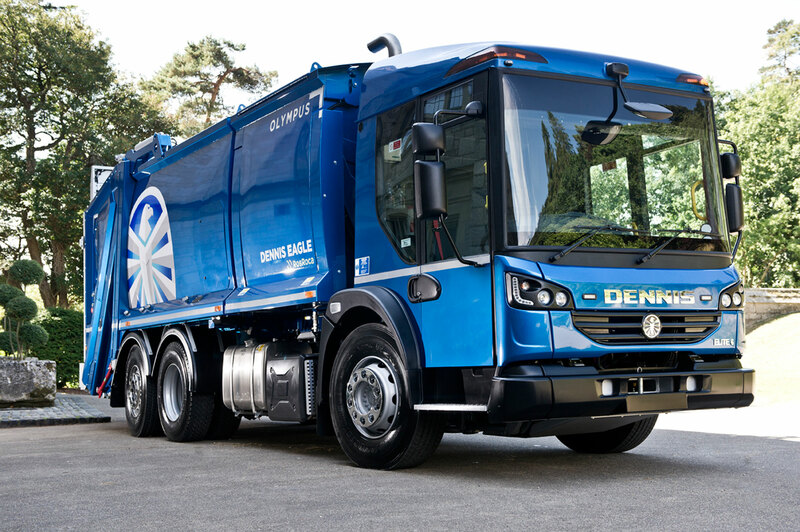 Dennis Eagle the manufacturer of dustcarts/refuse vehicles, incorporating the remains of Eagle Engineering and Shelvoke and Drewry, is now owned by the Terberg Res Rosa Group of the Netherlands and appears to still manufacture bin lorries in the Midlands. Bedford has gone but General Motors (IBC Vehicles) still make Opel/Vauxhall branded vans in Luton, England – now French owned Vauxhall currently still make the Vivaro van in Luton. Leyland Trucks remain (owned by American truck maker PACCAR, they still have a factory in Leyland, Lancashire), and sell under the name DAF. DAF manufactures its trucks in factories in Eindhoven (the Netherlands), Westerlo (Belgium), Leyland (the United Kingdom) and Ponta Grossa (Brasil). DAF is a Dutch company Van Doorne’s Aanhangwagen Fabriek (Van Doorne’s Trailer Factory), abbreviated to DAF. DAF LF or a right-hand drive XF and CF lorries manufactured in the UK at the Leyland factory. Leyland DAF came about in 1987 as joint venture between British Leyland/Rover and DAF of the Netherlands forming DAF NV. Following the insolvency of DAF NV in 1993, four new companies emerged through management buyouts; LDV Limited as a van manufacturer in Birmingham (LDV Group Limited, formerly Leyland DAF Vans, went bankrupt in 2009 with the machinery being shipped out to China); Multipart Solutions Limited which was formed out of the firms parts company based in Chorley, Lancashire and is still going today; Leyland Trucks of Leyland, Lancashire; and DAF Trucks of Eindhoven in the Netherlands – the latter two coming together again following their purchase by American company Paccar. A 2017 Dennis Eagle Olympus bin lorry. 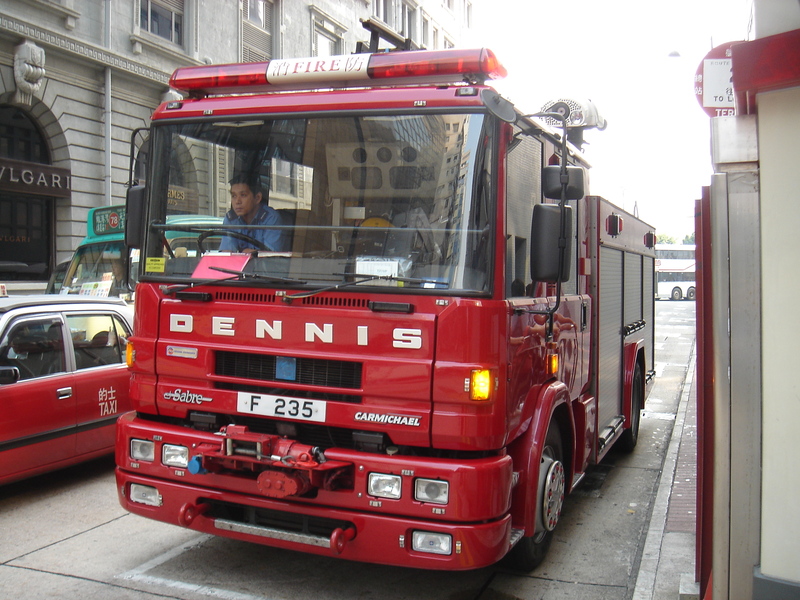 A Dennis Sabre fire engine, Hong Kong Fire Services Department, 2005. AEC Mammoth Major Tanker built c 1930s. Photograpgh taken 1996. Whitby Morrison (formerly S.C. Cummins) – manufacturer of ice cream vans, trucks, trailers, kiosks and tricycles and supplier of soft ice cream machinery and spares, and who have bodied just about every single ice-cream ever used in the UK apparently, are still going. 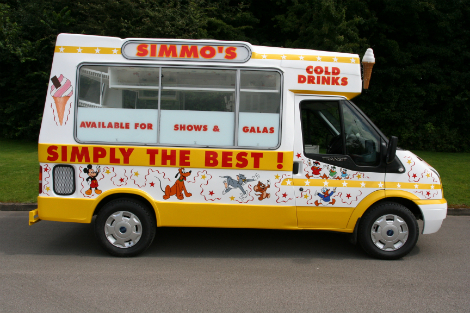 Mostly they convert Mercedes and Fords (Ford Transit vans are still made in the UK I think) into ice cream vans. Alloy Bodies Manchester is a firm which makes bodies for vans and trucks, ranging in size from three to 32 tonnes, for example bodies for furniture vans, car transporters, horse boxes and rental trucks. Plowman Brothers livestock trucks & tractor towed trailers are made in the UK. Global Vehicle Trust intend to make their flat-pack Ox truck in Britain with it then being able to be built up quickly and easily in emerging markets or other markets. They are currently seeking funding to take their concept forward. Ford no longer make their Transit vans in the UK. Transporter Engineering (purchased by Hunwick Engineering in July 2010) car transporter lorry trailers are made in Great Britain, in Essex. On their website they say “Transporter has built a reputation on delivering quality British built products…” and I have seen a made in Great Britain label on their car transporters. “The automotive industry accounts for around 11% of all UK exports and on average produces 1.5 million cars and commercial vehicles and more than 205 million engines every year. This is a global industry investing on a large scale in UK manufacturing. In 2011 global manufacturers announced investments in new models and expansion of existing facilities worth more than £4 billion.” [The AA Made in Britain – also see Which Cars are Actually Made in the UK]. 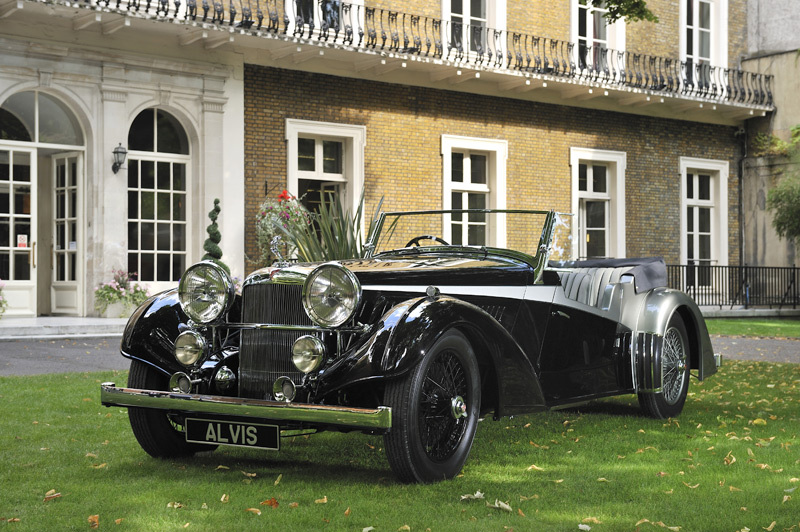 * Alvis – Red Triangle / The Alvis Car Company, following an agreement between the company and BAe, resumed production in the UK, of the Alvis 4.3 Litre model (referred to as the “Continuation Series”) in 2011. I don’t know much about the company (or indeed if it is still British owned) and prices are not given (I suspect they cost quite a bit! ), but it is good to read that Alvis is back. More info on Wikipedia, and here and here. The Morgan Motor Company Ltd. was established in 1909 by H.F.S. Morgan with the design of the now iconic Morgan Three-Wheeler. This was followed in 1936 by the Morgan 4-4, which continues to be produced today, and is the longest running production car in the world. In 2018 Morgan also started selling a Morgan bicycle made by Pashley in England. McLaren Automotive (formerly known as McLaren Cars) is a British automotive manufacturer based at the McLaren Technology Centre in Woking, Surrey. 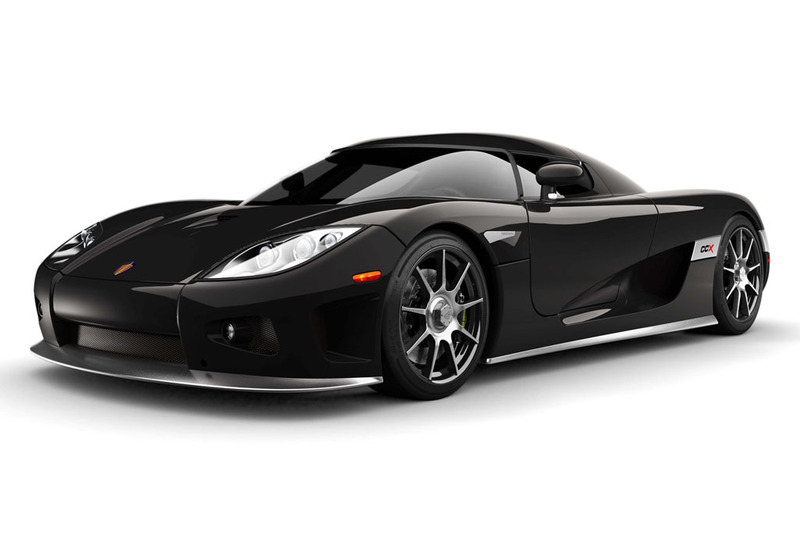 The main products of the company are sports cars. Noble Automotive – seemingly British owned – very exclusive cars (I have never seen one!) made in South Africa and assembled in the UK. David Brown Automotive – despite the name, unconnected with David Brown / Aston Martin / Lagonda / David Brown tractors – seemingly British owned and made, although I am not clear if they are actually being made yet – again very exclusive cars that I have not seen – possibly one model, the Speedback, has been made. 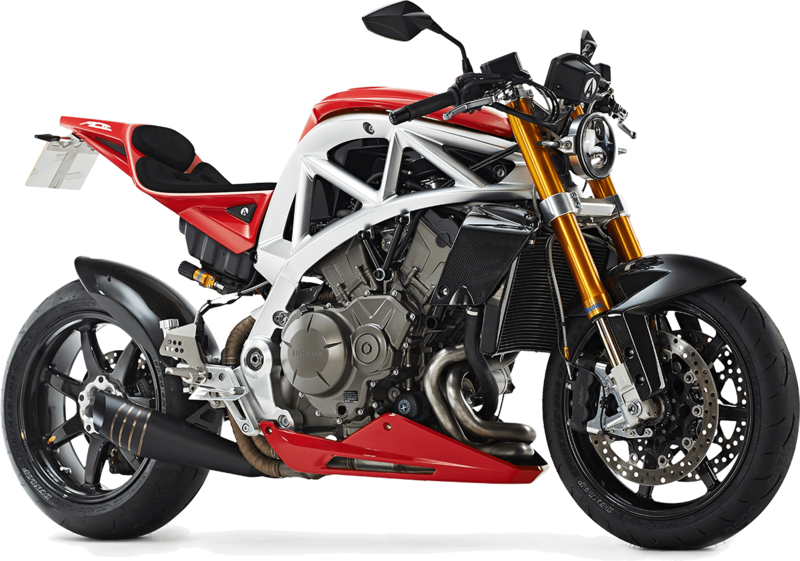 Ariel Motor Company Ltd is a low-volume performance motor vehicle manufacturing company in Crewkerne, in Somerset, England. They appear to manufacture and assemble in the UK, using foreign made engines. 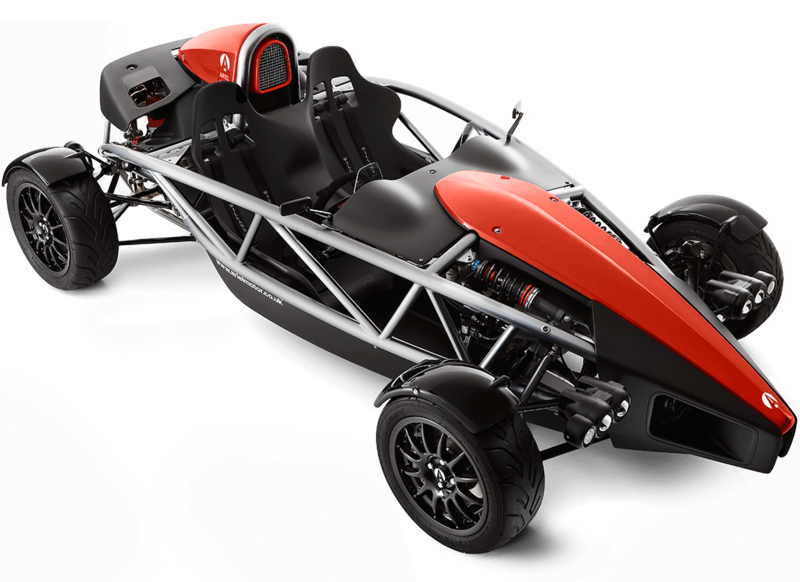 Current models are the Atom car, the Nomad car and the Ace motorcycle. According to Wikipedia, the original Ariel Motors remains as the trading company of the Ariel Owners Motorcycle Club (AOMCC). Ariel Motorcycles was a British motorcycle manufacturer based in Bournbrook, Birmingham, which became part of BSA in 1951 but the Ariel brand survived until 1967. The last motorcycle-type vehicle to carry the Ariel name was a short-lived 3-wheel tilting moped launched in 1970 by BSA. Ariel had made bicycles before making motorcycles, and had also made automobiles. The ‘Ariel’ name was reused in 1999 for the formation of Ariel Ltd, a sports car producer mentioned above. Bradshaw Electric Vehicles, founded in 1973, manufacture electric vehicles for industry, such as electric baggage handling vehicles used in airports like London Heathrow. Their website seems to suggest they have a factory in Peterborough but it is not clear on this. Check where their vehicles are made if you are buying. Certainly they do import vehicles. TVR was a British sports car manufacturer with a factory in Blackpool founded in 1946. The company went through various financial difficulties over the years and the Blackpool factory eventually closed down in 2006. The company name has since been revived and in 2018 it has been suggested that a new TVR will “Unapologetic, loud, proud and British built”. Wikipedia suggests the new car will be built in Wales. No such information is given on the TVR website. It will be interesting to see if this project takes off. Potenza Sports Cars is a company which now owns Westfield Sportscars and GTM Cars, both of which now are or are going to be manufactured at the Westfield factory in Kingswinford, West Midlands in the UK. Founded in 1982, Westfield Sportscars are manufacturers of both factory built and kit versions of several two-seater, open top sportscars. Their main product line is a Lotus Seven inspired car. In this respect they are visually similar to Caterham Cars (see below) who bought the rights from to the Lotus Seven from Lotus Cars. However, it is claimed the two cars differ and an out of court settlement was made between the two companies in the 1980s. Westfield prefers to employ the same glass fibre body method that Lotus has traditionally used for their other models such as the Elise, Esprit, and Elan, rather than the aluminium used by Caterham. They also make electric and hybrid models. On their website they say “In 1991, Westfield expanded again moving to the impressive factory and office block in Kingswinford where we are still manufacturing today” and ” In an age of manufacturing imports Westfield are proud to boast high quality British craftsmanship in every aspect of production, and they build them right here in the heart of the United Kingdom.” They also say they are 100% British owned. I don’t know what percentage of their parts are British made but they use parts from Mazda and Ford for example. GTM Cars is or was a component kit car manufacturer, founded in 1967. They started off making the Cox GTM (Grand Touring Mini) a mid engine sports car based on Mini parts. Production stopped in 1968 and re-started under new ownership in 1971. They were taken over again in 1972 after production stopped but the new owners produced nothing. Then in 1976 they were taken over again and just produced spare parts for their cars. Under new ownership again in 1980 they began making cars again, still based on the Mini. They were taken over again in 2003 with production moving to Coventry. They were taken over by Portenza in 2007 and production moved to the Westfield site. In late January 2010, Westfield Sportscars made the following announcement. “Unfortunately due to parts procurement issues we are no longer offering the current range of GTM models. We will however over the next 12 months be designing and manufacturing a new GTM.” There is no GTM Cars website and no new model has been forthcoming, however Westfield sports cars are still being made in Britain. Westfield also produce Westfield Autonomous Vehicles driverless pod vehicles, which have been trialled and are planned for deployment in various locations and are based the pods you see at London Heathrow Terminal 5 which are also made by Westfield. The following companies build cars in Britain, but are not UK owned. In many instances only a percentage of the parts used are British made with other parts being imported. Bristol Cars Ltd » Now Indian owned. Car production is currently halted but a new model is under apparently development and the company continue to restore old Bristol cars. The company used to make trams, aircraft, taxis and buses, as well as cars. 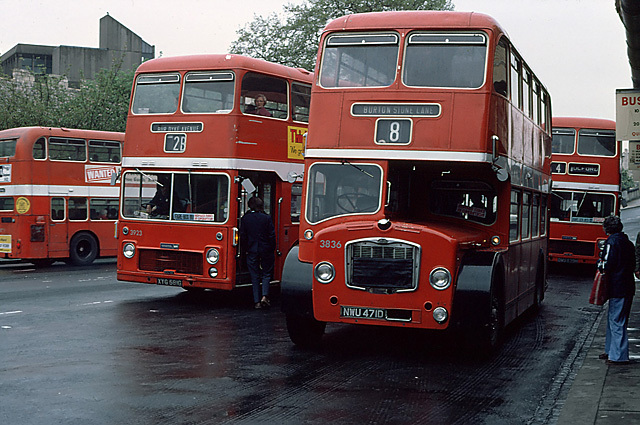 The production of Bristol buses and lorries ended in 1983. At one point they owned British sports car company Frazer Nash. Frazer Nash, founded in 1922, made their own sports cars and cars under the Frazer Nash BMW brand and the Frazer Nash Porsche brand with Porsche eventually buying the company in 1987 who of course closed it down. 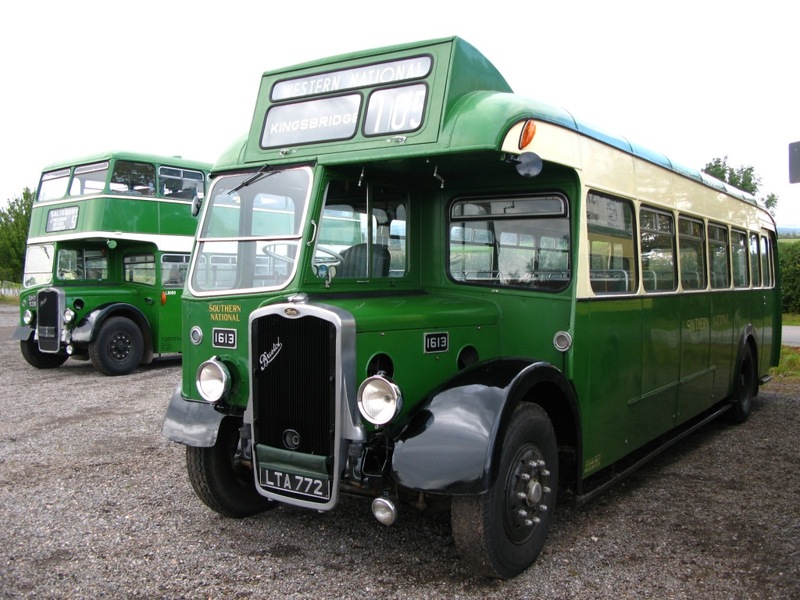 There is a comprehensive history of Bristol vehicles on the company website. Following bankruptcy in 2011 the name was purchased by Kamkorp, which also owns Frazer-Nash Research, now a technology manufacturer of electric power systems. The Kamkorp Group, as well as owning Bristol Cars and Fraser-Nash, also own Metrocab (taxis – see above) and Metrail (mass transit systems). Kamkorp is owned by UK-based Indian businessman Kamal Siddiqi. 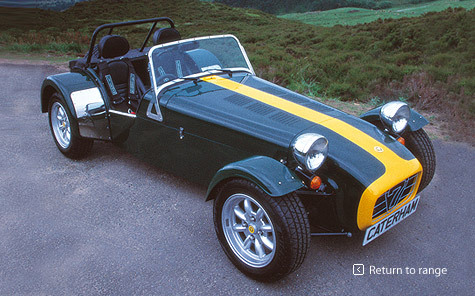 Caterham Cars Ltd – owned by a Malaysian businessman. In October 2014 the Caterham motor racing team went into administration last month. The Caterham Group, which comprises two technology companies as well as the car manufacturing arm, is not in administration. Lotus started building its iconic Seven sports car in 1957 and continued doing so until 1973. At this point, Caterham bought the production rights. 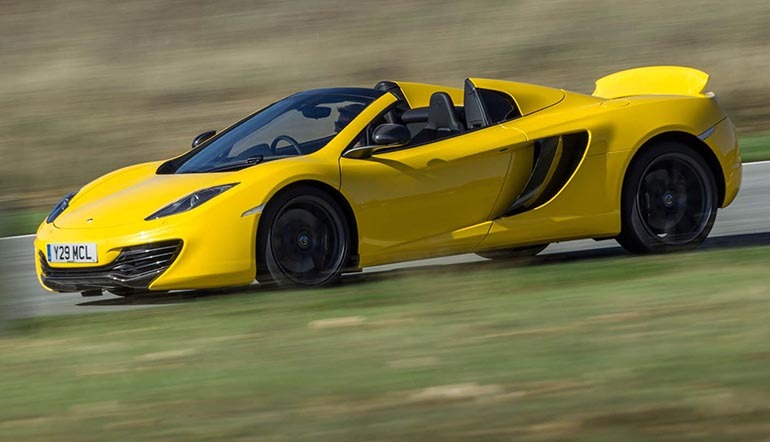 It is still building variants of the car now, 61 years after Lotus began the process. Mini – built in Cowley, Oxford, but owned by BMW in Germany. German company BMW now own the Mini name. 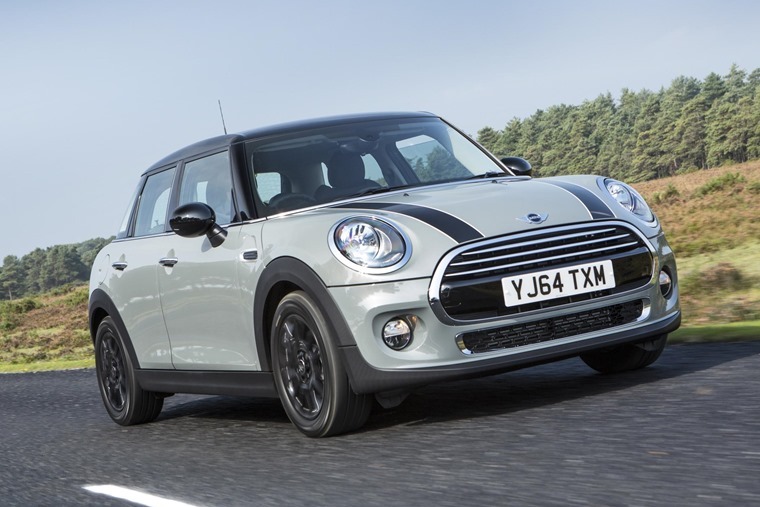 Engines for the BMW Mini are now produced in Birmingham, whilst body pressings are made in Swindon and the Mini Hatch/Hardtop, Clubman, Convertible, Coupe and Roadster are assembled at BMW’s Plant Oxford in Cowley, England, and the Countryman and Paceman are assembled by Magna Steyr in Austria. The Countryman is also assembled in India specifically of the Indian market and in Malaysia and Thailand. Electric-powered Mini cars will be built in China for the local Chinese market following a deal when BMW announced a deal with Chinese manufacturer Great Wall Motor to make them there. This is the new Mini of course. 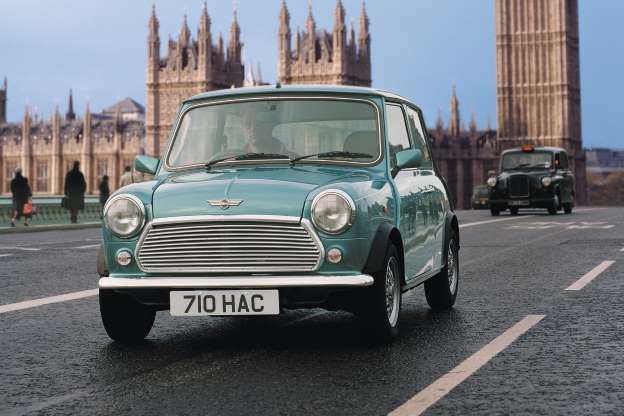 The original Mini by Austin (later British Leyland) first went on sale in 1959 and remained on the market until 2000, 41 years after its launch, immediately before the arrival of the first BMW-era Mini. Honda build the Civic, CRV and Jazz (from autumn 2009) in Swindon. Honda motorcycles are not made in Britain. Japanese owned. In February 2019 Honda announced the closure of its UK manufacturing with the complete closure of the Honda Swindon plant by 2021, with the loss of 3,500 jobs and a consequential knock loss of jobs in Honda’s supply chain elsewhere. A trade deal between the EU and Japan means that car exports from Japan to Europe will soon be tariff-free. Toyota build the Auris and Avensis in Burnaston, Derbyshire, with engines built at their Deeside plant in North Wales. Japanese owned. Nissan build the Juke, Qashqai, Note, Pulsar and LEAF in Sunderland. Japanese owned. The Infiniti Q30 is also built in Britain by Nissan. The Japanese car company announced in February 2019 that it would no longer be making its new X-Trail SUV at its Sunderland factory, relocating manufacturing to Japan instead. A trade deal between the EU and Japan means that car exports from Japan to Europe will soon be tariff-free. Lotus in Norfolk are Malaysian owned. Lotus make the Elise, Evora and Exige in Hethel, Norfolk. Aston Martin in Gaydon, Warwickshire are owned by two Kuwaiti companies – Investment Dar and Adeem Investments. Aston Martin make the Rapide, Virage, DBS, Vantage and DB11 in Gaydon, Warwickshire. Bentley Motors in Crewe, owned by Volkswagen. Bentley make the Continental, Flying Spur and Mulsanne in Crewe. Rolls Royce, built in Goodwood, owned by BMW. Rolls Royce make the Ghost, Phantom, Wraith and Dawn in Goodwood, West Sussex. Jaguar/Land Rover– built in the West Midlands and Liverpool. Owned by Tata Motor Company of India. Both Land Rover and Jaguar were once part of British Leyland. Jaguar make their F-Type, XE, XJ, XF and F-Pace in Solihull and Castle Bromwich, West Midlands. Land Rover have plants in Solihull, West Midlands and Halewood, Merseyside. In Oct 2013, Land Rover announced that production would end on Dec 20, 2015 of the versatile Land Rover Defender, after a continuous run of 67 years, since 1948. The firm has said the decision to cease Land Rover Defender production was apparently “mainly legislation based” but there are rumours that production is moving overseas. There is also talk of a replacement model. James May talks a bit about the demise of the Land Rover and I think it is a sad loss. 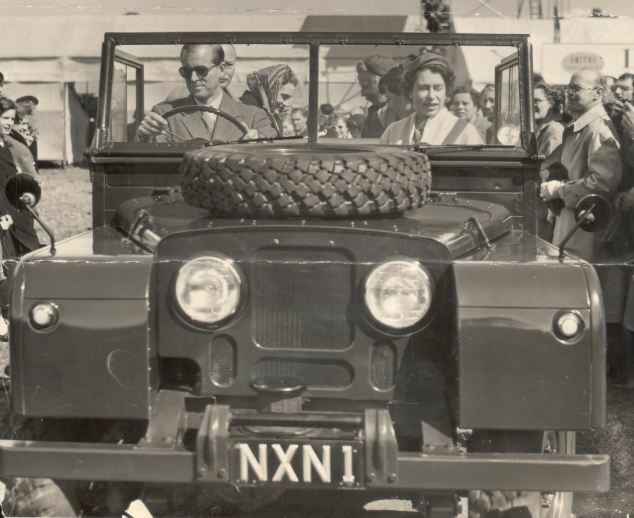 British Family discuss the gradual move by Tata to producing these iconic British Land Rovers and Jaguars abroad; some production has already moved to China and sadly the Indian company plans to move further production abroad to Brazil, Austria and Slovakia. The Defender was already assembled in Pakistan, Malaysia and South Africa for those markets. Jaguar Land Rover announced in April 2-18 that it would cut 1,000 UK jobs, due in part to the ongoing uncertainty around Brexit, and in June 2018 the carmaker revealed plans to move production of its Land Rover Discovery model from the UK to Slovakia. The Land Rover Discovery is currently made at the company’s Solihull plant, but Jaguar said that it will switch production to eastern Europe by early next year. At present their only other model, the Range Rover, is still made in the UK. INEOS Automotive founded in 2016 and owned by INEOS Chemicals have stated their intention to build a somewhat low tech Land Rover Defender type vehicle after the versatile Land Rover went out of production in 2013. Ideally they say they would like to make the vehicle in the UK but they have not stated that it will be built in the UK. A prototype is being made for them in Germany currently and they hope to have this made by 2018 and want to start production in 2020. Land Rover are rumoured to be making their own replacement for the Land Rover Defender with a new model due to be announced in 2018. INEOS Automotive are calling this project Grenadier and they want to produce a reliable 4 x 4 Land Rover like vehicle. MG Motors at Longbridge, Birmingham – now owned by SAIC of China. MG are now making the 3 and 6 at Longbridge, Birmingham. Formerly part of British Leyland. The original MG marque, the initials of Morris Garages, was produced from 1923 until 1980 when the Abingdon factory closed. Between 1982 and 1991, the MG marque used to badge-engineer sportier versions of Austin Rover‘s Metro, Maestro, and Montego ranges. The MG marque was revived in its own right from 1992-1995 with very limited numbers of entire MGB body shells being manufactured in Faringdon. 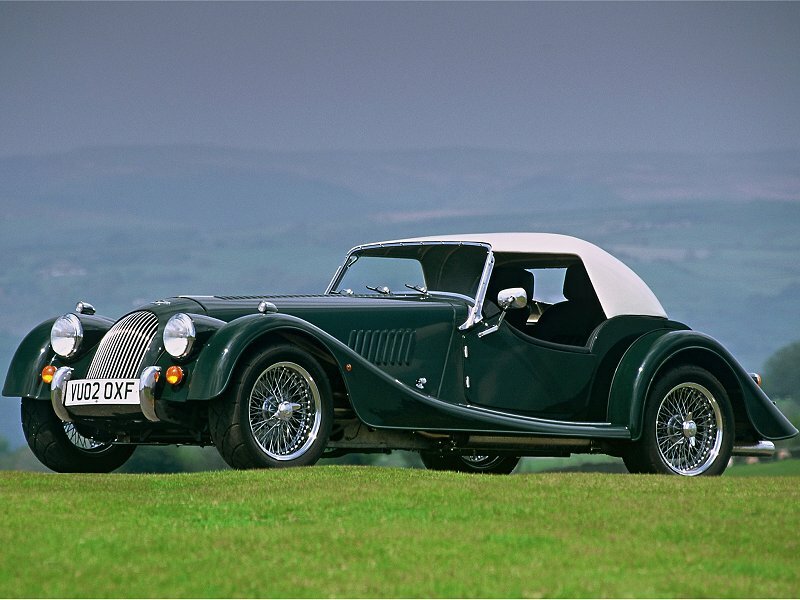 A second revival came in the summer of 1995, when the high-volume MG F two-seater roadster was launched. Badge-engineer sportier versions of Rover models were then produced from 2001-2005, when MG Rover went into administration. In 1979 The MG Car Company celebrated the 50th Anniversary of its move from Cowley to Abingdon. They asked Morland & Co to brew a special commemorative beer for the occasion. The name chosen was ‘Old Speckled Hen’, which took its inspiration from a 1927 MG Featherlight Saloon used as a run about at the factory and affectionately known as the ‘Owld Speckl’d Un’ due to it’s spattered and damaged paintwork.The assets of MG Rover were bought by Chinese carmaker Nanjing Automobile in July 2005, subsequently bought by SAIC in December 2007, which now operate a UK subsidiary, MG Motor. Production restarted in 2007 in China. The first all-new model from MG in the UK for 16 years, the MG 6, officially launched on 26 June 2011. 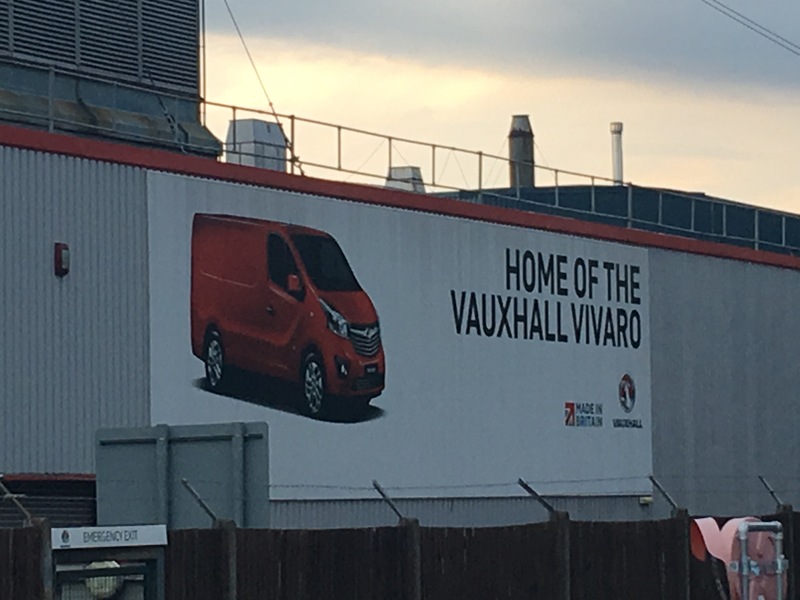 Vauxhall Motors was part of USA company General Motors (which owned parent company Opel based in Germany) and build Astras at Ellesmere Port and the Vivaro van in Luton. 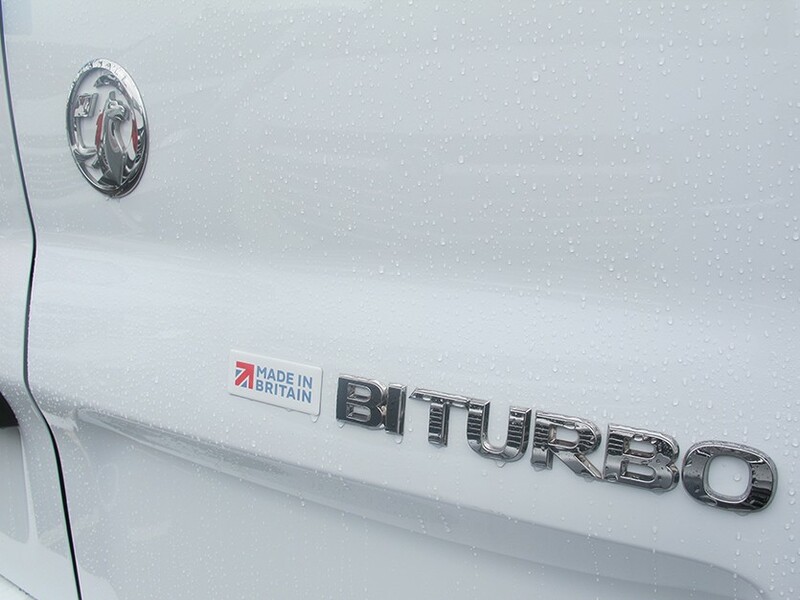 From 2016 some Luton-built Vivaro have Made in Britain badging. From August 2017 Vauxhall / Opel became part of the French company Groupe PSA / Peugeot Citroën, who also the own former British made car brands of the former Rootes Group including Hillman, Humber, Singer, Sunbeam, Talbot, Commer and Karrier acquired through the purchase by Peugeot Citroën of France of former US companies Chrysler UK and Chrysler Europe who had purchased Rootes. The Rootes factories have all been closed. Rootes were also associated with coach builder Thomas Harrington (see above). 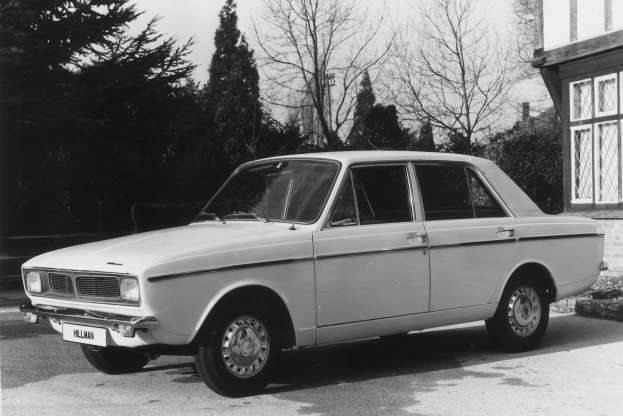 Interestingly the Hillman Hunter, which first went on sale in 1966 with European production stopping in 1979, continued to be built in Tehran by Iran Khodro under licence, although they called it the Paykan, until as recently as 2005, 39 years after its launch and latterly it used a Peugeot engine. 1961 Sunbeam Alpine Series II Plate #: Z 8301. 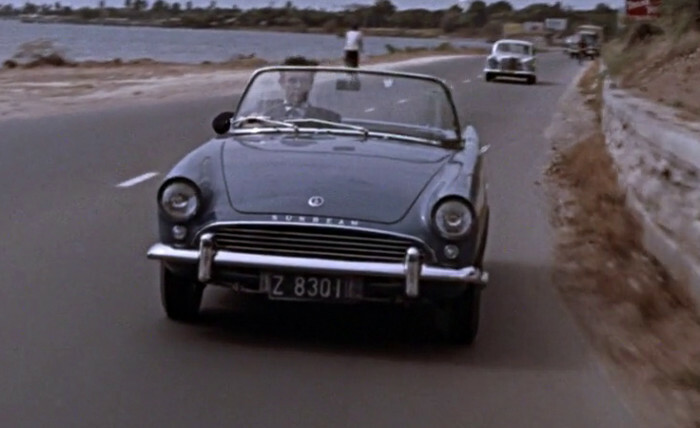 In Dr No Bond drives this car to Miss Taro’s house, “Magenta Drive 23” chased by a hearse. Like many Bond cars to follow, the Sunbeam was English made, manufactured just outside of Coventry in the West Midlands. The iconic car had also featured in the novel Dr. No, where it was the personal car of John Strangways, head of Station J, Jamaica. This one was a Series II Alpine, and they were produced in five series from 1959 to 1968. This is probably a Series II produced from 1960 to 1963. In lake blue apparently. This particular car was rumoured to be borrowed from a resident as it seemingly was “the only decent sports car on the island”. 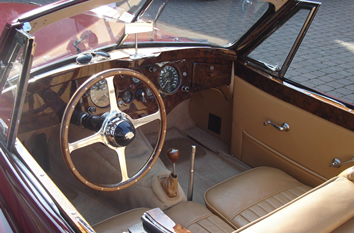 The Sunbeam Alpine was a two-seater sports coupé produced by Rootes Group. Currently Groupe PSA / Vauxhall are maintaining production of the Astra and the Vivaro van in the UK. The Bedford trucks and vans brand is no longer used. India’s iconic Ambassador car brand was also sold by Hindustan Motors to Peugeot in 2017. 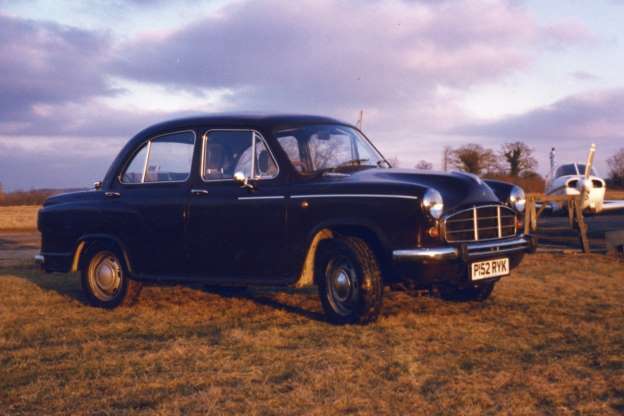 Based on the British third-generation Morris Oxford, the Ambassador was for many years India’s bestselling car from 1957, although production stopped in 2014. Luton, home of the Vauxhall Vivaro van. An advertising hoarding on the side of the Luton factory. 13 October 2016. Photograph by author. Ford stopped passenger car production in the UK in 2002 and Transit production in Southampton in July 2013 but continues to manufacture engines in Bridgend and Dagenham and transmissions in Halewood. Reliant no longer build cars – the Robin was transferred to a company called B&N Plastics in Suffolk, but although they supply parts, no Robins are being manufactured at the moment. The Bond Bug transferred to Reliant following their purchase of Bond Cars in 1969 but production stopped in 1974. 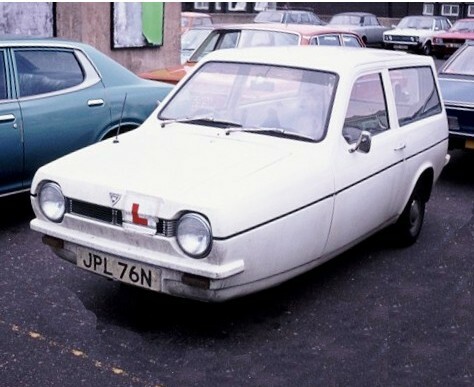 Reliant was best known for producing the 3-wheeled Reliant Robin, but also produced sports cars such as the Reliant Scimitar, convertibles and commercial vehicles. 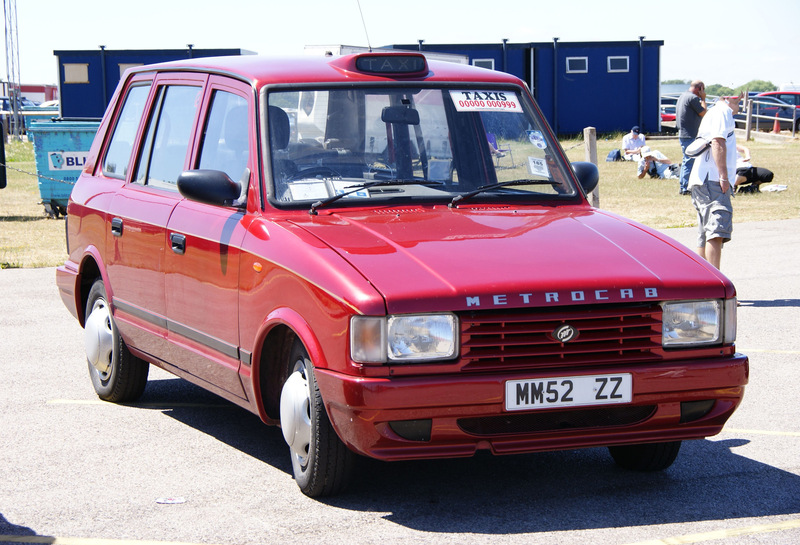 Reliant also owned Metrocab taxis (see above) from 1989 and production was moved to Tamworth until Reliant collapsed in 1991 and ownership of Metrocab passed to Hooper & Co and from 2001 to Kamkorp who have re-started production. 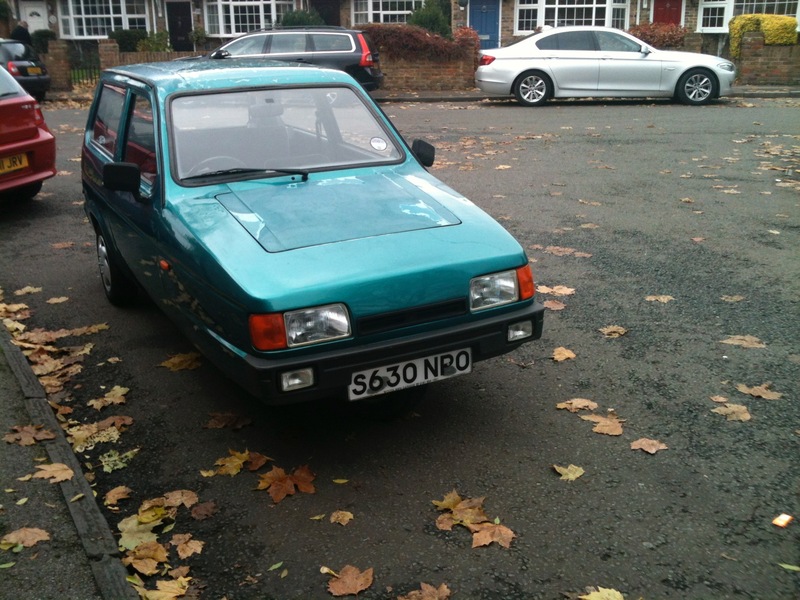 The last Reliant was produced in 2001. Reliant Motor Company Ltd is now a dormant company and the only part that still exists is Reliant Partsworld which produces spares for Reliant vehicles. Reliant PartsWorld Ltd own all the original tooling, jigs and fixtures to produce spare parts for Reliant vehicles. Reliant Robin Estate circa 1974. 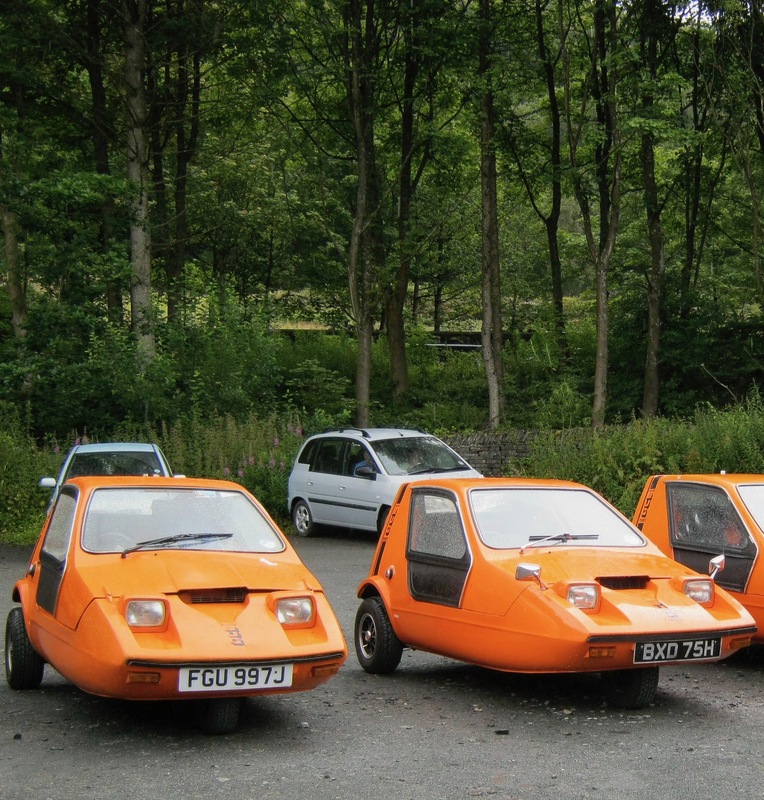 Bond Bugs outside the Lakeland Motor Museum in July 2011. Photograph by author. A Reliant 3-wheeler in use in 2012, near Heathrow Airport. Photograph by author. 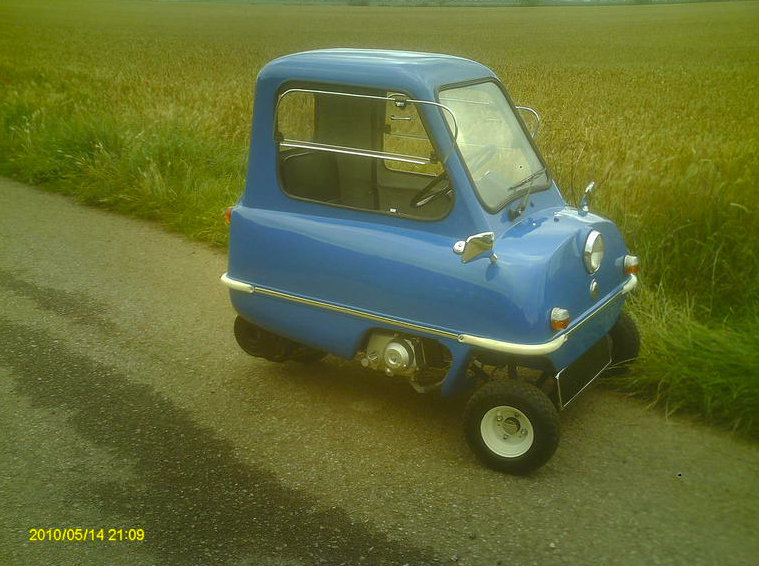 Andy Carter of Bamby Cars has also been building exact Peel P50 replicas in his workshops since the early 1980s and for a while made a new 3-wheeler micro car called the Bamby in Hull. Following bankruptcy the company was re-established in 2011 by Andy and his daughter Emma, this time manufacturing mini micro scale replicas of the German Messerschmitt (Schmitt) micro cars, as well as still making road legal P50s. 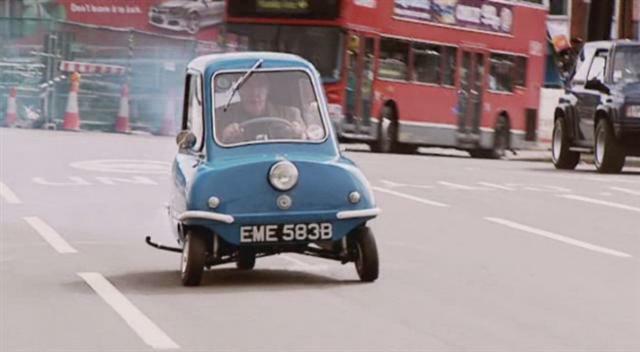 In future they hope to make scale replicas of the Isetta bubble car (Isetta bubble cars were originally made under licence in Spain, Germany, Belgium, Brazil, France and Great Britain) and a road legal Peel Trident – http://minimicros.wix.com/bamby-home#! 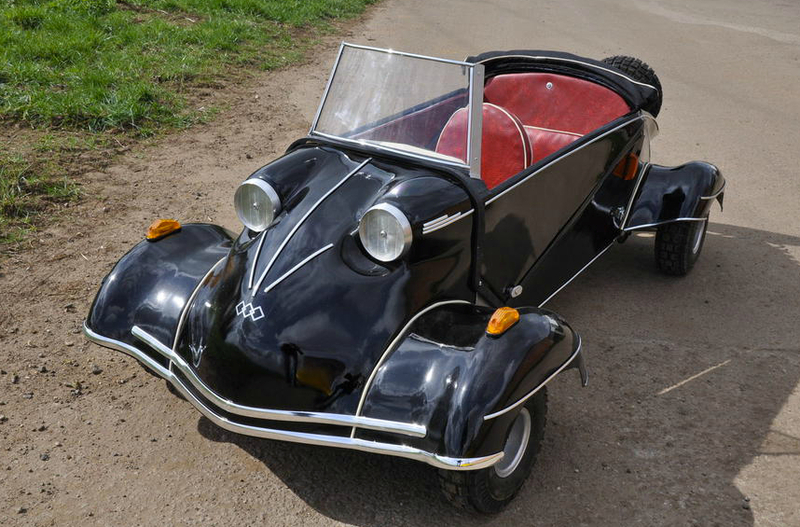 Bamby MINIMICRO SCHMITT TG (4 WHEELER), from the Bamby Cars website December 2014. Bamby P50, from the Bamby Cars website December 2014. 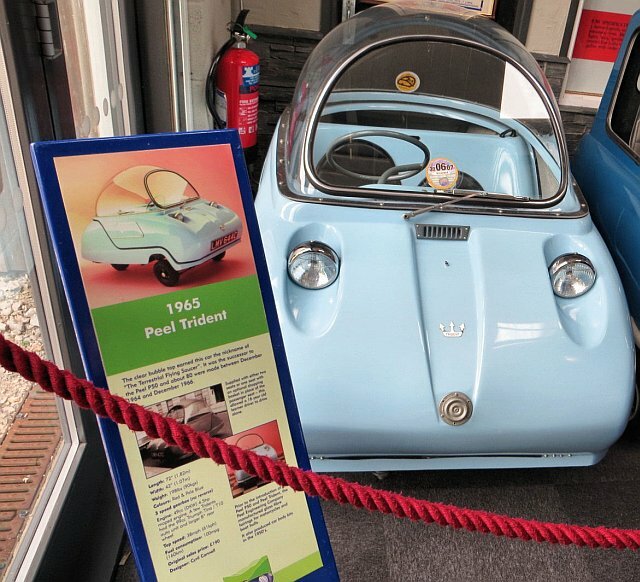 1965 Peel Trident Bubble car at the Lakeland Motor Museum in summer 2014. Photograph by author. Invacar Limited was a British manufacturer of road-legal three-wheeler vehicles for disabled drivers, funded by a contract with the Ministry of Pensions, founded in 1951. Many of their users would initially have been former servicemen injured in the Second World War. For decades, from 1952, disabled people in the UK were given their turquoise, three-wheeled cars. They were issued for free and gave independence to people who otherwise couldn’t leave home easily. The vehicles were known by the brand name Invacar, or more informally as “Noddy cars”. Most seemed to have been coloured “Ministry Blue”. The company was founded by Bert Greeves and diversified into motorcycles known as Greeves Motorcycles. The company’s factory was near Southend on Sea in Essex. The company ceased trading following a fire in 1977 and the withdrawal of the ministry contract following a move to convert ordinary cars rather than providing special cars for the disabled. In 2003 all Invacars owned by the government were recalled and scrapped because of safety concerns and few remain today. The Greeves Motorcycles name has since been revived but no information is given about country of origin on their website so I assume they are foreign made. There is a video about Invacars here. The closure of the British Motoring Corporation (BMC) and its successors (including British Leyland) in 2005 meant the end of mass car production by British-owned manufacturers and the loss or move to foreign ownership of many well known marques (as well as the best-selling mini which is now owned by BMW) including amongst others: Wolseley; Lanchester; Leyland Motors (commercial vehicles, buses and trolley buses) – Leyland Trucks now belongs to American truck manufacturer PACCAR and still make trucks in the UK (which are sold under the DAF name) – Leyland Bus has now gone. The Leyland logo continues to be used by Ashok Leyland (commercial and military vehicle maker) in the sub-continent. Ashok Leyland are now owned by London based Indian company Hinduja and they also own bus maker Optare who make buses in the UK; Daimler; Riley; Standard Motor Company; Rover; Austin (founded in 1905, merged in 1952 with Morris Motors Limited in the new holding company British Motor Corporation (BMC); Morris; Vanden Plas (a coachbuilders originally know for their work particularly for Bentley, but also Alvis, Lagonda, Rolls Royce and later Daimler and for building bodies for the Austin Princess – later the company focussed on car interiors, but they closed down in 1979 – they had a factory near Hendon in London known as the Kingsbury Works); Alvis (which as a military equipment maker was eventually acquired by BAE – car production stopped in 1965); MG (created by Morris and now owned by the Chinese SIAC – Shanghai Automotive Industry Corporation – see above); Triumph (Triumph Motor Cycles is now a separate company and still going); Jaguar (now Indian owned); Land Rover (now Indian owned); Austin-Healey (created by Austin); Scammell; Bristol Commercial Vehicles; Coventry Climax; Eastern Coach Works; Leyland Tractors (originally called Nuffield Tractors); LDV (formerly Leyland DAF Vans); Marshall Tractors. Unipart continue on a smaller scale – see above. The Pressed Steel name is no longer used. German company BMW now own the Mini name. Engines for the BMW Mini are now produced in Birmingham, whilst body pressings are made in Swindon and the Mini Hatch/Hardtop, Clubman, Convertible, Coupe and Roadster are assembled at BMW’s Plant Oxford in Cowley, England, and the Countryman and Paceman are assembled by Magna Steyr in Austria. The Countryman is also assembled in India specifically of the Indian market and in Malaysia and Thailand. The British Leyland Logo. This is a logo for Leyland Motors Ltd.
An Austin Montego Countryman estate car. 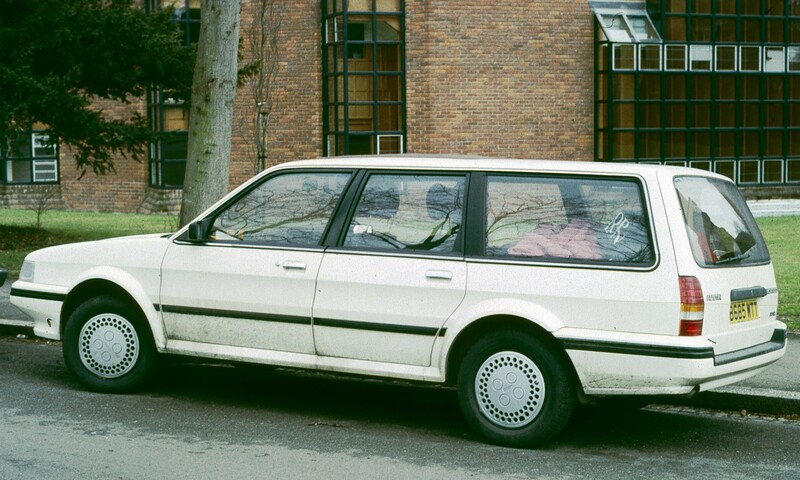 The Austin Montego was a British made car that was produced by British Leyland / Rover from 1984 until 1995. Photograph from 1984. A 1983 British made Austin Mini Metro Automatic 1.3, photographed in 2018. 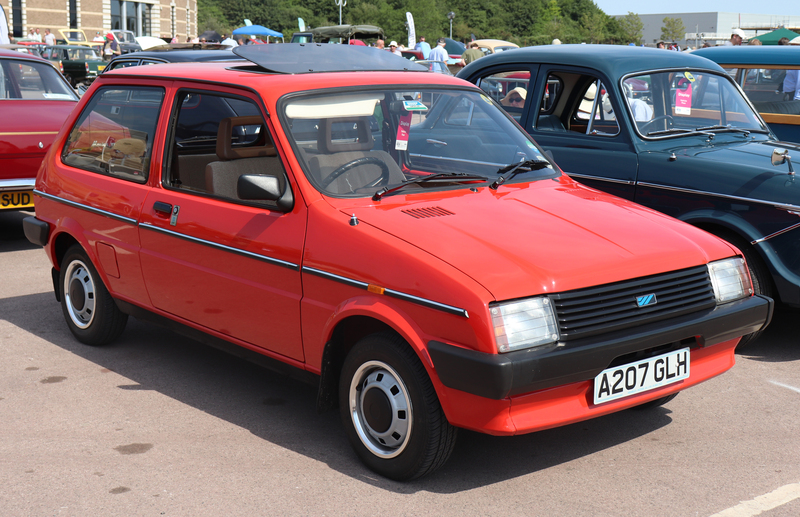 The Metro was produced from 1980 to 1998. 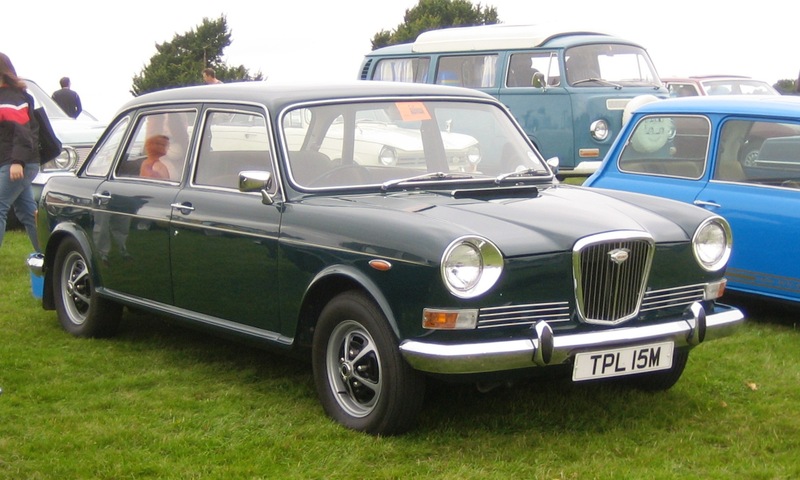 A c.1972 British made Wolseley Six, photographed in 2008. A Mini and a VW T2 are in the background. 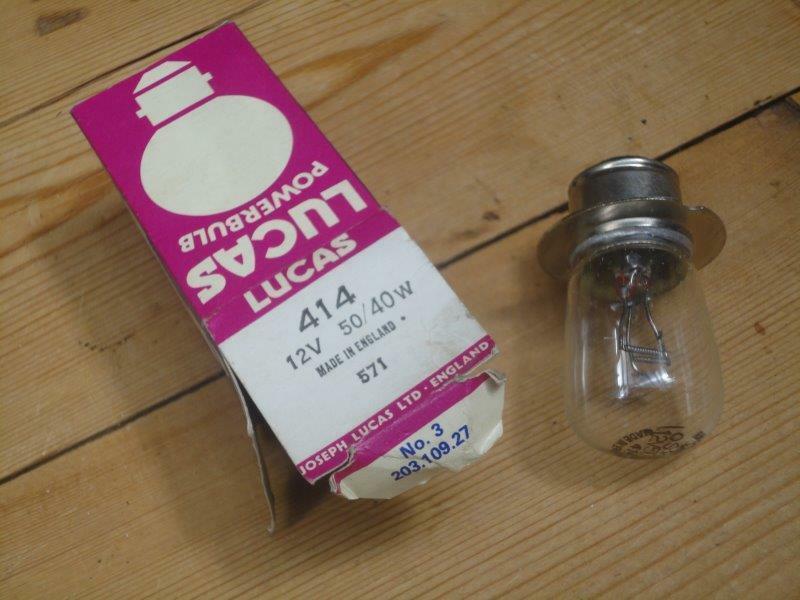 Lucas Industries plc was a well known Birmingham-based British manufacturer of motor industry and aerospace industry components, particularly well know for its aftermarket parts for motor vehicles. The name continues to be used under licence but as far as I know all their Uk factories have now closed down and none of their products are British made. The Mini Scamp mentioned above is possibly not connected to the Scottish Aviation Scamp. 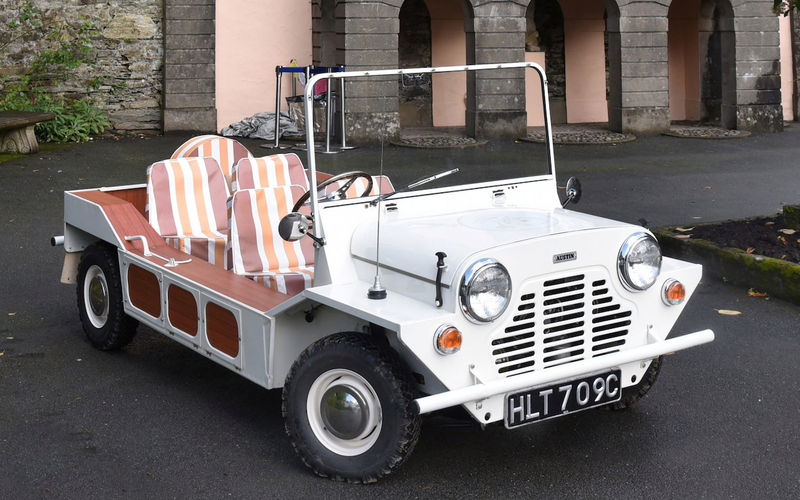 The Scottish Aviation Scamp was a tiny electric car produced for a short while in the mid 1960s by Scottish Aviation, not dissimilar in looks to the Peel P50. Scottish Aviation went on to become part of British Aerospace now BAE Systems. The Tug. Made in Britain. Triumph Motorcycles have six factories. Two of these factories are based in Hinckley in the UK, three are in Chonburi, Thailand and one is n Manaus, Brazil. 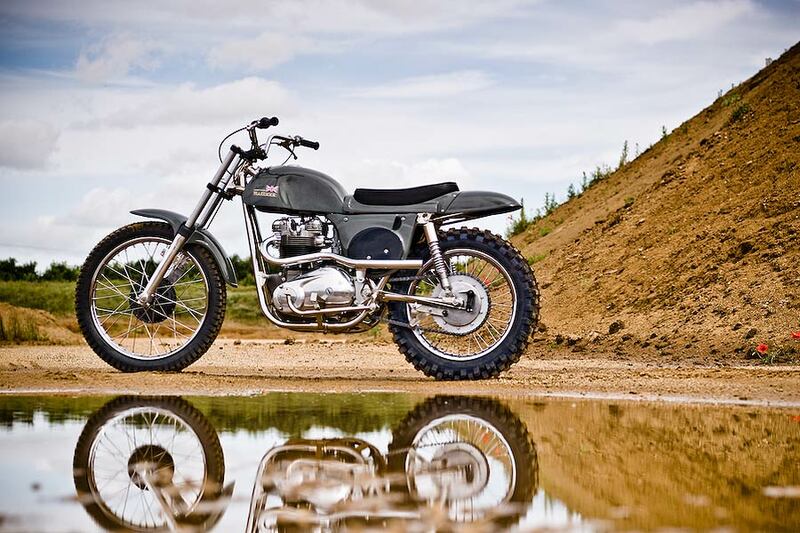 So, SOME Triumph motorbikes are made or at least assembled in the UK. It is not clear how (or even if) you can tell where a particular Triumph bike was assembled and where the parts were made. 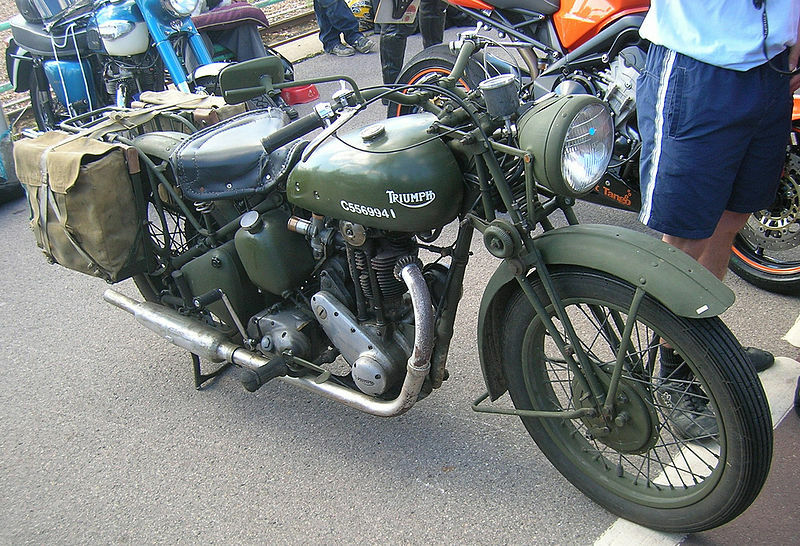 An old Triumph 3HW 350cc motorbike. These were made at Meriden in the West Midlands from 1942. Photographed June 2010. 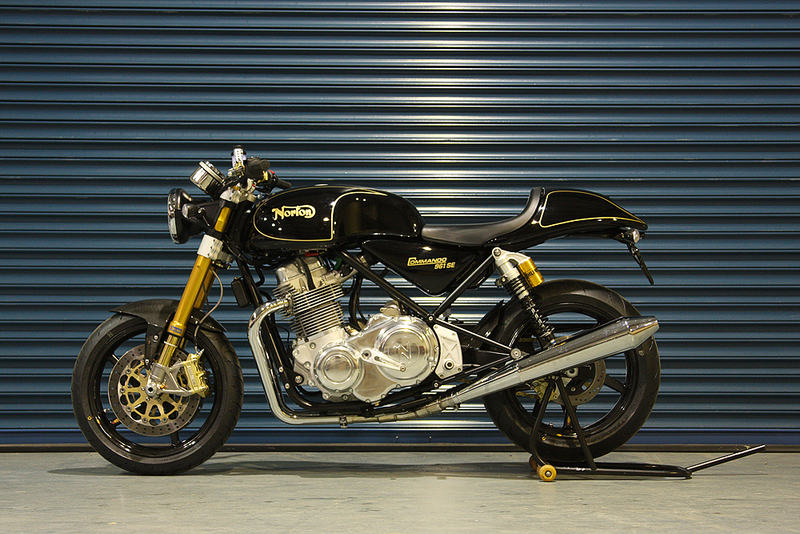 Norton Commando 961SE, January 2010. Métisse Steve McQueen Desert Racer. Built in England. THE GLADSTONE NO.1 Motorcycle. Built in Britain. The Ariel Motor Company Ltd (see above) Ace motorbike uses a Honda engine but is made in somerset at their factory. British Family discuss Ariel motorcycles here. Brough Superior motorcycles, sidecars, and motor cars were made by George Brough in his Brough Superior works on Haydn Road in Nottingham, England, from 1919 to 1940. From 2013 the name was revived for a new motorcycle, but unfortunately for British history and industry it is being made in France. T. E. Lawrence (AKA Lawrence of Arabia) sadly died from injuries sustained when he crashed a Brough Superior motorbike in Dorset. 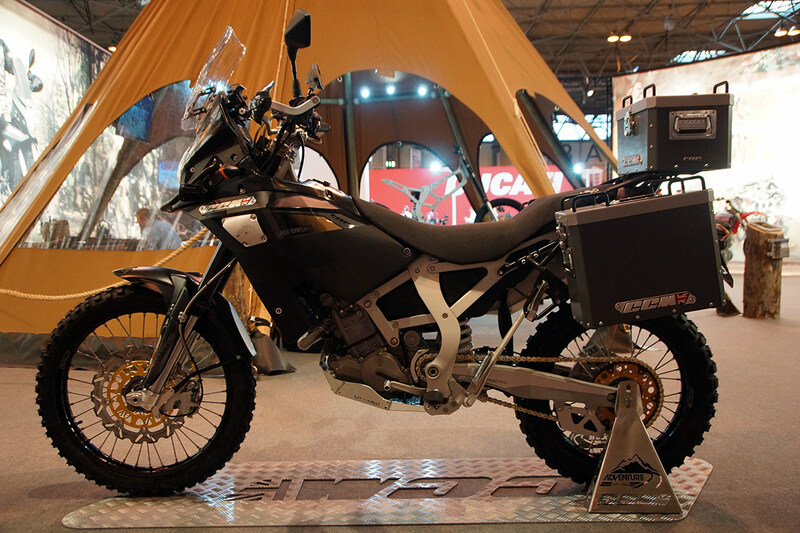 CCM Motorcycles GP450 Adventure bike. Douglas was a British motorcycle manufacturer from 1907 based in Kingswood, Bristol. The company also built a range of cars between 1913 and 1922. The Westinghouse Brake and Signal Company Ltd bought Douglas out and production of Douglas Motorcycles ended in 1957. In 1951 Douglas started production of Piaggio licensed Vespa scooters in Bristol, with a market to include some Commonwealth countries as well as the UK. While motorcycle production was stopped in 1957, Vespa production in Britain continued until 1965. Douglas Vespa scooters had a high percentage of content manufactured by Douglas or by UK supply companies. Douglas continued to import Vespa scooters into the UK and later imported and assembled Gilera motorcycles until closing down in 1982. There are more now defunct British motor scooter and moped manufacturers listed with photos on this site, which as well as Douglas included the Swallow Coachbuilding Company of Walsall, Brockhouse Engineering (Southport) Ltd, DKR Scooters Ltd of Wolverhampton, Cyclemaster of Byfleet, Surrey (who made the Piatti scooter and the Cyclemaster pedal cycle engine attachment. Cyclemaster may be the same company as Britax who took over making the Cycylemaster from EMI), the Dayton Cycle Company, the Sun Cycle & Fitting Company of Birmingham who also made bicycles and motorcycles, Phoenix scooters, the Triumph Engineering Company, BSA, and Excelsior scooters. Many of these mopeds and scooters used Villiers engines (see below). There’s a brief history of mopeds here, which discusses the Cyclemaster, the Fizzy (the Japanese Yamaha FS1-E) and the Tomos Classic XL45 amongst other machines. Modern moped and scooter manufacturers are all foreign. Piaggio are Italian and their brands include brands: Piaggio, Vespa, Gilera, Aprilia, Moto Guzzi, Derbi, and Scarabeo, with many of their scooters now being made in Vietnam. Austrian company Puch were broken up, with some parts going to Piaggio, and they no longer make mopeds. Tomos, once a licensed producer of Puch mopeds, are still going strong and still making their mopeds in Slovenia. “Renowned for their high quality manufacture Tomos have been based in the Slovenian city of Koper since the company was founded there in the 50’s. Today the contemporary Tomos machine, with its instantly recognisable shape and reputation for ease of riding and maintenance is totally suited to city riders and country dwellers alike.” Tomos also distribute some Taiwan-owned/PRC-made scooters and electric scooters and electric bicycles under their own brand names. Tomos GB Ltd is the exclusive UK and Ireland concessionaire for Tomos. French company Peugeot make some scooters, but no longer seem to make mopeds. Yamaha, Honda, Kawasaki, and Suzuki are the big four Japanese motorbike, moped and scooter manufacturers, famed for the reliability of their scooters and motorbikes (and cars) and now producing bikes in Japan and elsewhere in the world. 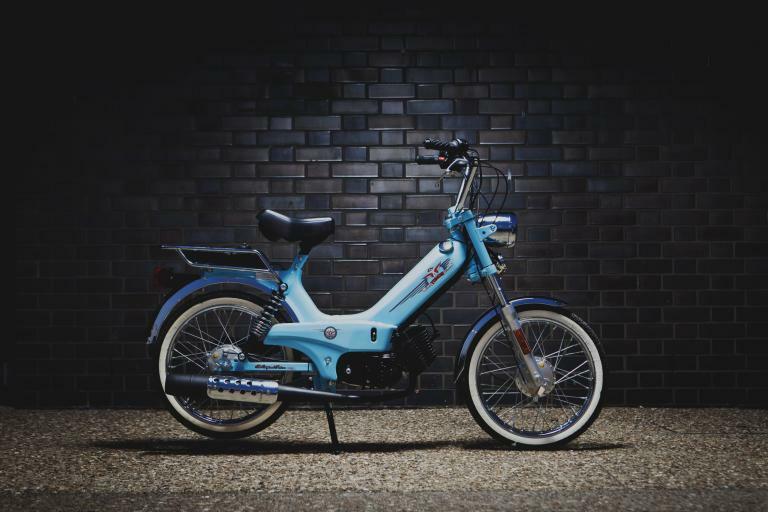 British brands like AJS, Scomadi, Sym, Lexmoto, and WK Bikes bring Chinese motorbikes and scooters to the UK and there are many other Chinese moped, scooter and motorbike manufacturers too. Tomos Classic XL45 50cc Moped, made in Slovenia. 2018. Britain was once the world’s greatest motorcycle (and cycle) producer, but many top brands like AJS (the revived AJS brand motorbikes and scooters are now made in China), BSA, Vincent, Royal Enfield, Sunbeam, and Matchless (Matchless London now uses the Matchless name and logo to sell foreign made clothing and accessories and a foreign made motorbike) have now sadly either been sold off or have disappeared. Associated Motor Cycles (AMC) was a British motorcycle manufacturer and the parent company for the Matchless and AJS motorcycle (AJS had previously made cars too) companies. It later absorbed Francis-Barnett, James, and Norton before incorporation into Norton-Villiers. 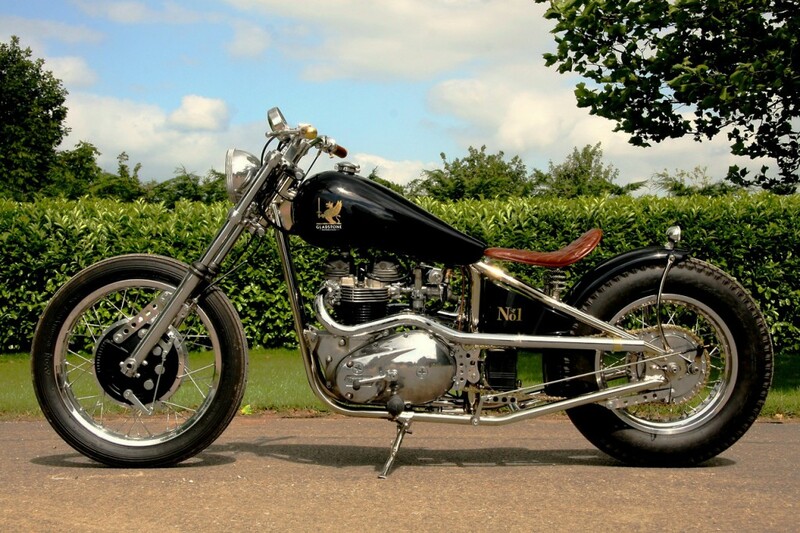 Norton-Villiers was a British motorcycle manufacturer formed in the 1960s following the collapse of AMC and it was later combined with the remnants of BSA Triumph to form Norton-Villiers-Triumph. Norton Villiers Triumph (NVT) was a British motorcycle manufacturer, formed by the British Government to continue the UK motorcycling industry, but the company eventually failed in 1978. Some of the various names they owned by NVT have since been revived. There was talk in 2015 of a new Indian owned British Royal Enfield factory but that does not appear to have actually happened. Villiers Engineering was a manufacturer of motorcycles and cycle parts, including engines. In the early 1960s, the company was taken over by Manganese Bronze Holdings, and in 1966 together with AMC became Norton-Villiers, and in 1972 merged with the BSA group to become Norton-Villiers-Triumph, which eventually went into liquidation in 1978. For British made motorcycle clothing and accessories, please see my clothing article by clicking on the hyperlink. Pro-Street Cycles motorcycle clocks, custom parts, and accessories for motorbikes are distributors of foreign made motorbike parts but also a manufacturer of their own custom parts and accessories which are made in the UK. Their UK made accessories include motorcycle billet clocks, grips, covers, shift linkages, oil dipsticks, etc and UK made part are labelled as such on their website. They also own the websites Time4Bikes and Clocks for Cars which sell British made motorcycle clocks and thermometers and British made Clocks that can be fixed almost anywhere you may have need for a clock in a car. The mechanisms in their clocks are made by Seiko abroad. 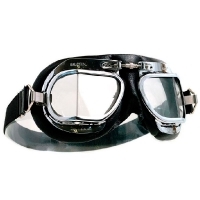 Mark 49 Halcyon Goggles – Black Leather. Made in England. 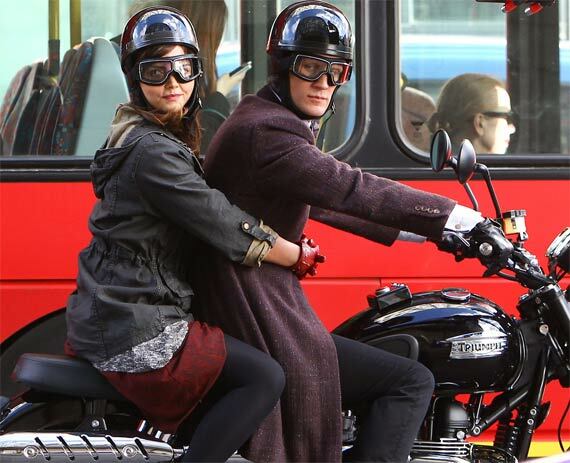 Dr Who (Matt Smith) and Clara (Jenna Louise Coleman) in The Bells of Saint John, March 2013, riding a Triumph and wearing the Davida Classic helmet (sadly the goggles are French made). For British made motorcycle gloves please see my article on British made gloves. For British made security chains, ground anchors and padlocks for securing motorcycles, quad bikes, bicycles, cars, caravans, boats, trailers and so on, please click here. Moto-Lita supplied the AC Car Company in Thames Ditton during the 1960’s. Now they offer wheels both for the original and reproduction vehicles. Lincon Batteries has a history that goes back to 1908 and has been manufacturing batteries in the Southend area for well over 60 years. “All Lincon’s 6v Hard Rubber Batteries are hand made in Britain, primarily for the Classic Car market.” Lincon Batteries Ltd is a division of Shield Batteries Ltd. Battery Charged Online is the online trading division of Shield Batteries, battery manufacturers and distributors. Shield Batteries has a history that goes back to 1910. Shield classic car batteries are UK made. Other items on the Battery Charged website, except Shield classic car batteries and Lincon classic car batteries, are foreign made. A made in England label on an Autostyle car floor mat. 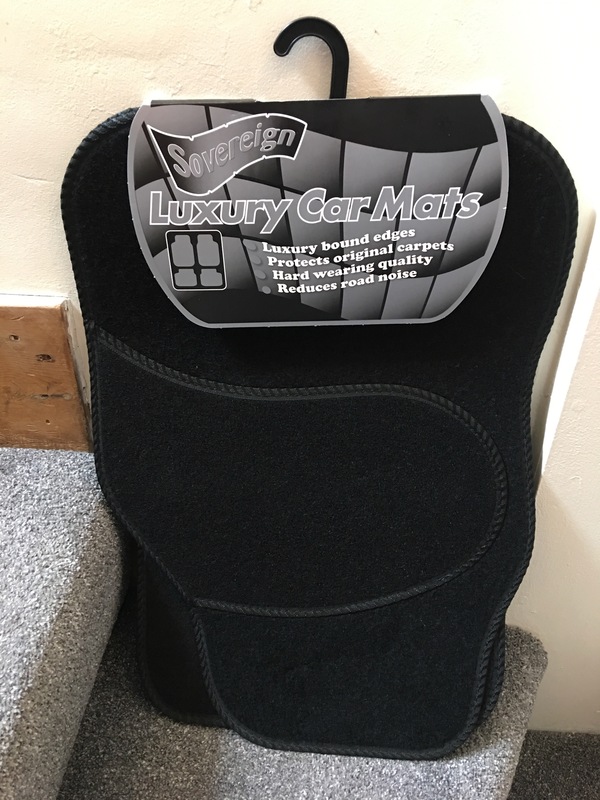 The Sovereign 4 universal carpet car mat set I got in Poundland (for £5!) in May 2018, pictured below, was made in England. I don’t know who makes these but they are also available online for example at eBay. 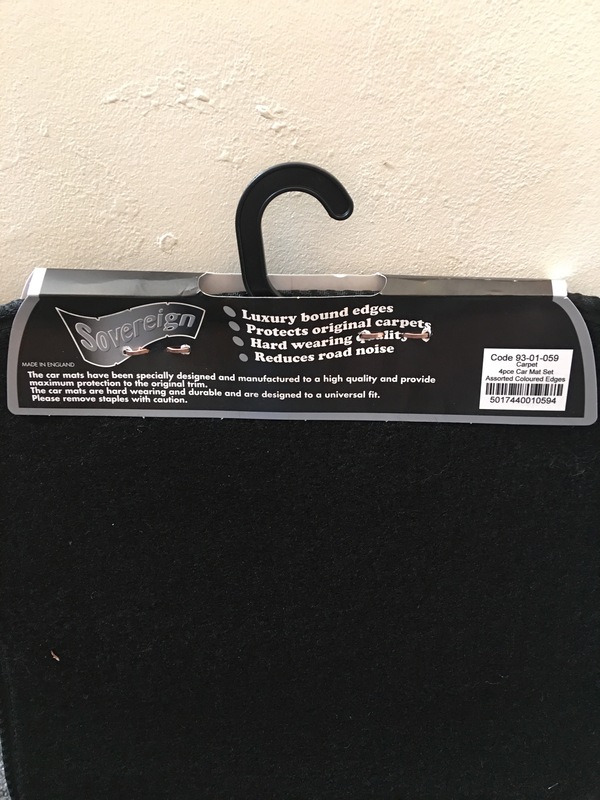 Sovereign 4 universal carpet car mat set. Made in England. Photograph by author 19 May 2018. Sovereign 4 universal carpet car mat set. Made in England. Photograph by author 19 May 2018. Rear label view. 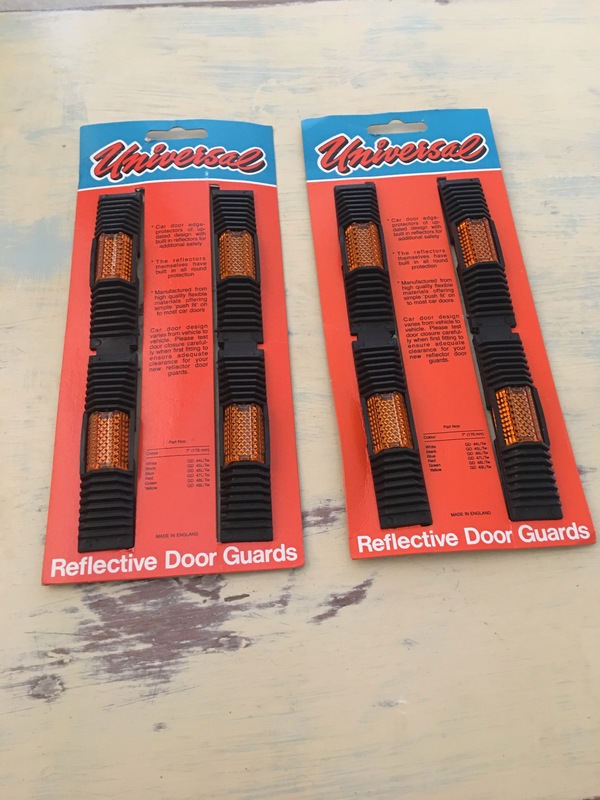 Universal Reflective Door Guards are made in England, but I can’t find any information relating to this manufacturer on the internet, so I don’t know if they are still making these. I got some in December 2016 and they are just the job, fitting well and easily, looking good and high quality. I got mine on eBay. Universal Reflective Door Guards. Made in England. Car door edge protectors with built in reflectors. Push fit. Fits most vehicles. Photograph by author. 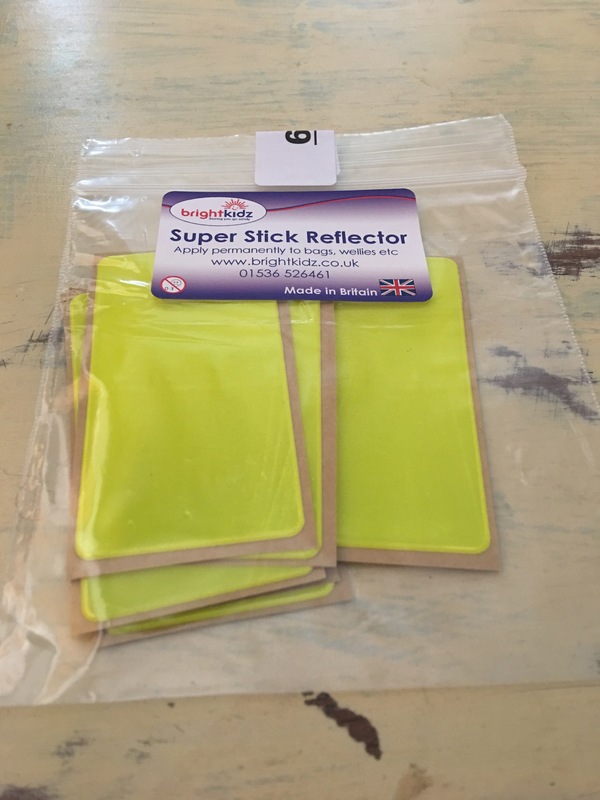 Brightkidz Super Stick Reflector. Made in Britain. Photograph by author. 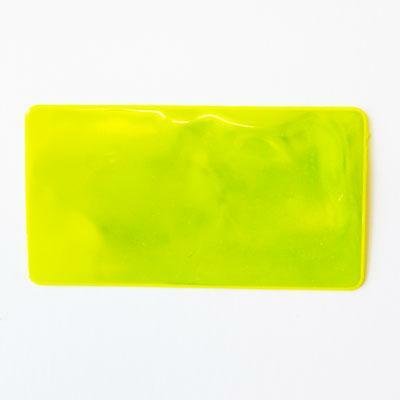 Brightkidz super stick reflector (day view). Size: 4cm x 7.5cm. Fluorescent for day visibility and reflective for night. Very sticky! Once stuck cannot be repositioned. Made in England. 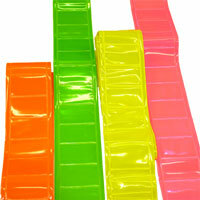 Brightkidz fluorescent, reflective sashes. Adult (or junior). Made in England. 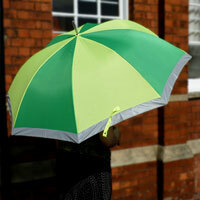 Brightlidz Umbrella, Golf (Adult). Made in the UK. 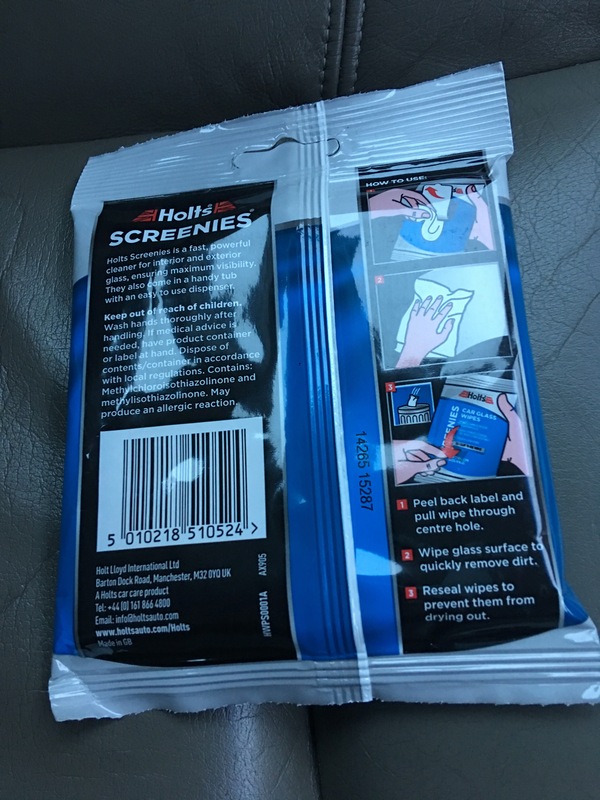 Holts Screenies Car Glass Wipes, for interior and exterier glass. Made in GB. Front of pack view. Photograph by author. 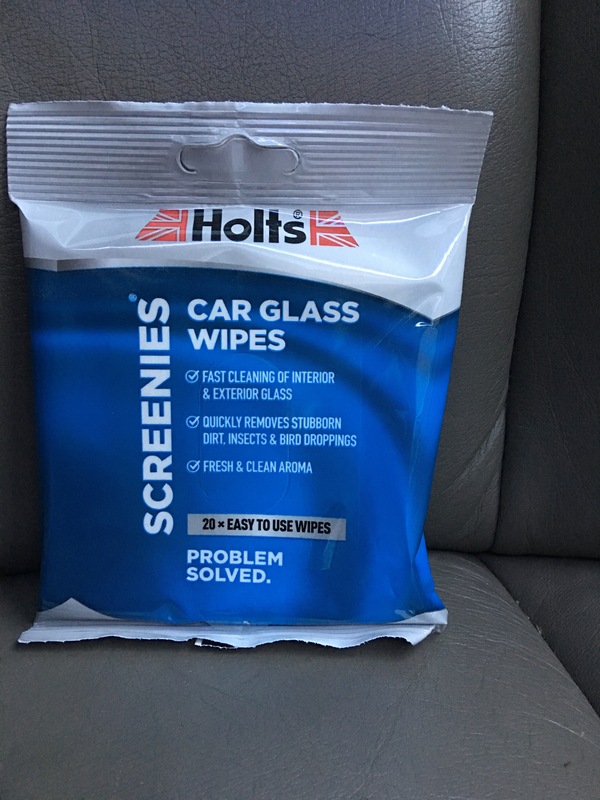 Holts Screenies Car Glass Wipes, for interior and exterier glass. Made in GB. Back of pack view. Photograph by author. Holts Tyreweld. Made in GB. On display in Tesco Flitwick 30 January 2017. Photograph by author. 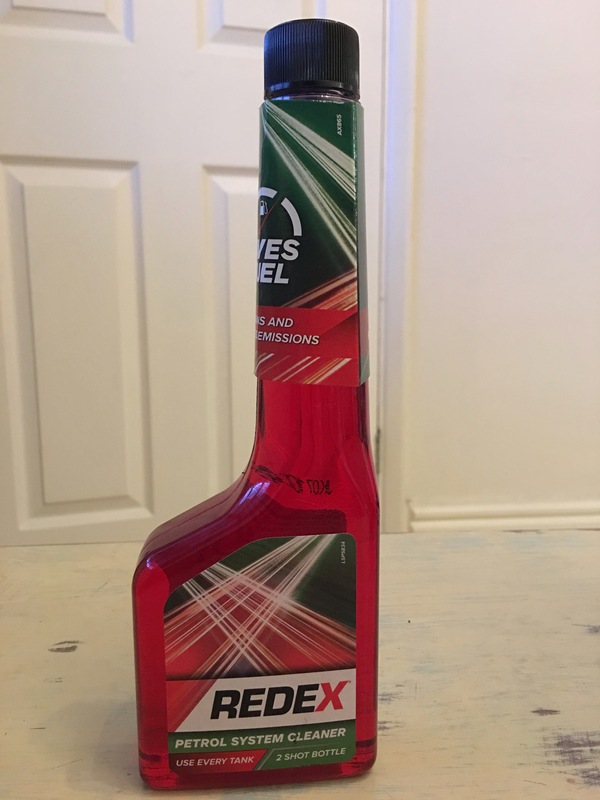 Redex Petrol System Cleaner. Made in GB. Photograph by author. Front view. Redex Petrol System Cleaner. Made in GB. Photograph by author. Rear label detail view. 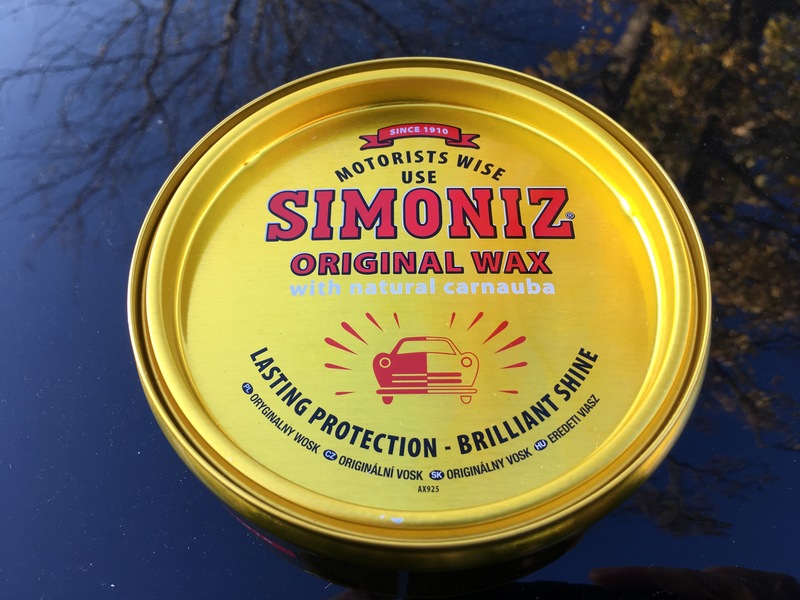 Simoniz Original Wax car wax 150g by Holt Lloyd International. Made in Great Britain. Photograph by author 18 November 2018. 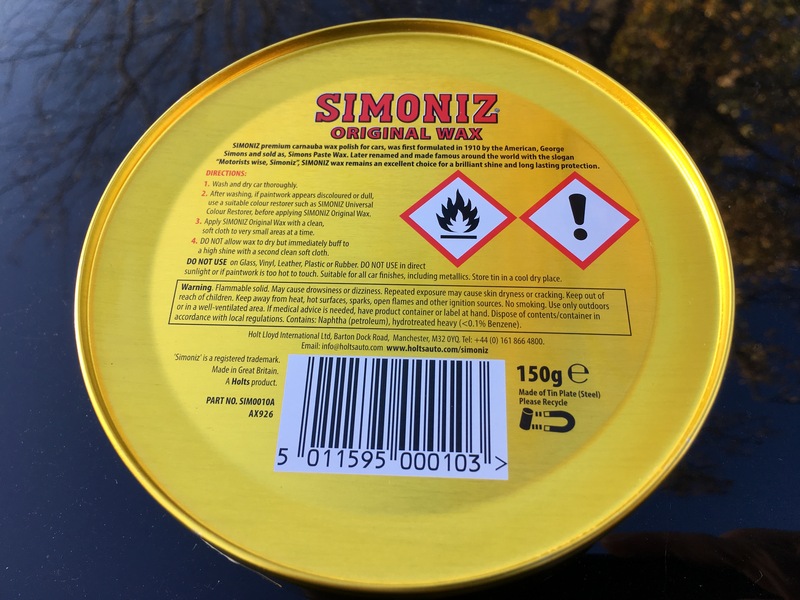 Simoniz Original Wax 150g by Holt Lloyd International. Made in Great Britain. Photograph by author 18 November 2018. Rear of tin label view. Autoglym, car care and valeting products display in a garage shop near Brackley. Note the words “Made in Great britain” on the bottom front of the bottles. Photograph by author. Tesco Screenwash. 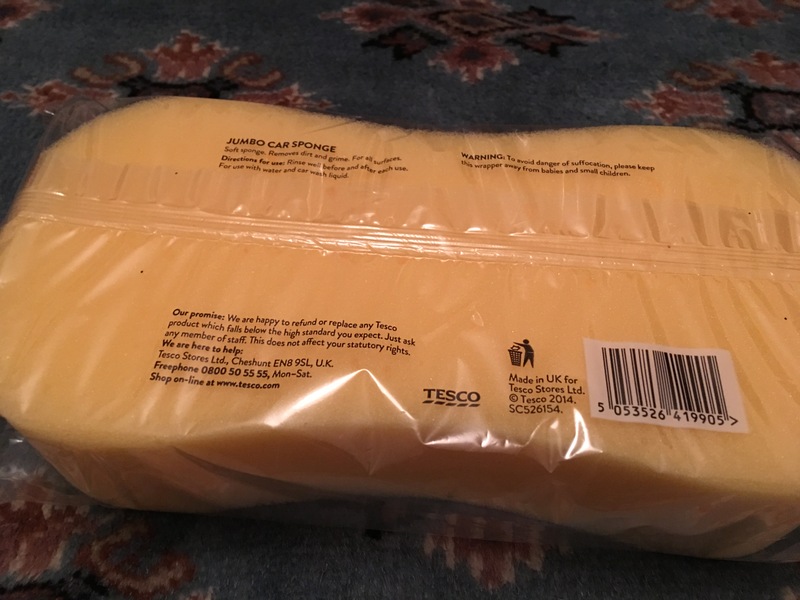 Produced in the UK for Tesco. Photograph by author. 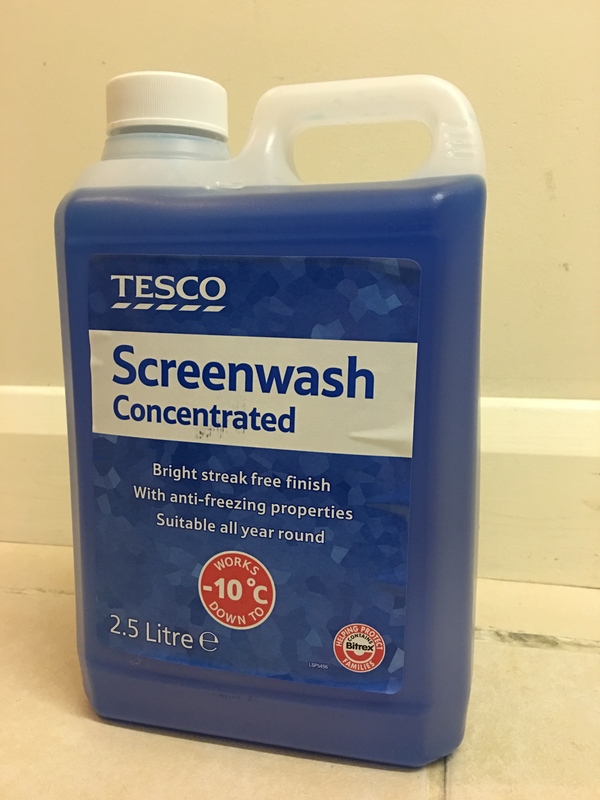 Tesco Screenwash. Produced in the UK for Tesco. Label detail view. Photograph by author. 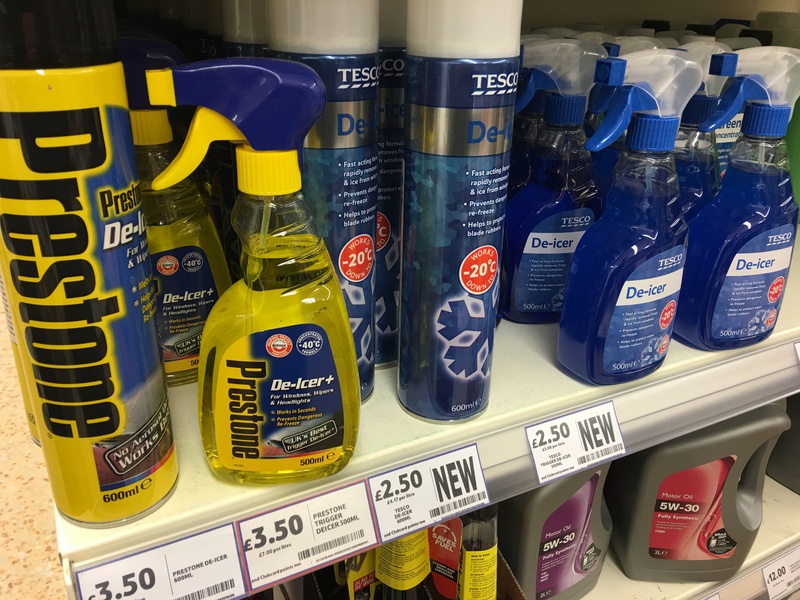 Prestone de-icer and Tesco de-icer (on the top self) on display in Tesco Flitwick. 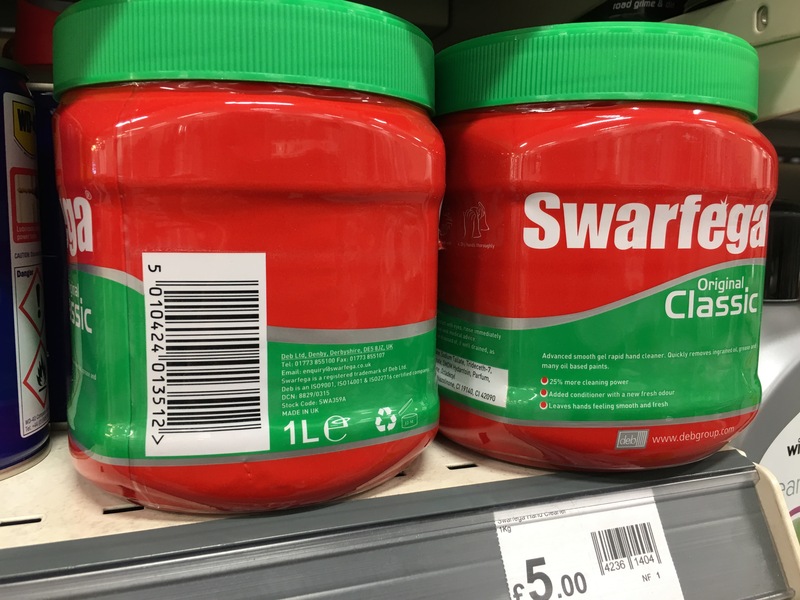 Both made in the UK. Photograph by author. 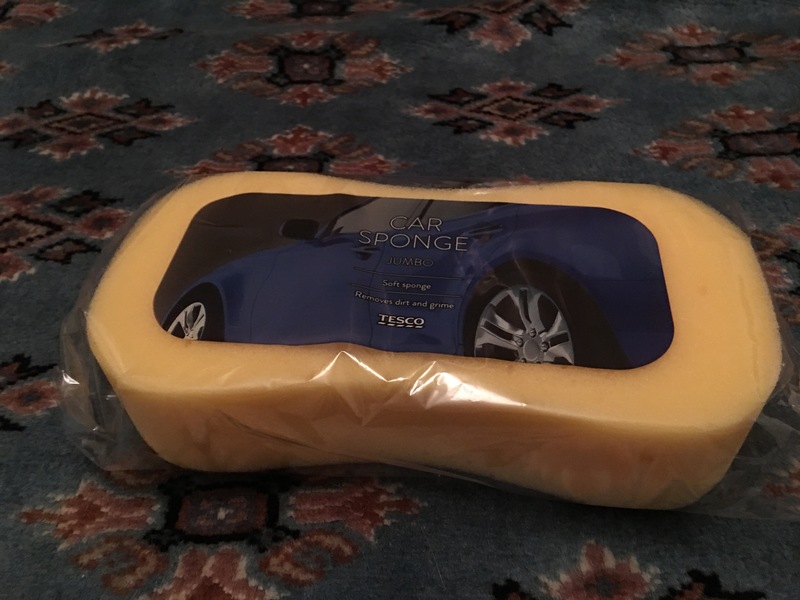 Tesco Jumbo Car Sponge. Made in UK. Front of packaging view. Photograph by author. 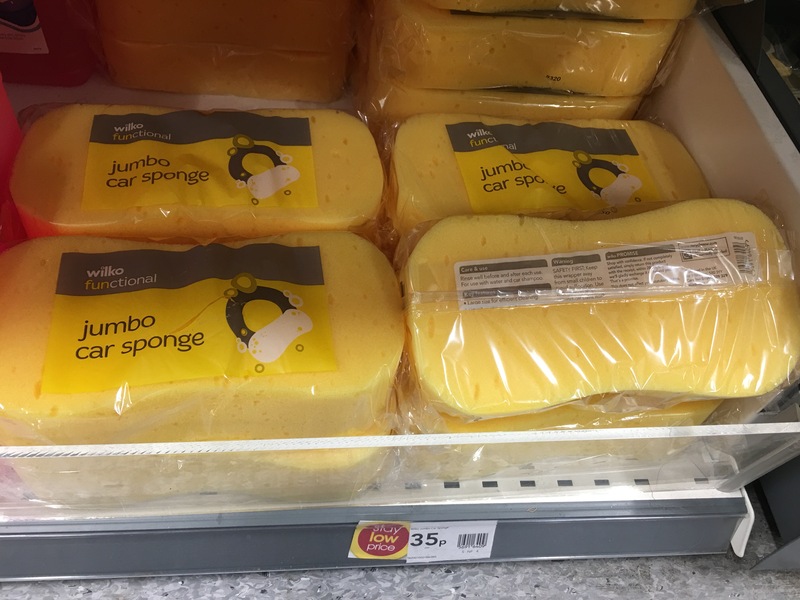 Tesco Jumbo Car Sponge. Made in UK. Rear of packaging view showing country of origin. Photograph by author. 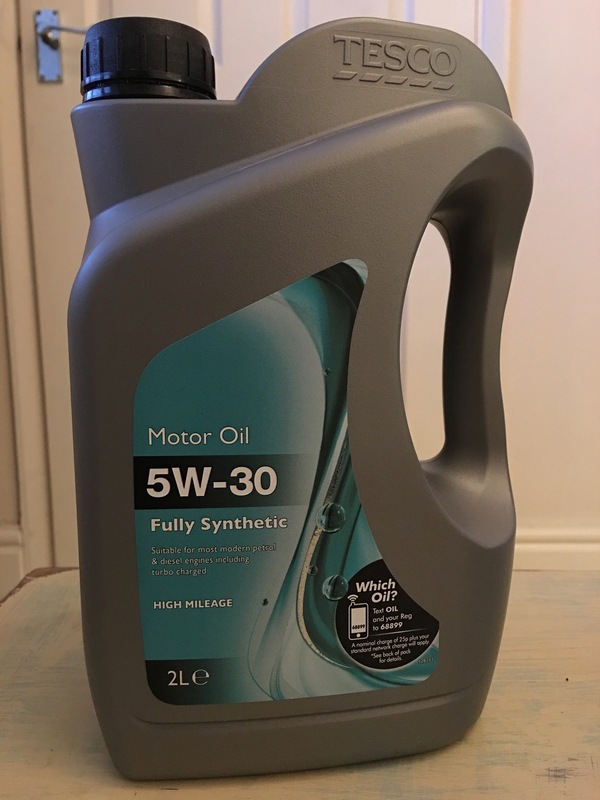 Tesco Motor Oil 5W-30 2L. Made in the UK. Photograph by author. Front view. 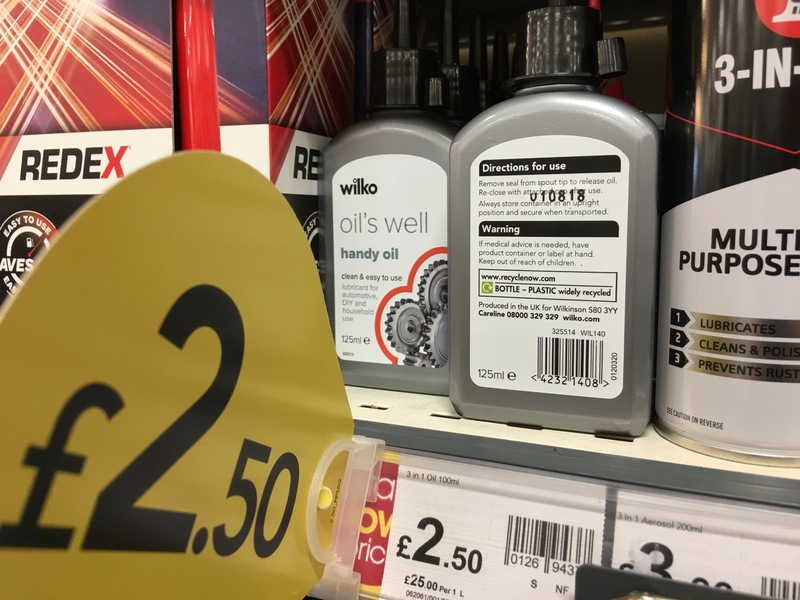 Tesco Motor Oil 5W-30 2L. Made in the UK. Photograph by author. Rear label detail view. 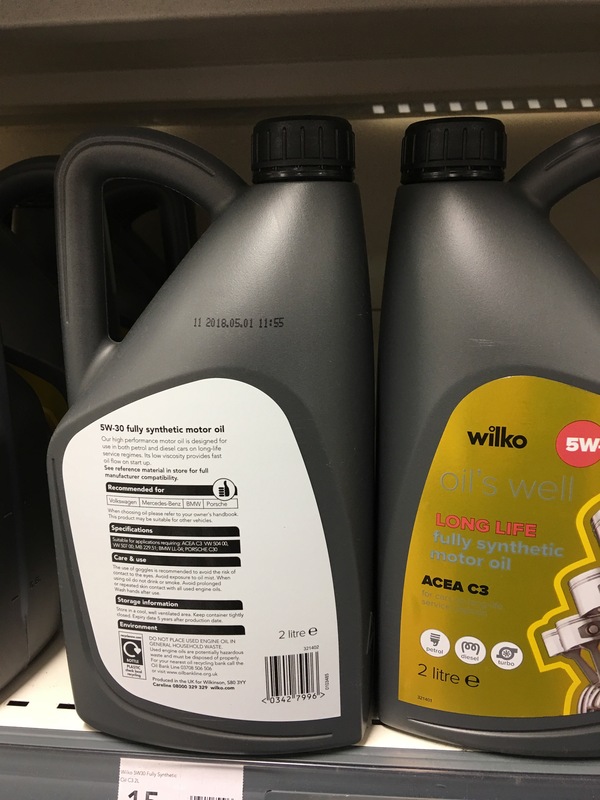 Wilko oil’s well motor oil. Made in the UK. On display in Wilko Staines-upon-Thames. Photograph by author 26 August 2018. 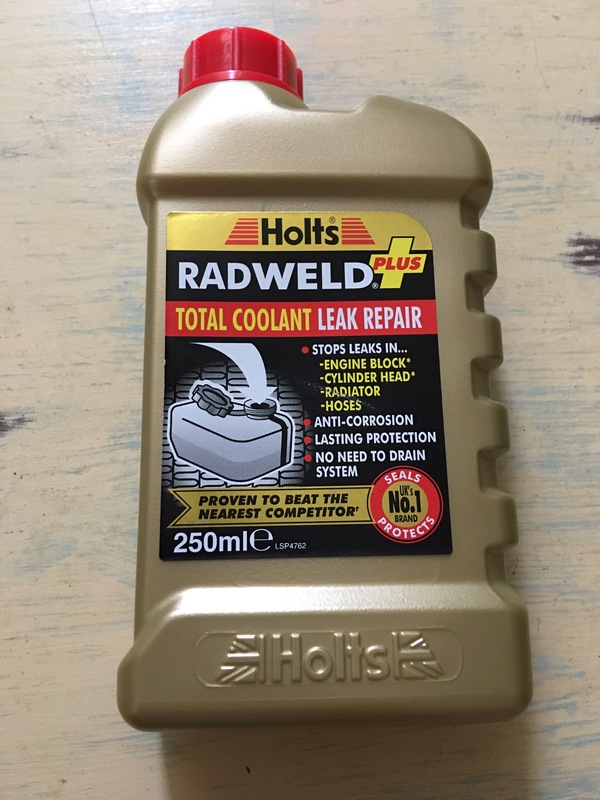 Oil’s Well Handy Oil 125ml lubricant 3-in1 oil for automotive, DIY and household use. Produced in the UK for Wilkinson. On display in Wilko Yiewsely 11 November 2018. Photograph by author. 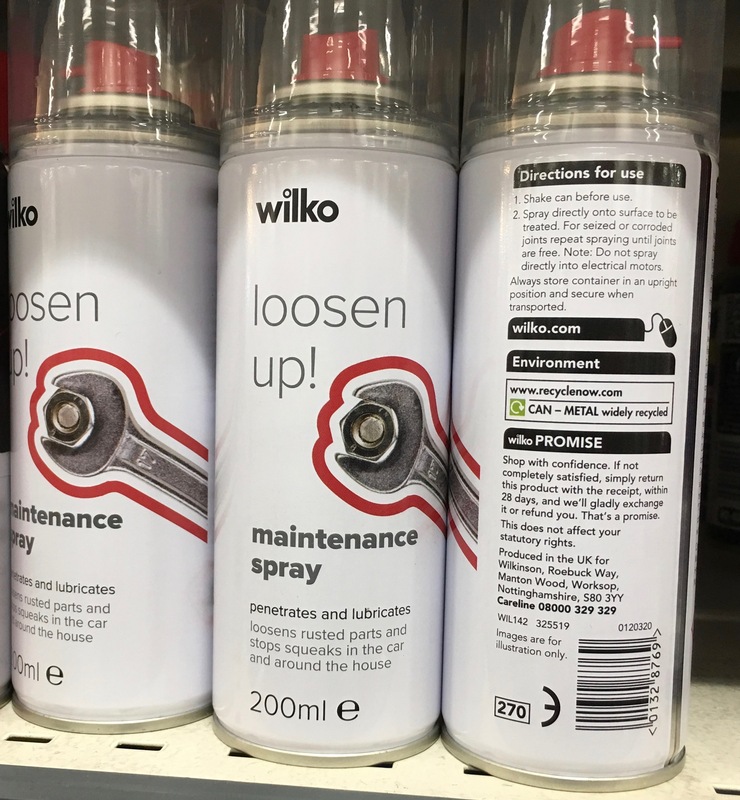 Wilko Loosen Up! maintenance spray for loosening up rusted parts and stopping sqeaks in the car and around the house. Produced in the UK for Wilkinson. On display in Wilko Yiewsley 11 November 2018. Photograph by author. 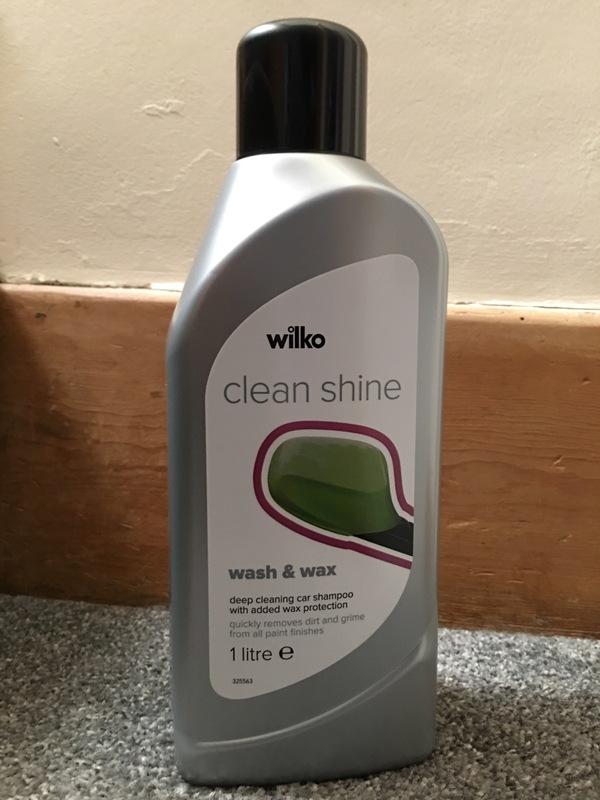 Wilko Clean Shine wash and wax car shampoo. Produced in the UK for Wilkinson. Photograph by author 11 November 2018. 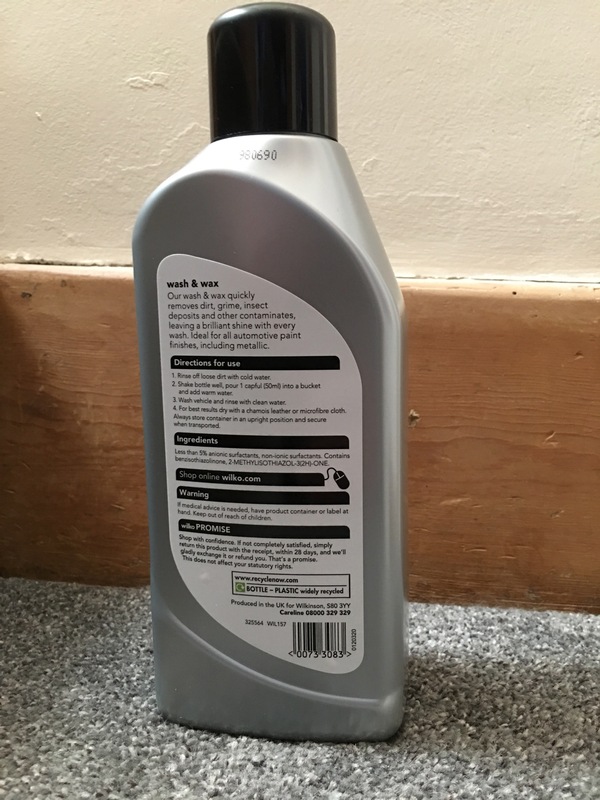 Wilko Clean Shine wash and wax car shampoo. Produced in the UK for Wilkinson. Photograph by author 11 November 2018. Rear of packaging label view. 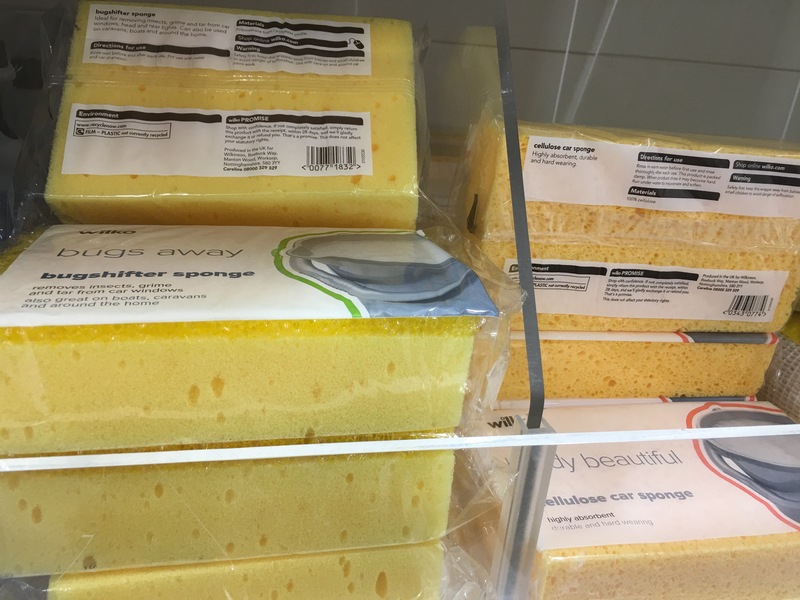 Wilko Jumbo Car sponge. Produced in the UK. On display in Wilko Staines-upon-Thames. Photograph by author 19 January 2019. Wilko Bugs Away bugshifter car sponge and Wilko cellulose car sponge. Both produced in the UK. On display in Wilko Staines-upon-Thames. Photograph by author 19 January 2019. Wilko turn right! 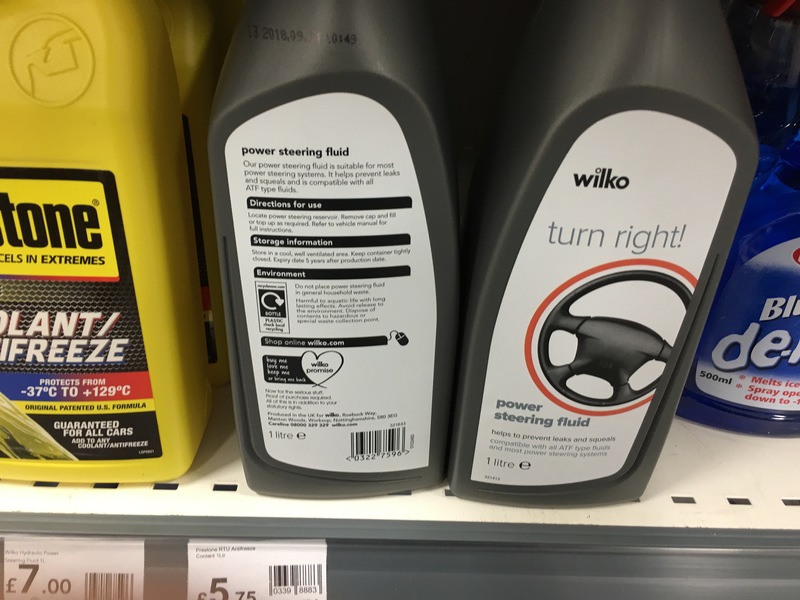 power steering fluid. Produced in the UK. On display in Wilko Staines-upon-Thames. Photograph by author 19 January 2019. Wilko mix it up! 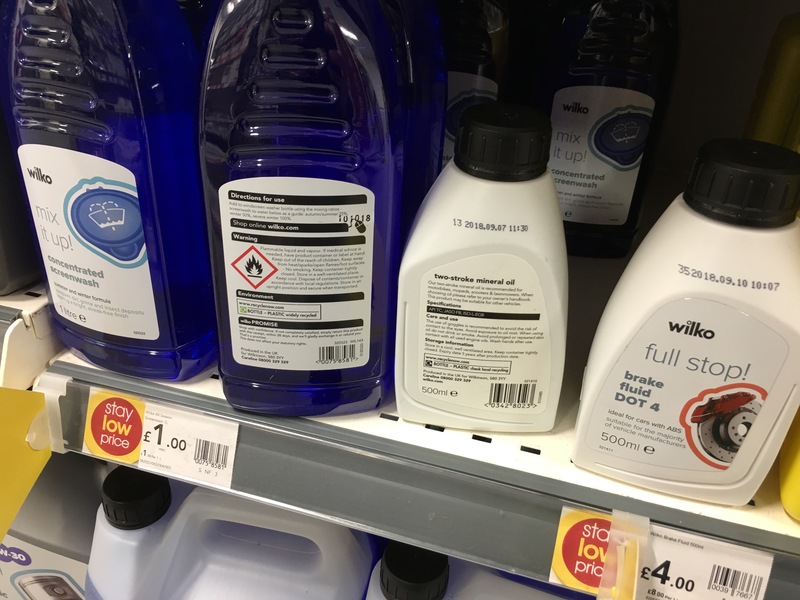 concentrated screen wash and Wilko full stop! brake fluid DOT 4. Both produced in the UK. On display in Wilko Staines-upon-Thames. Photograph by author 19 January 2019. 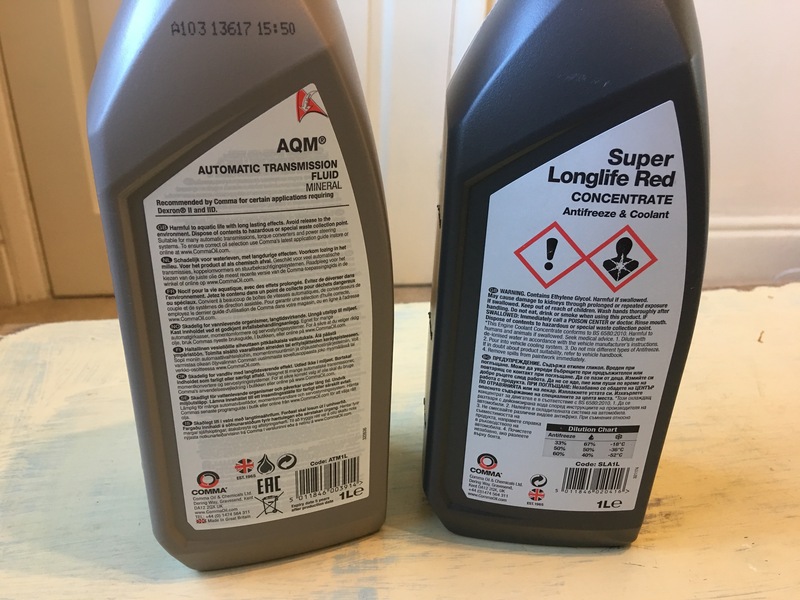 Comma automatic transmission fluid AQM, I litre. August 2016. Made in Great Britain. Photograph by author. Front view. 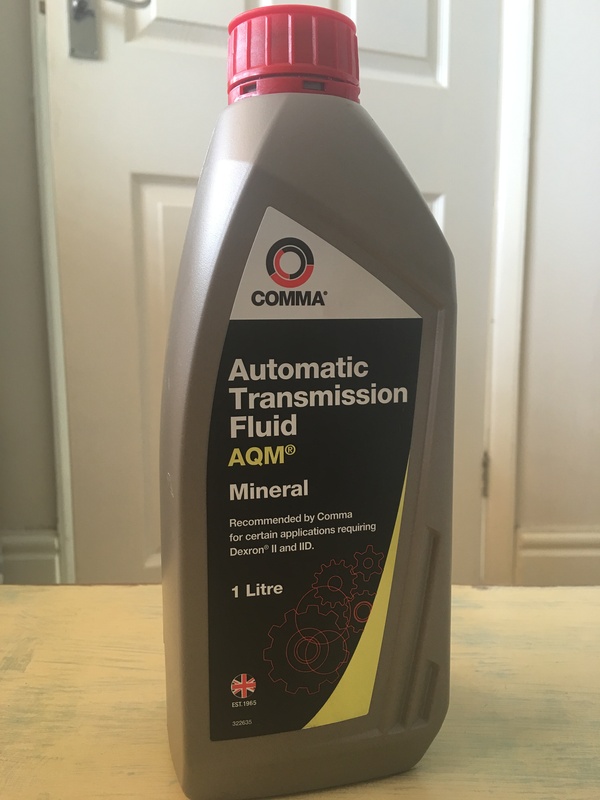 Comma automatic transmission fluid AQM, I litre. August 2016. Made in Great Britain. Photograph by author. Rear view with the words “made in Great Britain”. 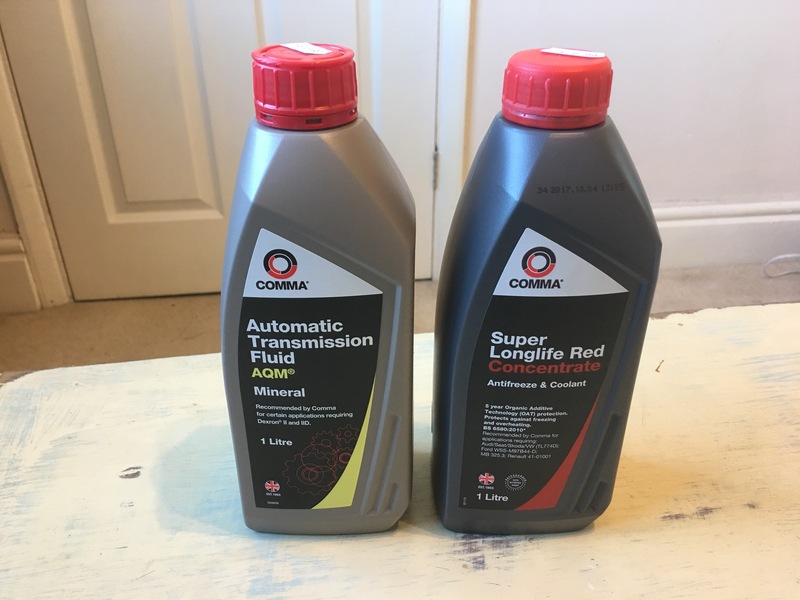 Comma automatic transmission fluid and Comma antifreeze and coolant. 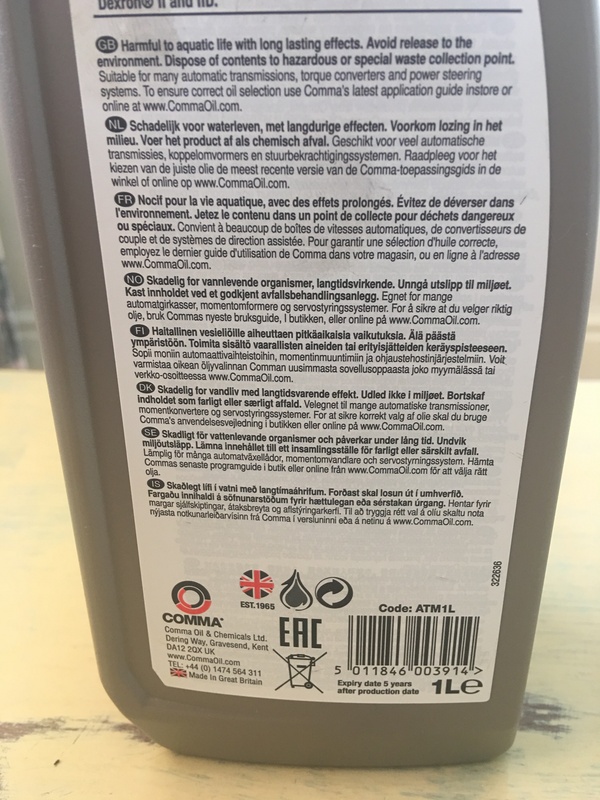 The automatic transmisision fluid states it is British made on the label, whereas the antifreeze and coolant does not state country of origin and is therefore probably foreign made. Photograph by author 23 November 2017. Front of bottles view. Comma automatic transmission fluid and Comma antifreeze and coolant. 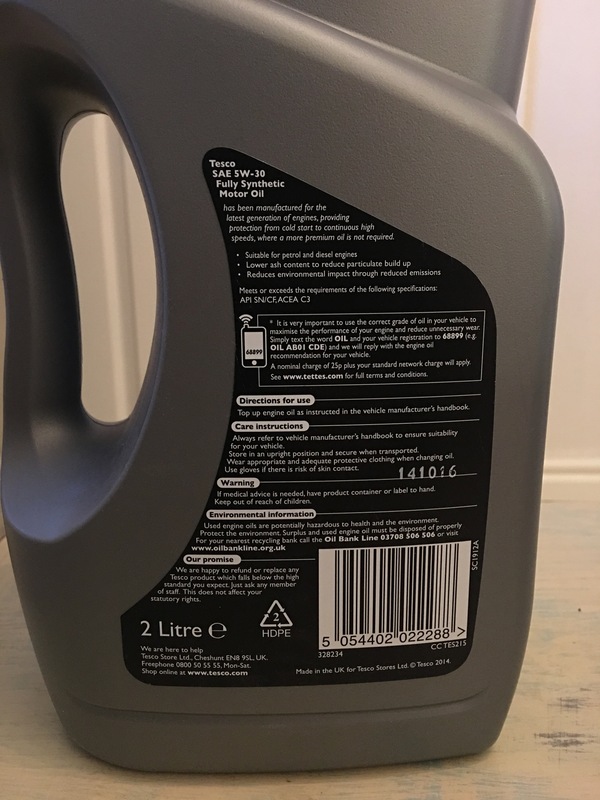 The automatic transmisision fluid states it is British made on the label, whereas the antifreeze and coolant does not state country of origin and is therefore probably foreign made. Photograph by author 23 November 2017. Rear label view. Duckhams, the British oil brand, is well known and was brought back on sale in November 2017 after an absence of 15 years from the market. Duckhams moved production from Hammersmith in London to Aldridge, Staffordshire in 1968. 1969 BP (British Petroleum) acquired the company. Oil giant BP today announced plans to sell Duckhams in 2011. Whether they ever did sell the company I am not sure. In 2000 BP acquired Burmah-Castrol and along with it the Castrol oil brand and seemed to favour the Castrol brand and Duckhams went out of production around 2012. The new Duckhams website completely fails to explain who owns the brand now or where it is made. Duckhams modern motor oil may well be made abroad. Their current range seems to be focussed on motor oil for classic cars. BP still own Castrol. Castrol was originally a brand of the Wakefield Oil Company. In 1966, Castrol was acquired by Scottish company Burmah Oil, which was renamed Burmah-Castrol. Burmah-Castrol was purchased by London-based multinational BP in 2000. BP had already acquired Duckhams in 1969. BP remains a major player in the oil industry, running oil pipelines, oil fields, petrol stations, petrochemicals plants, various well known brands and so forth in the UK and all over the world. BP Thailand produce both Duckhams and Castrol oils in Thailand. Whether either Duckhams or Castrol is still made in the UK too I don’t know. 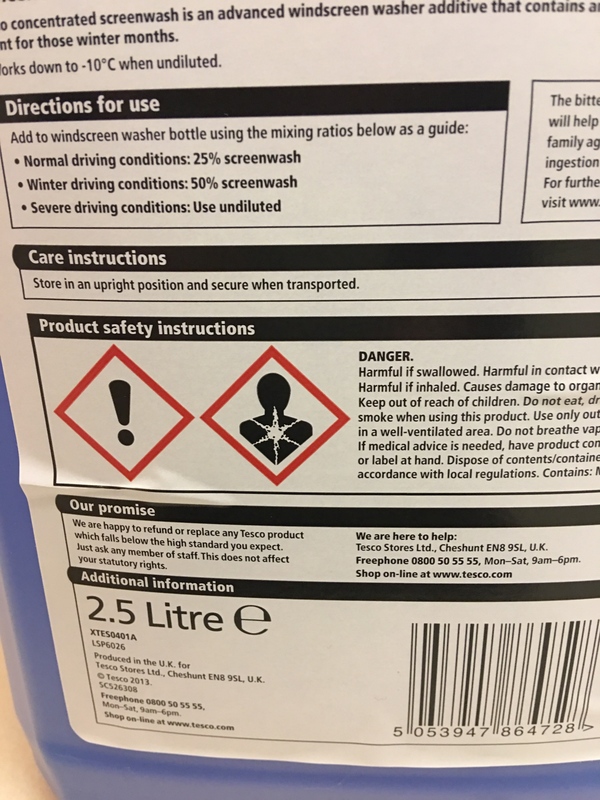 BP do not give this information on their website and both brands may well now be foreign made. 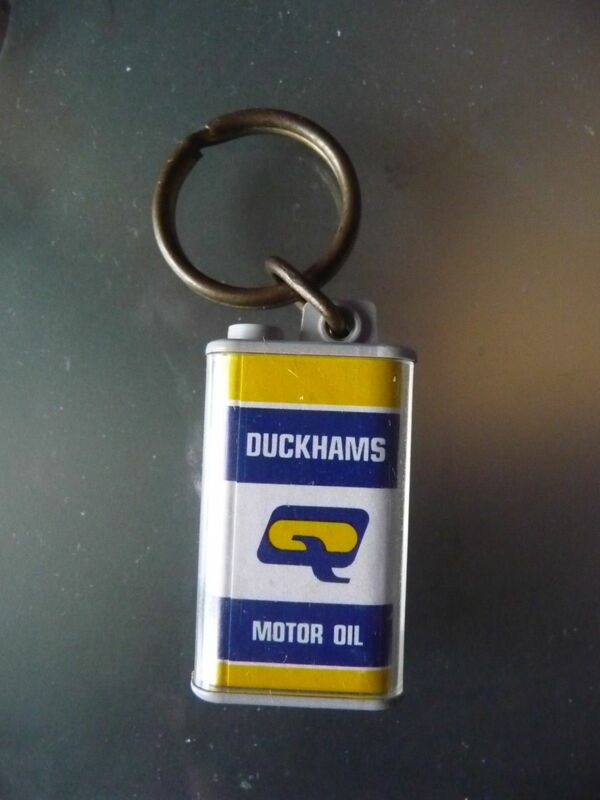 A clssic Duckhams Q oil can keyring 1960s/70s with brass ring. 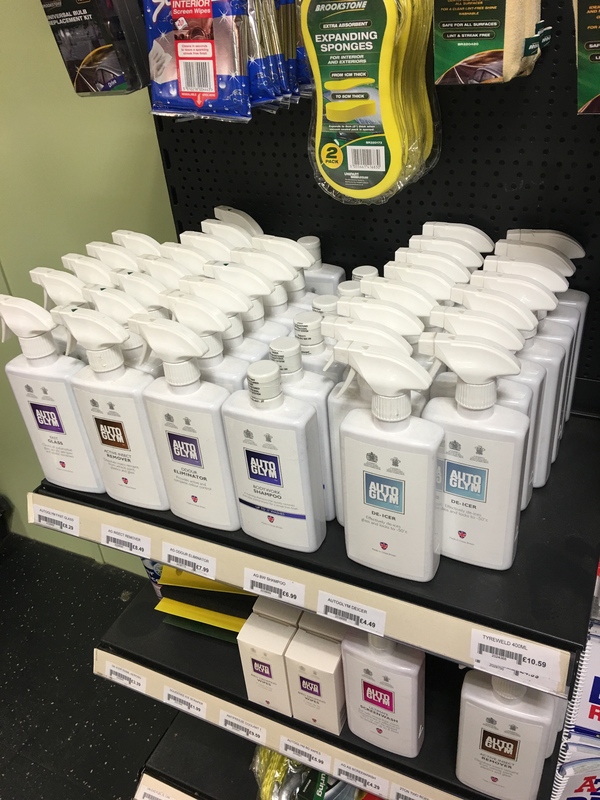 Tetrosyl Limited is a manufacturer and supplier of car care products and is the “largest independent oil blender in the UK”. Their brands include CarPlan, Triplewax, Bluecol and T-Cut. Founded in 1954, the company is still manufacturing in the UK. Of their T-Cut they say “In these days of manufacturing decline in the UK we are proud to have been producing T-Cut in Bury, Lancashire since 1954 and will continue this tradition for generations to come to ensure we are very much a part of British Heritage and history. Tetrosyl is a Private and UK owned company.” On their main website they tell us “Tetrosyl’s bulk manufacturing operations are based in Greater Manchester. Bridge Hall and Bevis Green sites cover over 70,000 square meters of production space and the combined sites produce over 2500 product lines and over 61 million units of production continually per annum.” What is not clear is what their mix of British and foreign made products is. 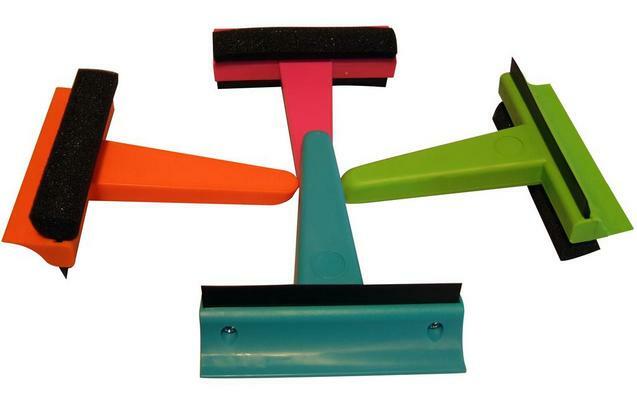 For example the ‘Carplan Compact Easy Grip Ice Scraper & Squeegee’ I looked at today (20/1/17) had no country of origin information on the product itself or the packaging and generally country of origin information is not given on their websites. 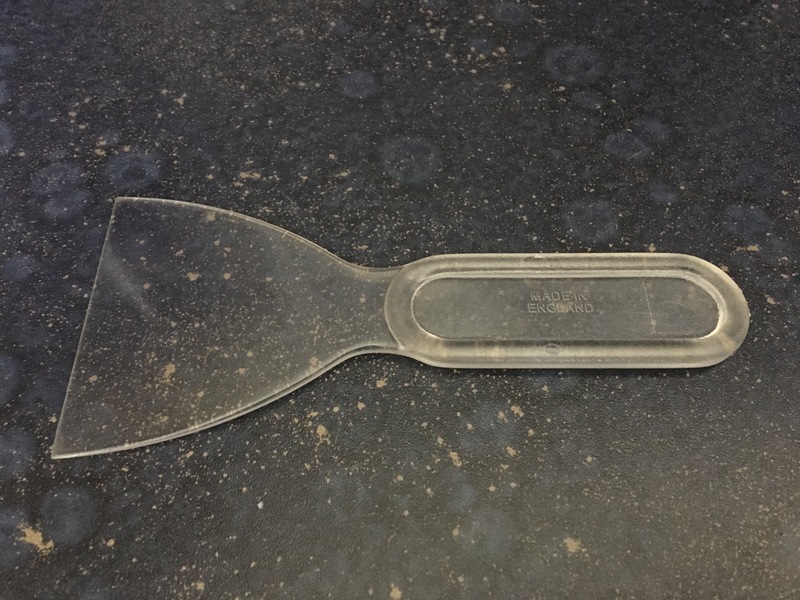 I asked about this particular product and was pleased to hear “Yes I can confirm that the CarPlan Easi-Grip Ice Scraper is made in the UK.” You’ll need to ask if a particular product is still British made. Their Bluecol brand was originally founded in 1937. Bluecol antifreeze was originally developed and manufactured by Smiths Industries and the name Bluecol was registered in 1934. In 2007 Tetrosyl Group Limited purchased of the Bluecol brand. Previously the Bluecol brand has been owned by Smiths Industries (1934-1974), Lucus (1974-1994) and others since. On their website they say “Bluecol is very proud of it’s British heritage, as are Tetrosyl, and we are very pleased to say that all of Bluecols chemicals are produced right here in Bury, Northern England.” Some other Bluecol products, such as some of their ice scrapers, are made in the UK but no country of origin information is given against individual products on their website so you’ll have to ask about country of origin or look at the products themselves. 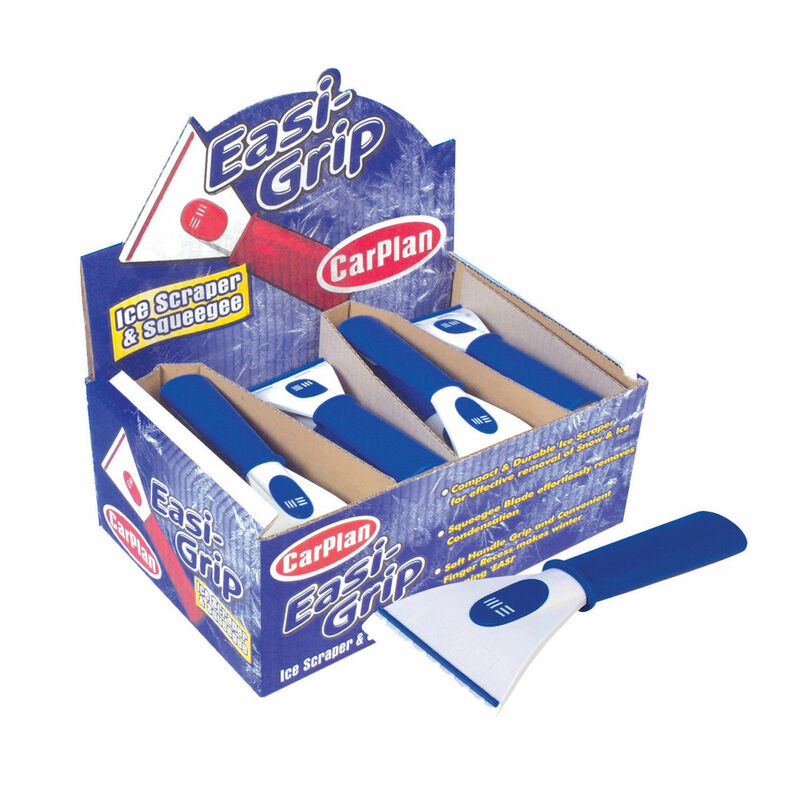 The CarPlan small Easi-Grip Ice Scraper is made in the UK (as of January 2017). 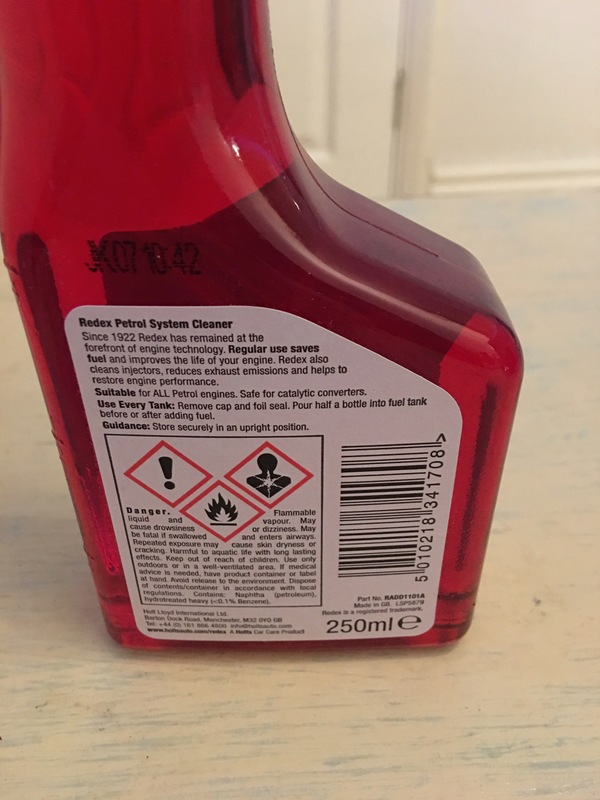 This product is not labelled as made in the UK and place of manufacture may change. 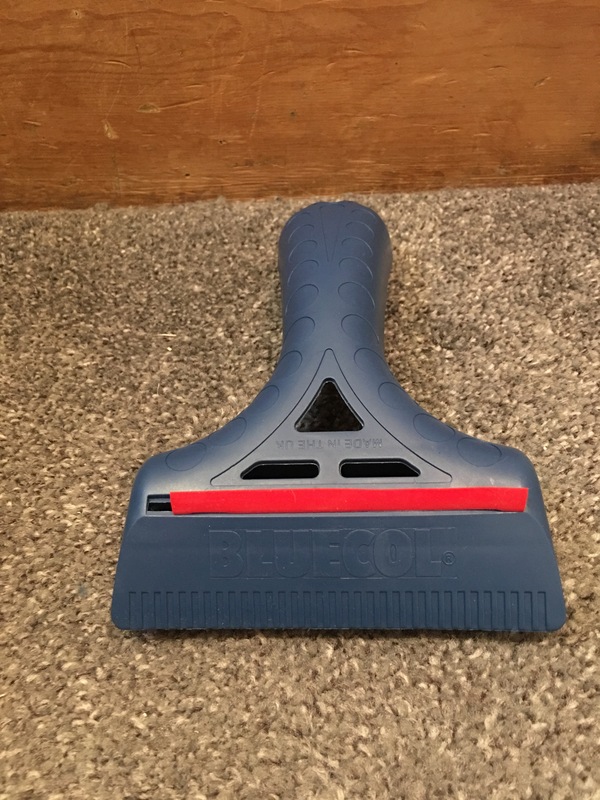 Halfords value HIS040 Ice Scraper, Squeegee & Sponge is currently made within the UK (as of November 2017) by Tetrosyl. 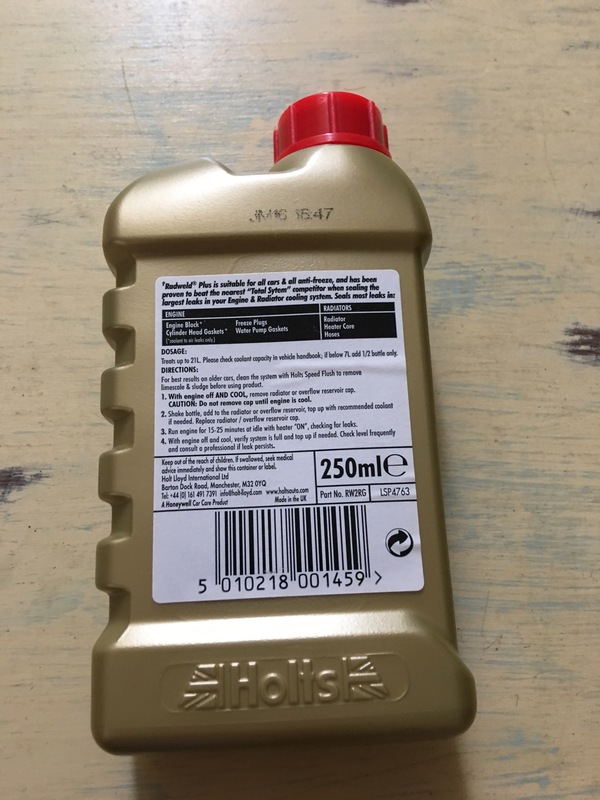 This product is not labelled as made in the UK and place of manufacture may change. Halfords have been around since 1892. 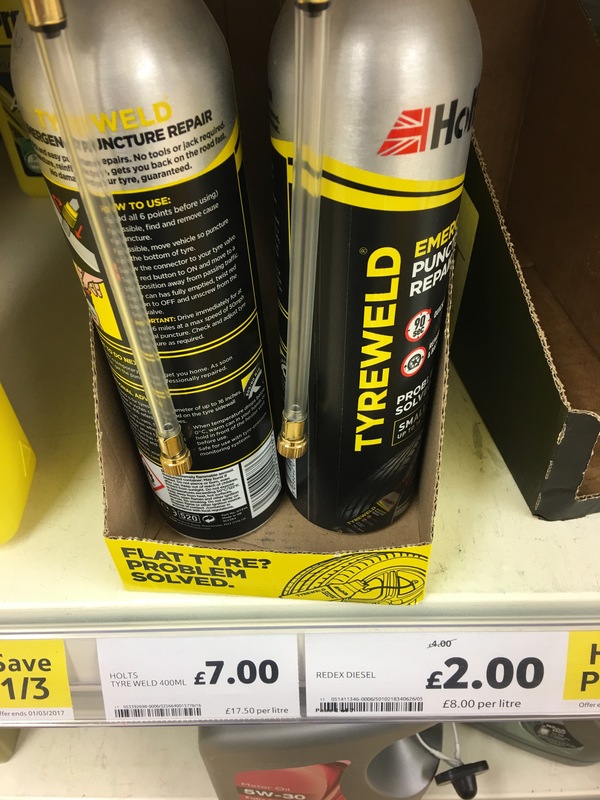 Very little sold in Halfords these days is British made but you may find a few items that still are. 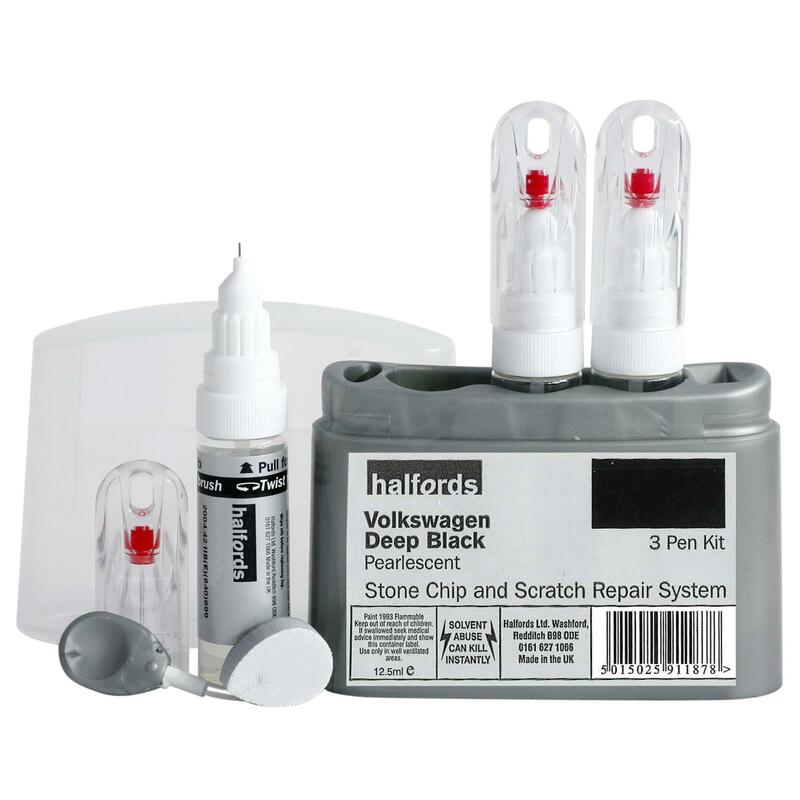 Halfords Halfords Volkswagen Deep Black Scratch & Chip Repair Kit. Made in the UK. Proops small 3″ Robust Car Windscreen Ice and Snow Scraper (X8116). Made in England. 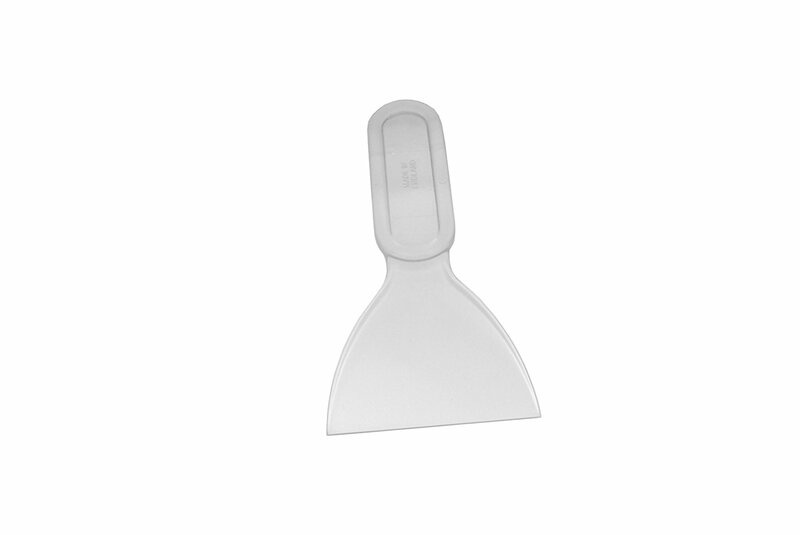 The scraper part of the tool is 3″ in length and 3″ wide at the widest point. 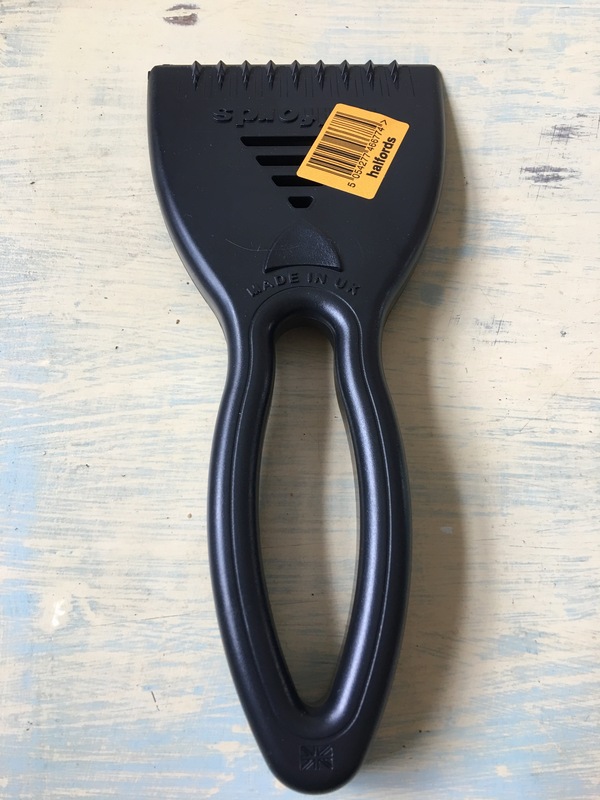 The length of the handle is 3.5″ and the width is 1.3″. Overall length is 6.5″. This product is clearly marked “Made in England”. Proops small 3″ Robust Car Windscreen Ice and Snow Scraper (X8116). Made in England. 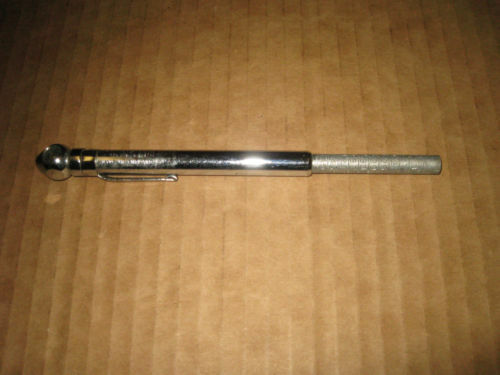 The scraper part of the tool is 3″ in length and 3″ wide at the widest point. The length of the handle is 3.5″ and the width is 1.3″. Overall length is 6.5″. This product is clearly marked “Made in England”. Photographed by author 3 November 2017 (1). Cooper Tire & Rubber Company (who also own former British tyre company Avon Tyres since 1997) have a tyre factory (the former Avon Tyres factory) in Melksham. The former American company Cooper Tires was taken over by Indian firm Apollo Tyres in 2013. They produce motor vehicle tyres. French company Michelin also produce motor vehicle tyres in the UK. 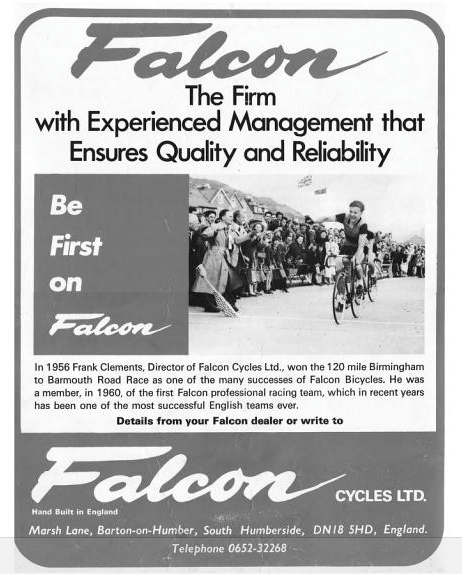 Michelin closed their bicycle tyre factory (the last one left in the UK) in Stoke-on-Trent in the 1980s. Michelin manufacture bus and tractor tyres in their Ballymena factory, car tyres in their Dundee factory, and retread truck tyres in their Stoke-on-Trent factory. In November 2018 French tyre maker Michelin announced it is closing its Dundee factory, which specialises in smaller tyres for cars, with the loss of 845 jobs. Production came to a halt at Michelin Ballymena in Northern Ireland, following Michelin’s announced closure of the factory’s in April 2018. American company Goodyear Dunlop (EMEA) currently retread tyres in their Wolverhampton factory but announced in June 2015 that the factory is to close. 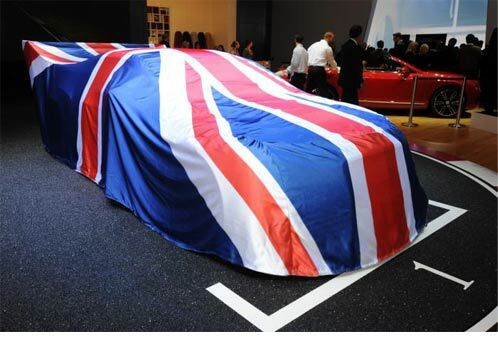 Specialised Covers / L&S Prints Union Flag car cover for Bentley. Made in England. Flagmakers is Britain’s oldest flag maker and a trading name of George Tutill, Able Flags and Turtle and Pearce, making flags, flagpoles, banners and bunting. Also, flag hire. Part of the Specialised Canvas Group. ‘Flagmakers’ still manufacture in the UK and have an ethical sourcing policy. I asked the company about the origin of their products and got this response: “We sew our flags here in Chesham and print at our parent company in Chesterfield. We also have an overflow printing partner in Germany. We purchase most of our material within the UK however some specialist silks are not stocked here and we have to go abroad for them. Our wood products for table flags, bases etc are sourced from a local carpenter here in Chesham.” You can see some examples of their flags here. Also part of the Specialised Canvas Group are: JMS Flagpoles who make flagpoles in the UK, make cafe windbreaks in the UK (available at www.cafe-windbreaks.co.uk) and supply flags; Banner Box who make banners in the UK; Proflight Bags who make custom bags, emergency bags, industrial bags and covers in the UK; Specialised Canvas Services who manufacture canvas sheets and covers in the UK, including awning repairs and re-sizing, cover repairs, industrial covers, equipment covers, market stall covers, bespoke canopies, groundsheets, tent repairs, shade sails, and transport covers; Porters flags who make flags in the UK; www.flag-pole.co.uk who make flagpoles and graphic display systems in the UK. Check where the Specialised Canvas group product you want will be made – as they state above some production is outsourced for example to Germany. 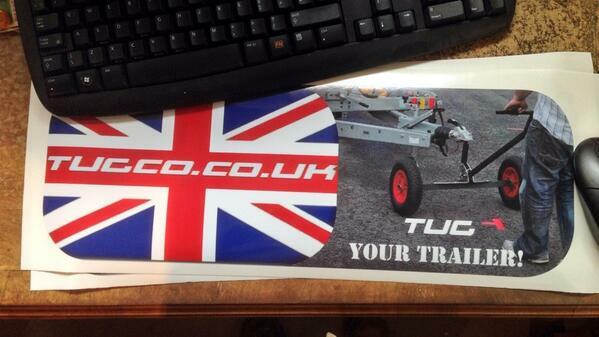 http://www.flags-flagpoles-banners.co.uk – a site featuring Specialised Canvas group products generally. Montrose Rope and Sail Company Ltd, founded in 1789, make tarpaulin covers and under their Montrose Bag Company name, bags. Their industrial covers and tarpaulins, domestic covers and tarpaulins, oil and gas covers, and specialised covers are made in Scotland. Products include agricultural covers, vehicle covers, industrial curtains, lorry curtains, machine covers, market stall covers, shop canopies, silo covers, trailer covers, work store covers, trailer covers, yurts, speaker covers, boat covers, boot liners, awnings, trampoline covers, oil and gas industry covers, caravan awnings, tractor cover, etc all of which appear to be British made. The Montrose Bag Company make rucksacks, holdalls, travel bags, tote bags, motorcycle wheel bags, messenger bags, tablet pouches, game bags, tool pouches, grab bags, etc in durable PVC and they all appear to be British made. Trade or retail. Their bags can be purchased from their website or are available to buy from their reception in Montrose in Scotland. They will also personalise bags with a badge of your choice and will make bespoke bags. Burlen Ltd make vintage and classic vehicle fuel systems and associated spares. They are based in Salisbury. They do not say on their website whether any manufacturing takes place in the UK, but it might be worth asking if you are in the market for SU carburettors, fuel pumps and spares, Amal carburettors and spares, Zenith, Stromberg and Solex Carburettors and Spares, or Stay Up floats for vintage and classic cars and motorcycles. A vintage PCL tyre gauge No.1. 6-50 LBS. Made in England by Pneumatic Components LTD.
“Caravanning remains a British manufacturing success story: over 95% of touring and holiday caravans in the UK are made here and approximately 60% in the case of motorhomes. In addition, 100% of residential park homes are made in UK” according to the NCC (National Caravan Club) in an (undated but possibly written in 2011) article on a site called politics.co.uk. That said many caravan makers have gone bust in recent years and many have been purchased by foreign owners who are likely to close down the British factories in time. Bailey caravans is another major player in the industry, founded in 1948, and they have a factory in Bristol. They make caravans, motor homes (using foreign made vans as the base) and static caravans. Again, no specific country of origin information is given on their website. Fifth Wheel and Inos caravans are built in the UK too. Fifth Wheel, founded in 2002, own Inos, founded in 2011, and both brands are built in their factory in Rhuallt, North Wales. Both the Fifth Wheel and the Inos websites have the words “British Built” at the top of their webpages. Fifth Wheel make Fifth Wheeler caravans that I presume require a pick-up truck, like a Toyota Hilux, to tow them. Inos make caravans with standard tow bars. Both Fifth Wheel and Inos caravans have twin axles and a slide out section. New and used Fifth Wheel and Inos caravans are sold by both companies. RS Motorhomes are made in the UK (using a foreign made truck or van as a starting point). It says on their website that you can visit their factory and see your motorhome being built. Auto-Sleepers make their motorhomes in the Cotswolds, England, converting foreign made vans from Mercedes, Peugeot or Volkswagen into motorhomes. They say on their about us page “Auto-Sleepers has over 54 years experience in meeting the needs of customers who are looking for the best in British-built motorhomes” and their brochures are marked with the words “made in Great Britain”. Auto-Sleepers are now Italian owned. Auto-Trail say on their website that “one motorhome in three sold in the UK” is “built at our Grimsby manufacturing plant”. Auto-Trail motorhomes are build around Italian Fiat chassis and are now part of the French Trigano Group. Lunar caravans do not give any information about country of origin on their website, but I think they may be made in England in Preston, Lancashire – best check before buying. They also make motor-homes on Renault or Mercedes chassis. Diddyvans camping trailers – “A teardrop trailer hand-built in Basingstoke, Hampshire” – a British built tiny trailer you can sleep in (the chassis is purpose built by AL-KO and presumably foreign made); for sale or hire”. Teardrop trailers can be towed by smaller vehicles and accommodation is normally basic with a double bed covering the entire floor and there is normally no onboard toilet. Roma Caravans Limited is the UK’s premier manufacturer of hand built, custom caravans” according to their twitter which says they are based in Bedfordshire, whilst on their website they say “…99% of the caravan is built by hand by our dedicated team of caravan builders in our Hertfordshire based factory”. Coachman Caravans, founded in 1986, have their factory in Hull. Coachman make single and twin axle caravans in a variety of sizes and layouts, including a centre washroom and rear inline fixed island bed layout in all their ranges. 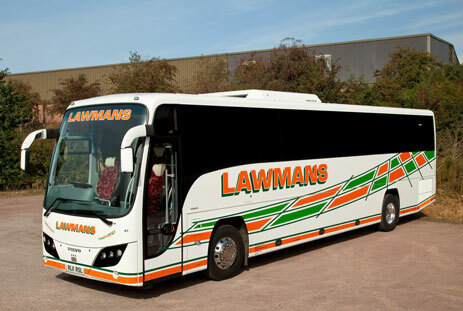 Their Facebook page says they have an “…obsessive attention to detail, combined with the very best of British craftsmanship…” From 1997 until 2001 Coachman was part of Explorer Group Limited but is currently an independent company. The Explorer Group Ltd was purchased by German company the Erwin Hymer Group in 2017 and now operate as Erwin Hymer Group UK Ltd trading under the Elddis name. They say on their website “Our heritage stretches back to 1964 and today Elddis, Compass, Xplore and Buccaneer touring caravans and Elddis motorhomes are still produced in Consett, County Durham”. Their range includes single and twin axle caravans and motorhomes on French Peugeot chassis. Vantage Motorhomes have their factory in Leeds and produce van conversion motorhomes based around French Peugeot vans. To help you buy a British made caravan the following are foreign caravan and motorhome manufacturers selling in the UK that I know of – Hobby (Germany), Fendt (Germany). Erwin Hymer Group (Germany), Airstream (USA), Adria (Slovenia), Caravelair (France), Dethleffs (Germany – part of Hymer), Geist (Germany – defunct), LMC (Germany – part of Hymer), Knaus and T@B (Germany), Sterckeman (France), TEC (Germany – part of Hymer), Eriba (Germany – part of Hymer), Freedom (Poland). You’ll occasionally see imported Japanese camper vans and motorhomes in Britain, such as converted Toyota Hiace vans. Collectively these are sometimes referred to as Bongo from Japan. These small van conversions arrive second hand from Japan where tax advantages are given if you sell your van for export after just three years. Based on the Mazda Bongo (or similar vans) and right hand drive, they can offer excellent value for money. Some have four wheel drive and clever touches like electrically-powered lifting roofs. These are available for example from Direct Campers in Kilmarnock in Scotland or Clearcut Conversions in Barnstaple, Devon who do conversions and partial conversions of panel vans. The German Volkswagen (VW) T2 was a popular small campervan in the UK, first made in 1950, and is often associated with hippies. It was produced in Germany and the UK, as well as in South Africa, Mexico and Brazil. Production in the UK stopped in 1967 but continued in South America. Production ended completely when the Brazil factory closed at the end of 2013. Volkswagen never themselves made a T2 camper – they have only ever sold the ‘Type 2’ as vans which are then outfitted by coachbuilders around the world. The original vans were called Type 2, following on from Volkswagen’s first offering the Type 1, better known as the Beetle. Volkswagen now make slightly larger campervans, presumably in Germany, although unlike the old T2 things like the toilet are missing in many of the modern Volkswagen campervans. Volkswagen is a German automaker founded in 1937 by the German Labour Front under Adolf Hitler. They are now one of the world’s largest motor manufacturers. The VW beetle bore a strong resemblance to the contemporary Tatra 97, produced at that time by Tatra in what was then Czechoslovakia. Post-war, from 1945-1948, the Volkswagen factory in Germany was controlled by the British military, who re-started Beetle production, initially supplying vehicles for the British military. There was apparently talk of dismantling the factory and shipping the equipment to Britain and of giving the factory to a Allies manufacturer but no-one thought the Beetle any good it seems! The British Rootes Group for example said the car was uneconomical. In an ironic twist of fate, Volkswagen manufactured a locally built version of Rootes’s Hillman Avenger in Argentina in the 1980s, long after Rootes had gone bankrupt at the hands of Chrysler in 1978—the Beetle outliving the Avenger by over 30 years. The last German built old style Beatle was produced in the 1970s. The last original Beetle was produced in 2003 in Mexico. A new style Beetle was made from 1998-2018 and the last Beatle special edition Beatle is to be made at their Mexico in 2019. There are a couple of short histories of caravanning here and here. During the early 1980’s a number of well known caravan makers such as Stirling, Royale, Churchill, Thompson, Avondale (Avondale Coachcraft Ltd of Atherstone, Warwickshire; they closed down a bit later in 2008) and Caravan International (CI) Group closed down. Caravan International had taken over brands such as Eccles, Bluebird, ACE, Abbey, Bessacar, Elite, Europa and Sprite. The Cosalt company from Hull, bought out parts of the company, choose to keep the CI brand but renamed it Cosalt International. The touring caravan business was sold to Swift Leisure in 1994 and Cosalt continued to manufacture static caravans until they went bankrupt in 2013. Astral Caravans also went bankrupt in 1980 and was acquired by Bessacar and hence Cosalt. Quite how much of a caravan or motorhome might be made in the UK I don’t know. There may be other caravan and motorhome makers in the UK, but I don’t know. 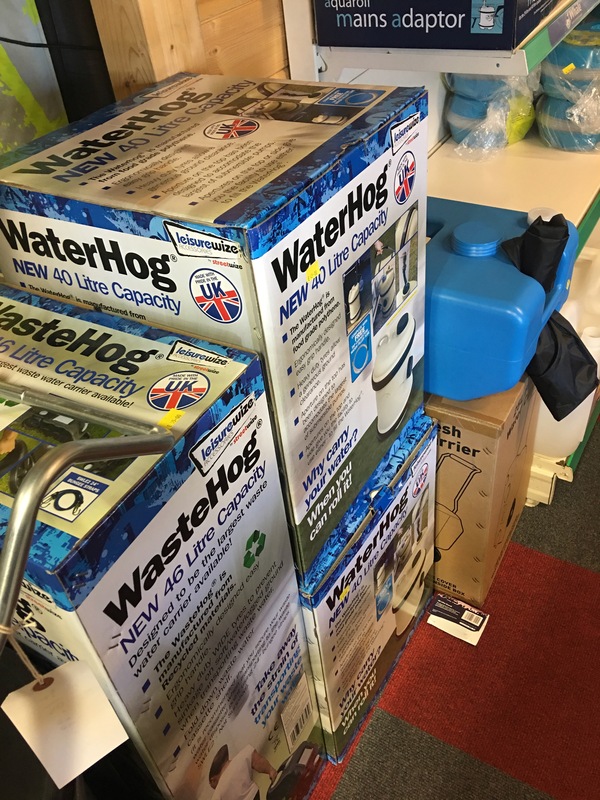 Leisurewize Accessories by Streetwize sell their own branded Waterhog (water carrier) and Wastehog (waste water carrier) which are both made in the UK. Photographed by author at Longacres Garden Centre (formerly Thompsons) Shepperton 6 May 2018. There are still many other companies out their who make in the UK parts for the motor industry too. 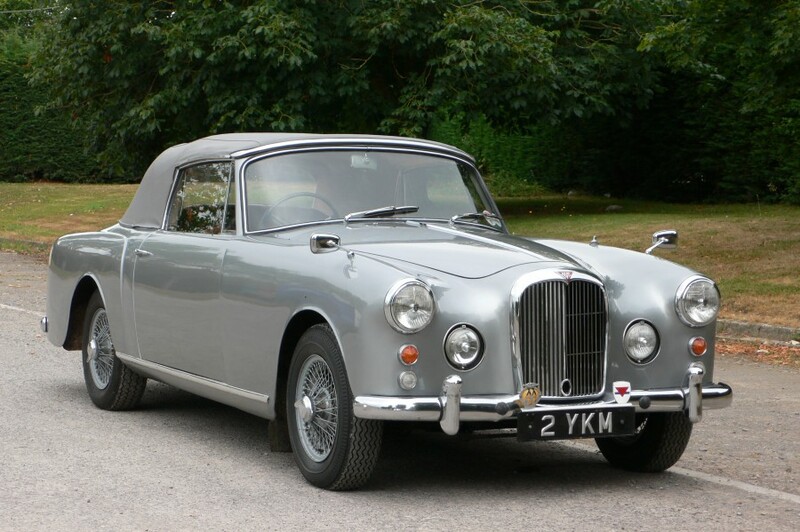 A 1963 Alvis TD21 Series II Drophead Coupe. 1955. The Duke of Edinburgh drives to the European Horse Trials with the Queen and the Duke and Duchess of Gloucester in a Land Rover. April 2016. 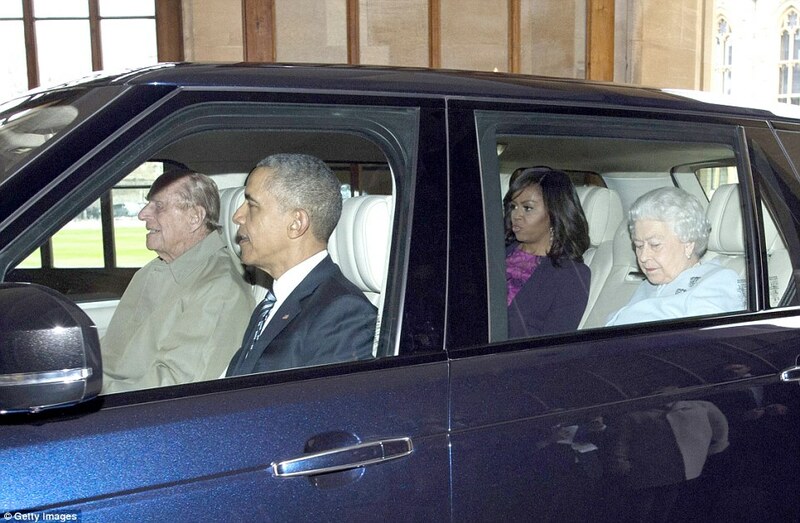 Prince Philip drives the Obamas and the Queen to Windsor Castle for lunch after greeting them at their helicopter. They are in a Range Rover. 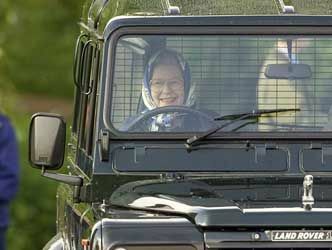 Queen Elizabeth in her Land Rover. Undated but 2012 or before. There’s a good history of Yorkshire car maker Jowlett on the I’m from Yorkshire website. Jowlett’s ceased car production in 1954. Jowett continued making parts for their cars at another site on Howden Clough Road in Morley until 1963 and aircraft fittings in another part of the county. This entry was posted in Bikes, Caravans and Motorhomes, Cars, Motor Vehicles, Motorbikes, Vehicles and tagged AA, ABI, AC Cars, Ace, Ace Cafe, Agusta Westland, Airlander, Alloy Bodies Manchester, Alvis, Ambassador Car Mats, AMG Engineering, Ariel Motor Company Ltd, Ascenta, Austin Rover, Auto-Trail, Autoglym, automobiles, Autorack, Autostyle, Avon Tyres, BAE, Bailey, Bailey Caravans, Bamby Cars, Barefoot Caravans, Bilbo’s, Bluecol, BMC, boats, Bowler Motorsports, Bradshaw Electric Vehicles, Brightkidz, Bristol Cars, British Leyland, British made Campers, British made caravans, British made cars, British made lorries, British made motor oil, British made motorbikes, British made vans, British Motor Corporation, Britten-Norman, buses, Caerbont Automotive Instruments, CAI, Car and Van Mats, Carapod, Caravans and Motorhomes, Carousel, cars, Caterham Cars, CCM, CCM Motorcycles, Classic Leather Fobs, Clews Competition Machines, Clocks for Cars, coaches, Coachman, Comma, Cooper Tires, Cooper Tyes, Cunningham, Danbury Motorcaravans, David Brown, David Brown Automotive, Davida Helmets, Dawbarn, Dennis Eagle, Devon Conversions, Diddyvans, Dormobile, Elddis, F L Hitchman, Fifth Wheel, Fletcher, GBS, Ginetta, Gladstone Motorcycles, Global Vehicle Trust, Gobur, Goodyear, Graham Edwards Trailers, Great British Sports Cars, Green Marine, Hagon Products, Halfords, Haycyon, helicopters, Henshaw Inflatables Ltd, Hesketh Motorcycles, Hitachi, Holt Lloyd International, Holts, Hunwick Engineering, Ibex, ice cream vans, Ifor Williams Trailers, Inos, JCB, John Dennis Coachbuilders, Jonic, Jubilee Clips, K-Tech Suspension, Knox, L and S Prints, Leisurewize, Leyland, Lincon Batteries, Linic Plastic, London Black Taxi Cab, lorries, Métisse Motorcycles, Mclaren Automotive, MG, Michelin, Miller UK, Millers Oils, Montrose Bag Company, Montrose Rope and Sail Company, Morgan Motor Co, Morris Lubricants, Moto-Lita, motor cars, Motor Oil, motorbikes, Mutt Motorcycles, New Holland, Nitron, Noble Automotive, Norton, Nu Venture, OEM, Old Empire Motorcycles, Peel, Pennine Outdoor Leisure, planes, PLC, Plowman Brothers, Pneumatic Components Ltd, Popaloo, Portakabin, Prestone, Pro-Street Cycles, Proops, Proops Brothers, Puca, Quaife, Red Triangle, Redex, Reliant, Renntec, Rolls Royce, Roma, Romahome, RS Motorhomes, Shield Batteries, ships, Silkolene, Simoniz, Smiths, Smiths Speedos, Solo Rail Solutions, Specialised Canvas Services, Specialised Covers, Stahlkoffer, Sunseeker, Sunseeker motor yachts, Sussex Campervans, Swift, Swift Aircraft, Swift Caravans, T-Cut, tanks, Tesco, Tetrosyl, The Alvis Car Company, The Pod, The TUG, Thomas Meldrum Limited, Time4Bikes, Top Tugger, Tractor Spare Parts Ltd., trains, Transporter Engineering, Triumph, trucks, TS Composites, Tugco, Turtle Covers, TVR, UK Made, UK made cars, ukmade, Universal Reflective Door Guards, Vanmaster, vans, Vantage Motorhomes, Vern, Vertigo Covers, Watsonian Squire, Westfield Autonomous Vehicles, Westfield Sportscars, Wheelhome, Wilko, WingAWare, Zenos Cars, Zenoverland on September 26, 2012 by ukmade.